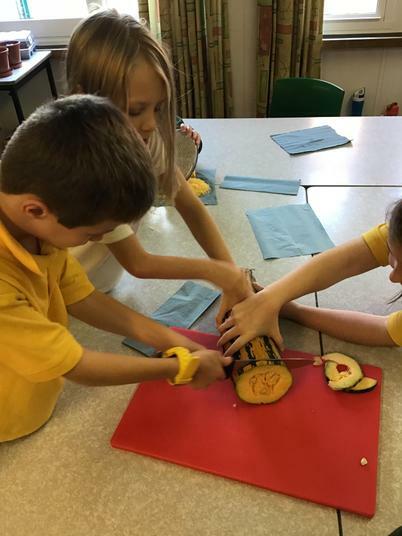 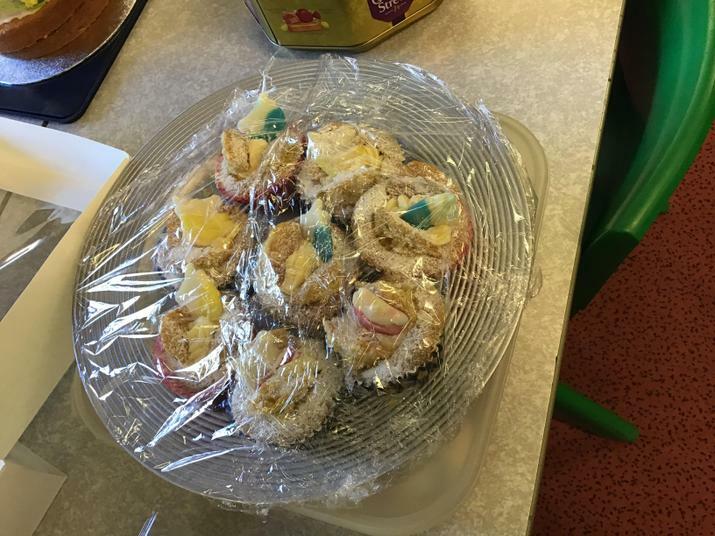 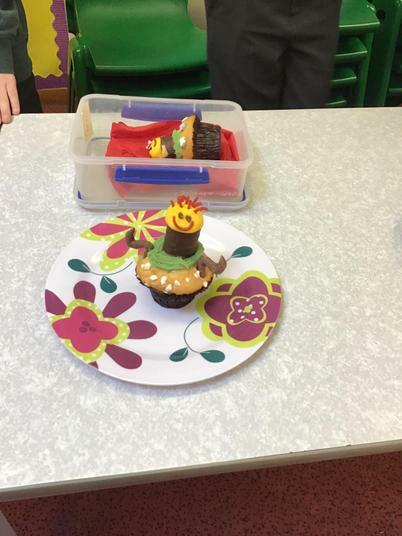 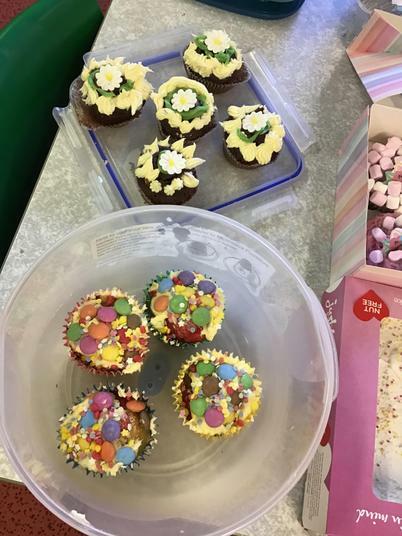 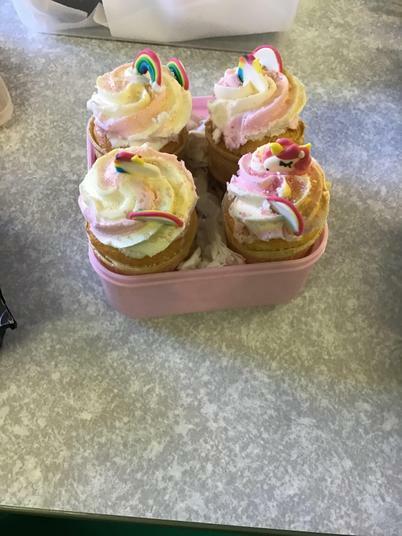 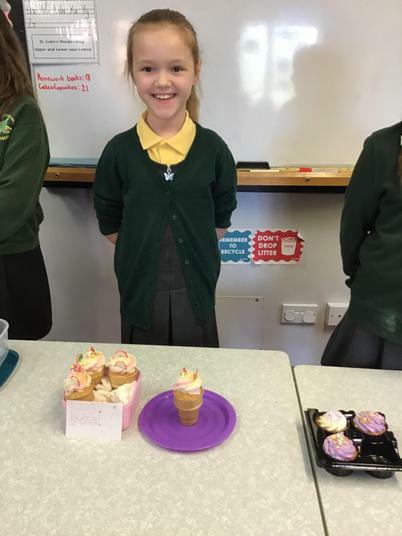 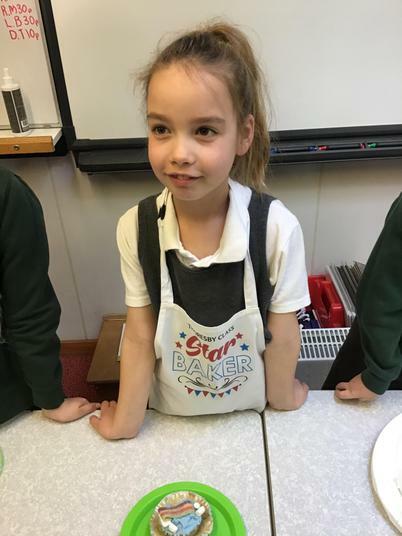 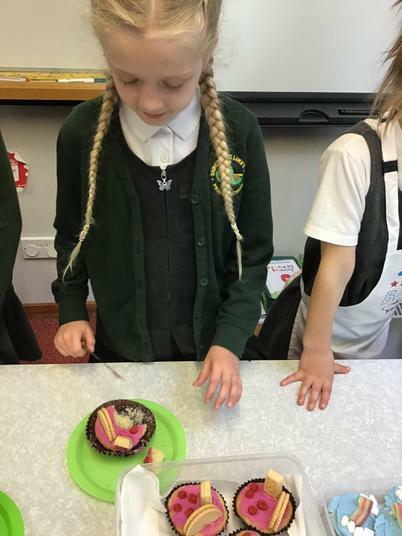 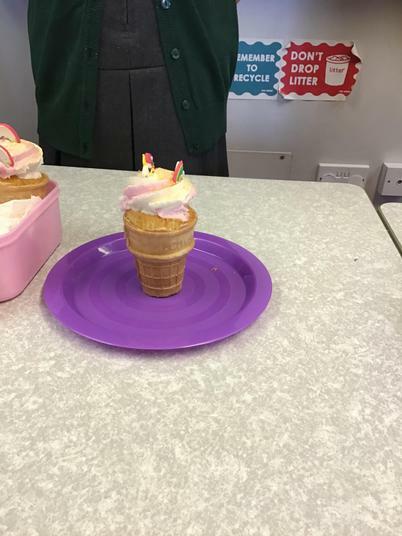 This morning the children in Thoresby Class have all taken part in our Bake Off! 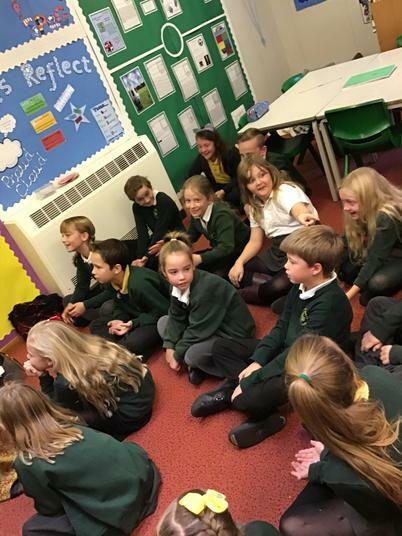 This has been a lovely chance for us all to spend some time as a class building relationships and discussing areas across the curriculum in a fun and engaging way after a really busy week rehearsing and performing. 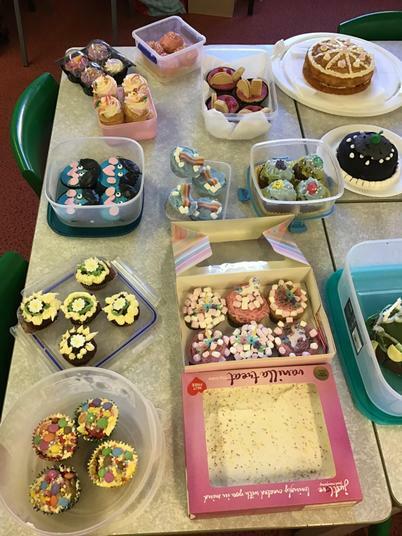 The children's bakes all look absolutely fantastic and I am so proud of them all! 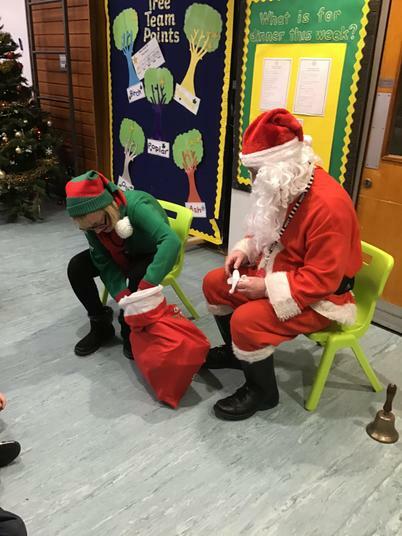 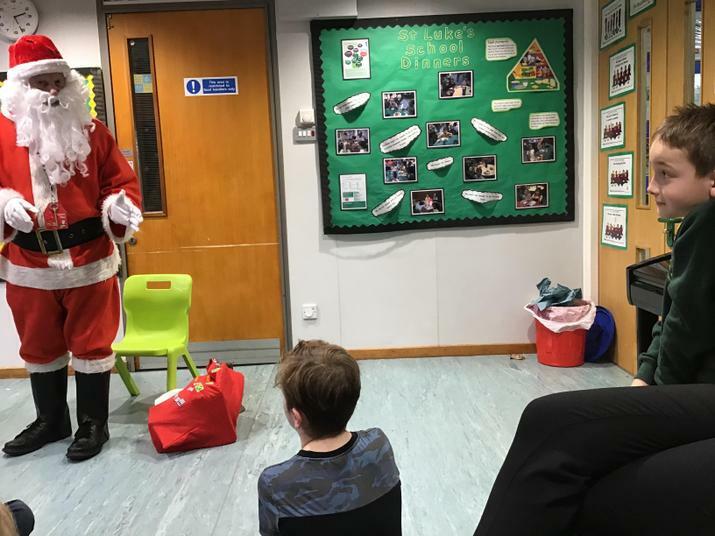 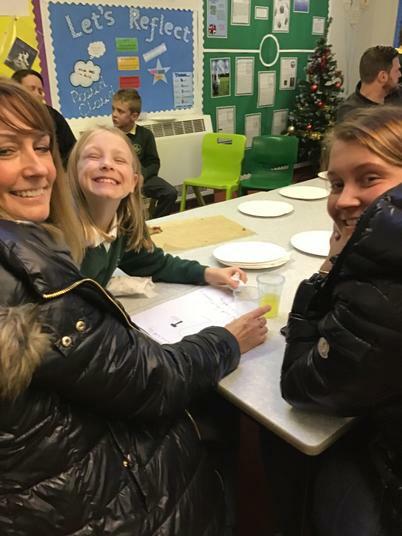 Thank you to all of the grown ups who have helped the children this week - we really do appreciate the support you give the class. 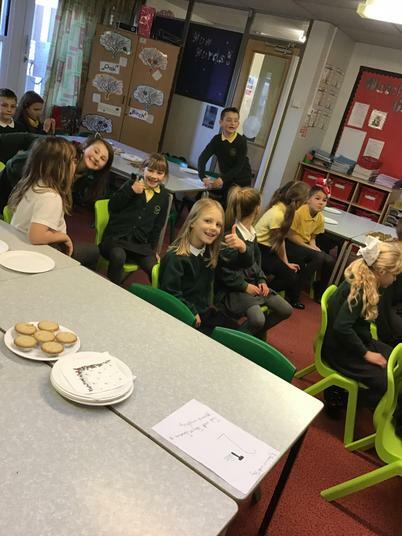 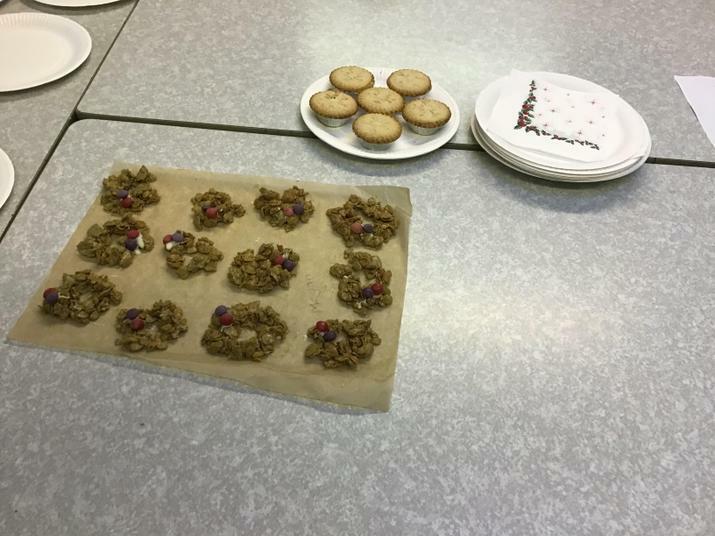 The children have loved discussing their own bakes and also sampling others! 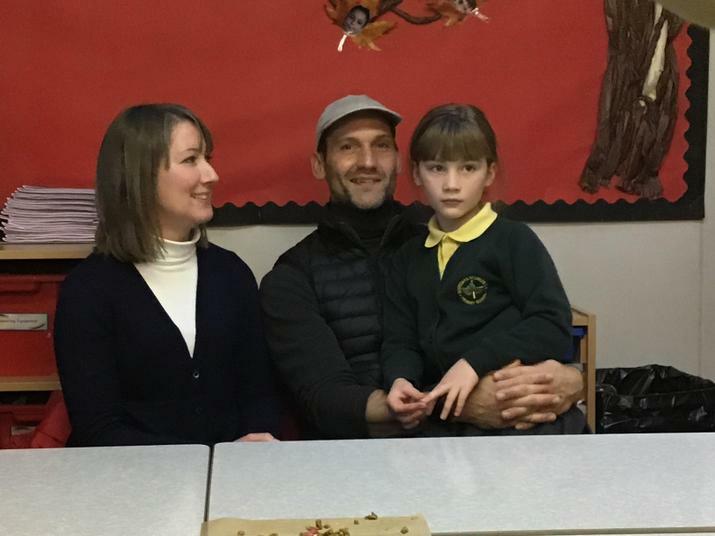 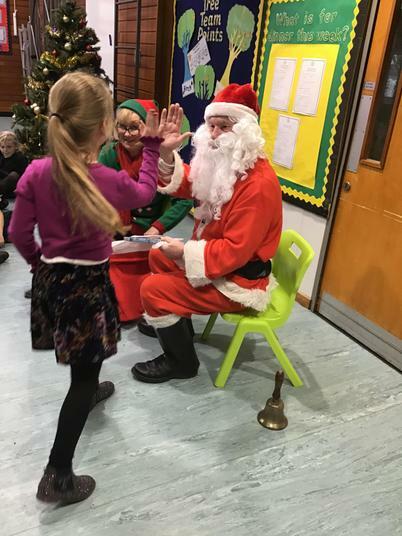 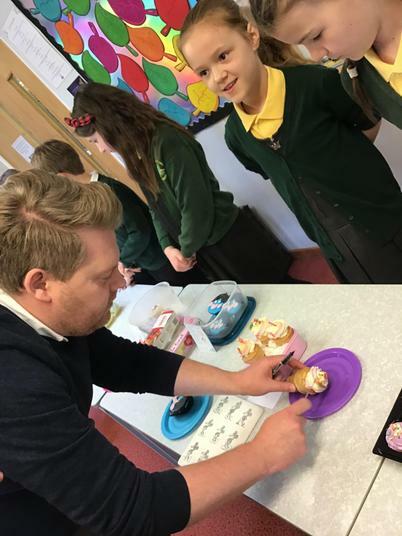 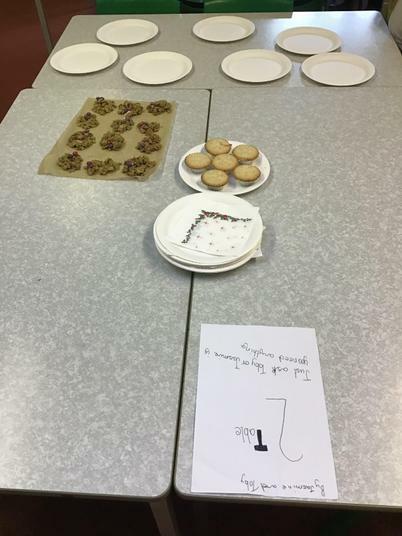 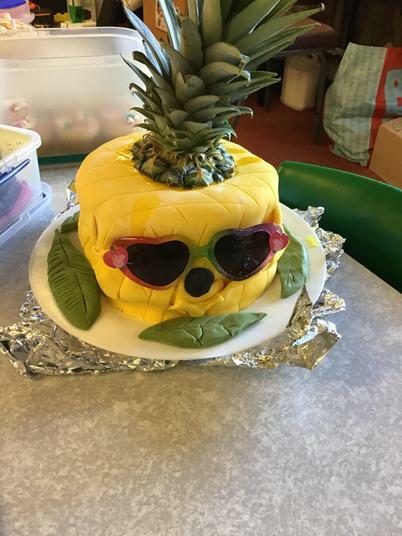 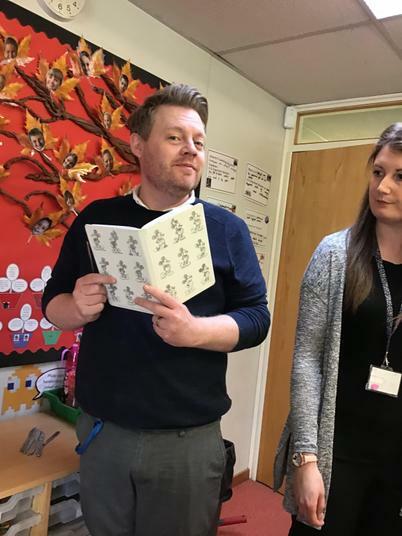 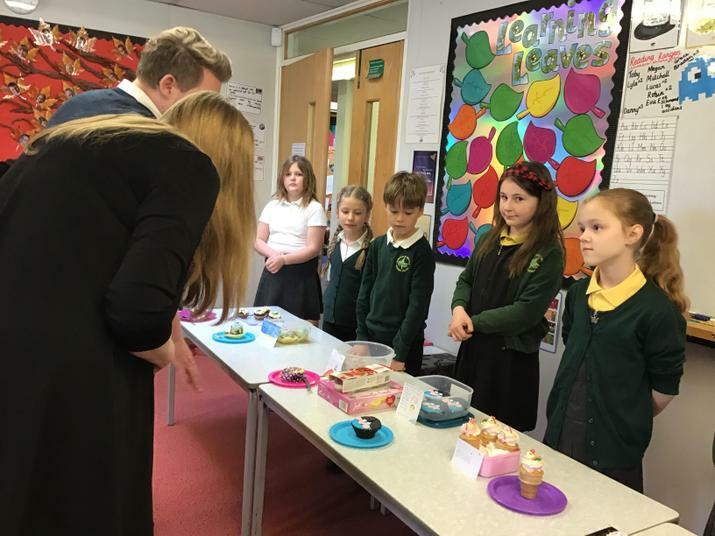 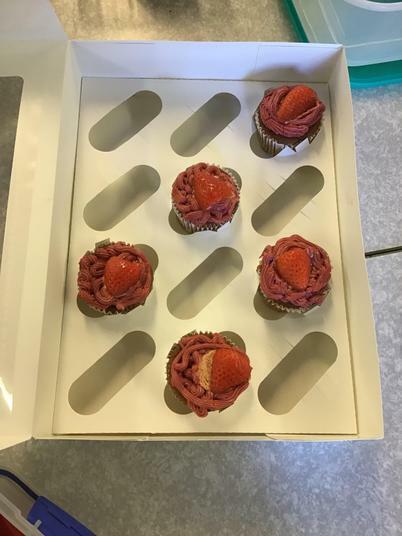 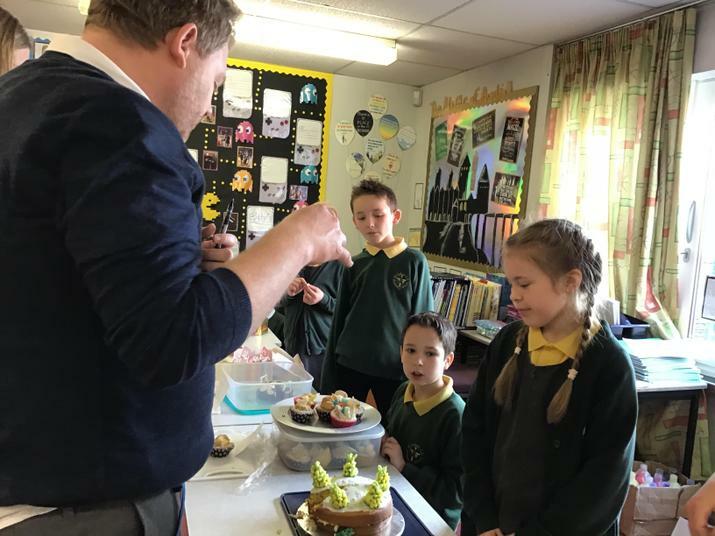 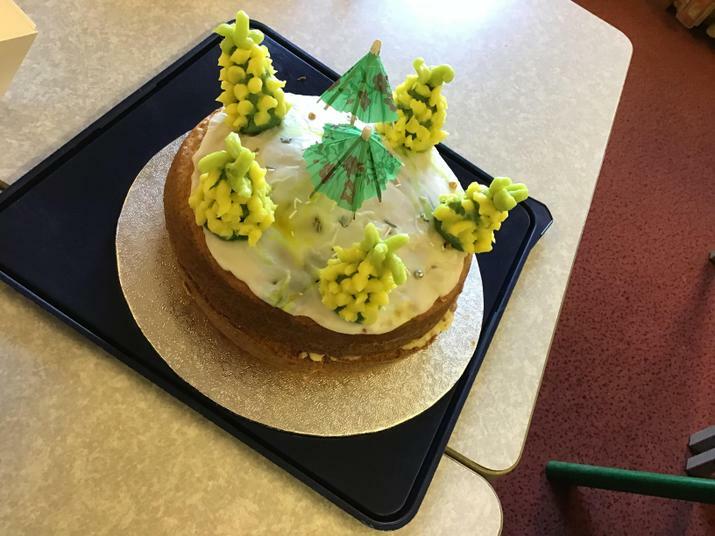 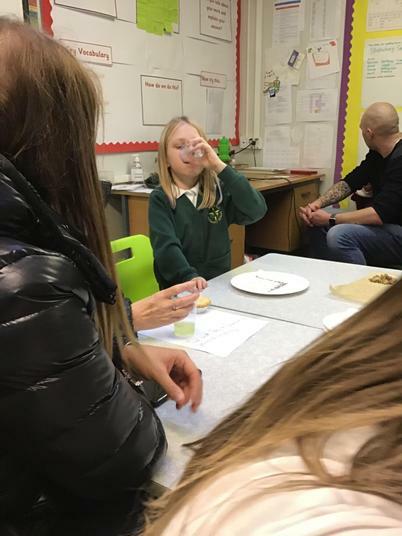 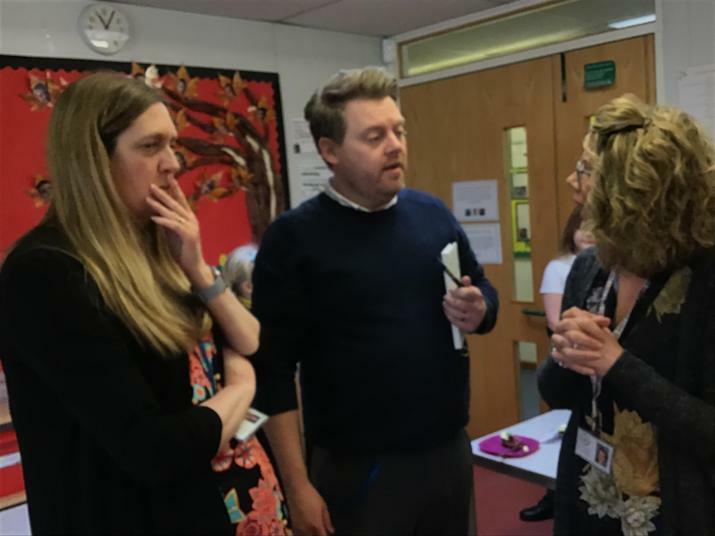 Extra thanks goes to our very own Prue and Paul, Mr Bell and Mrs Dunn, who judged the competition alongside the help of Miss Halpin and Mrs Bellamy who were excellent taste testers! 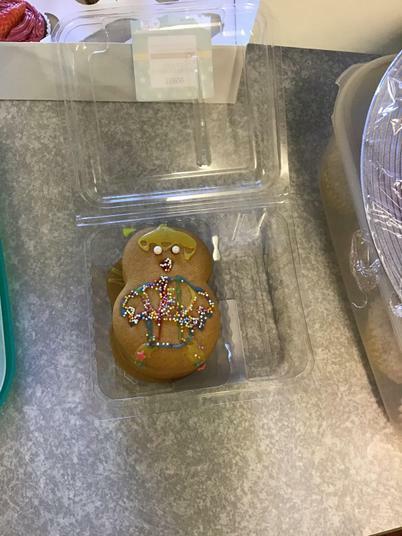 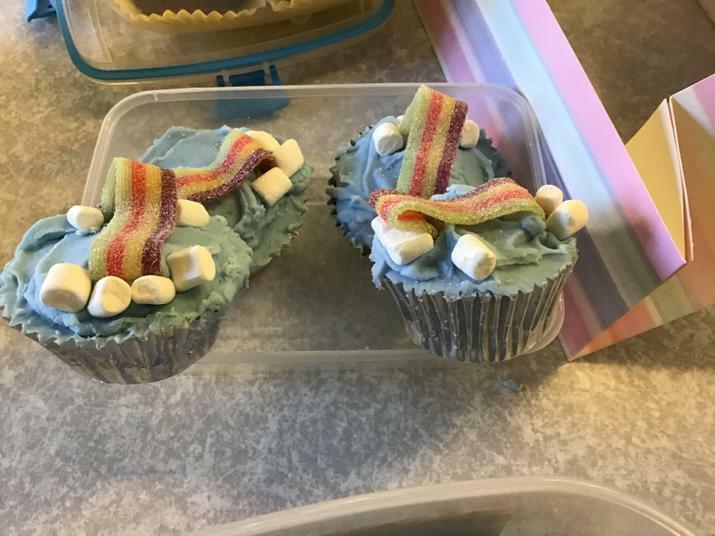 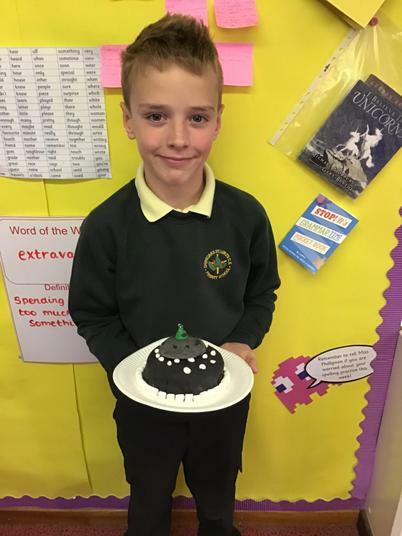 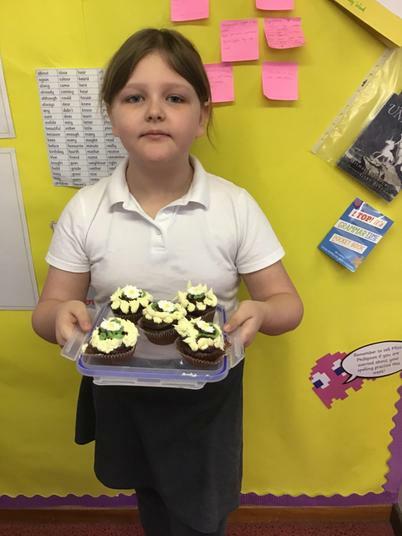 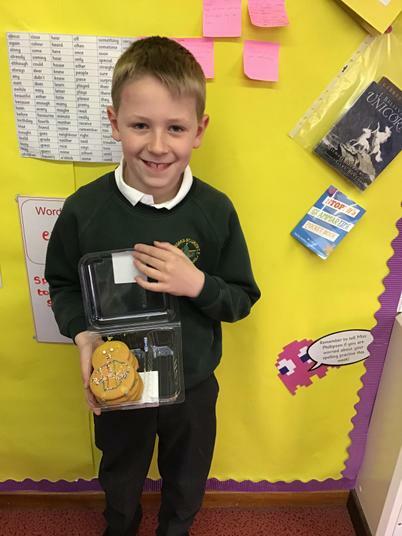 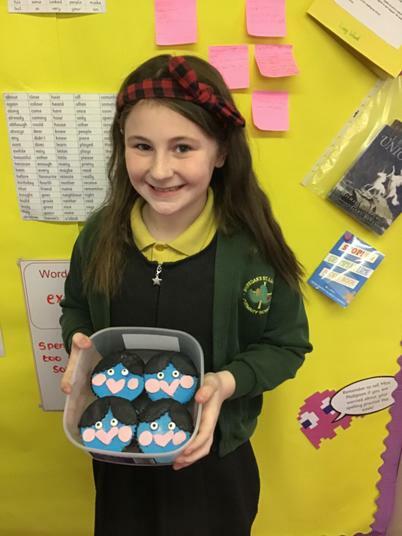 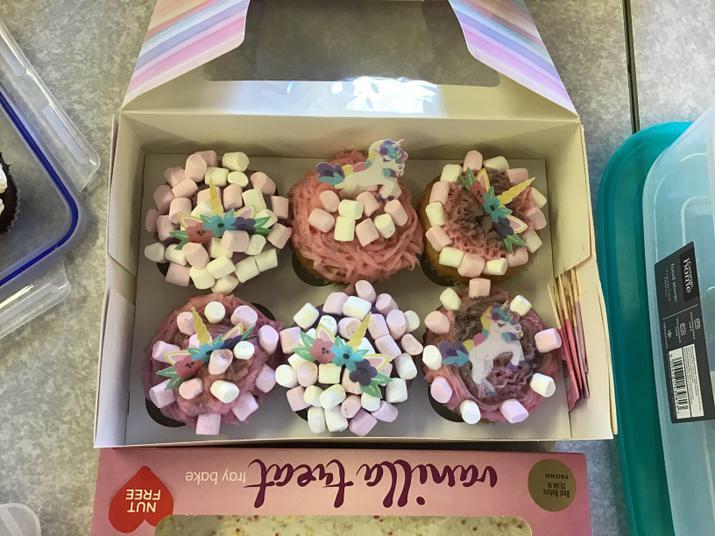 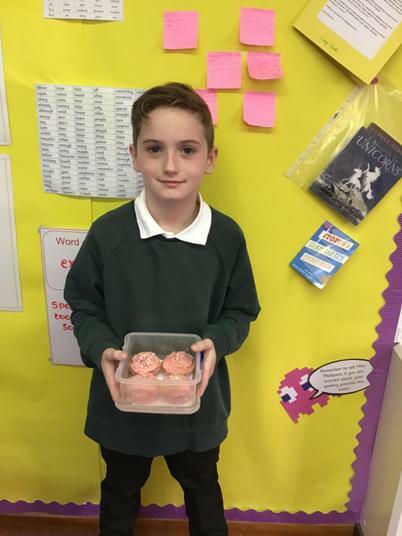 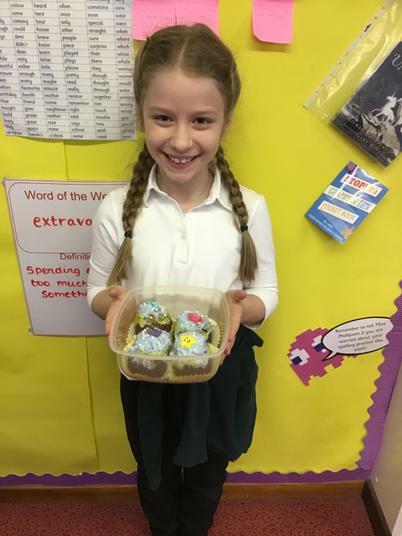 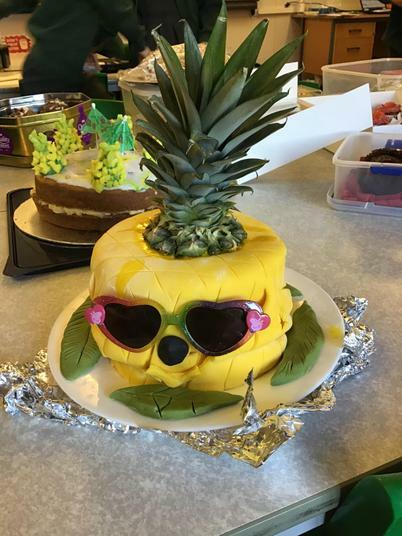 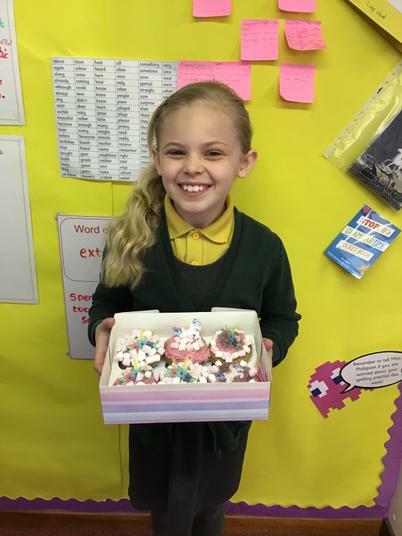 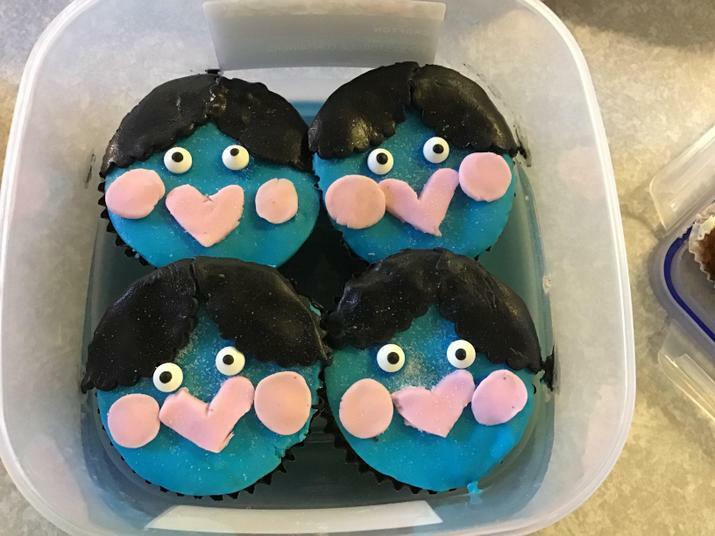 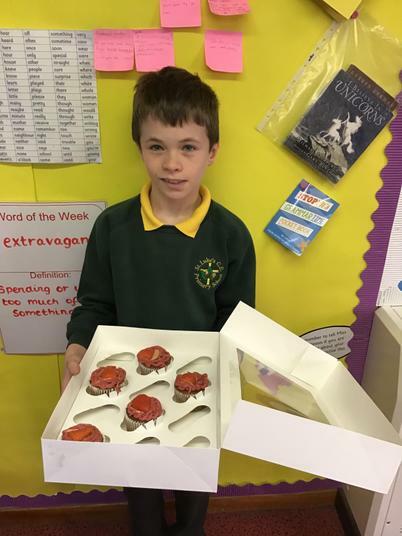 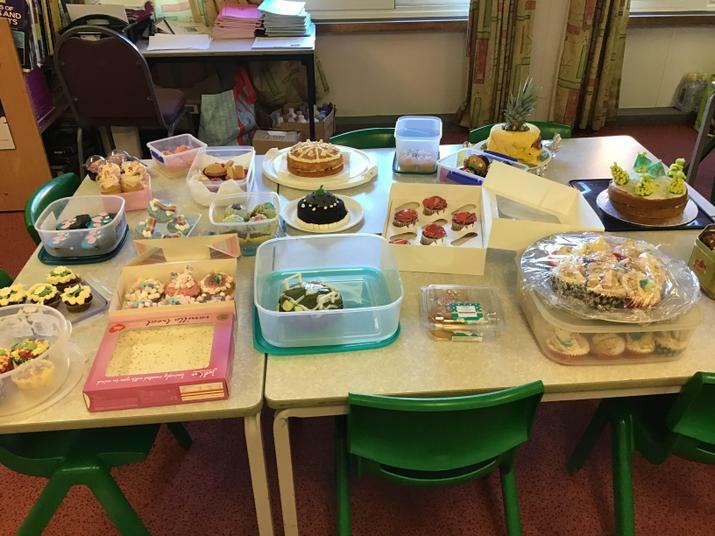 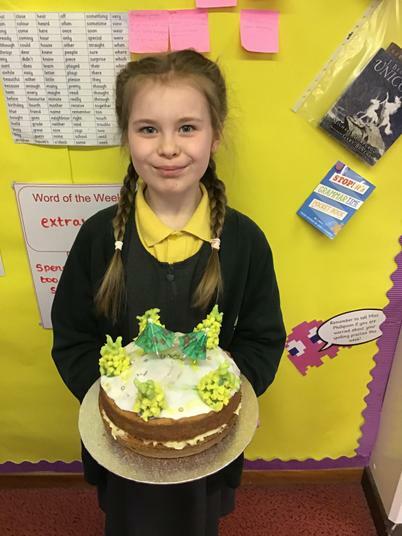 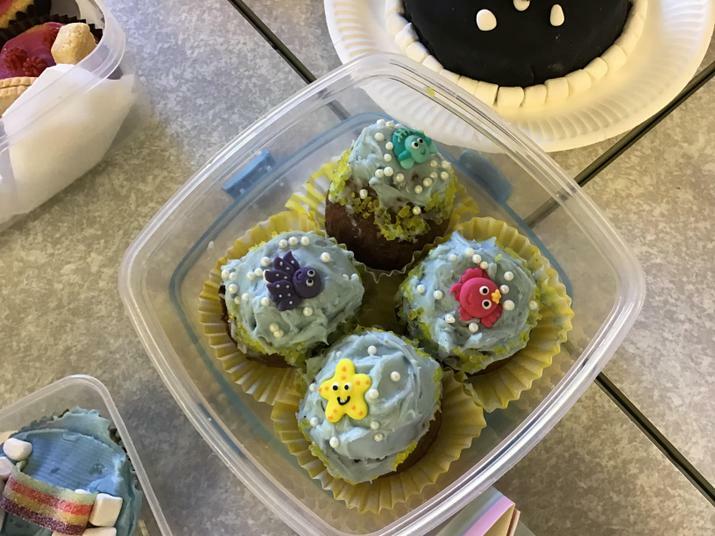 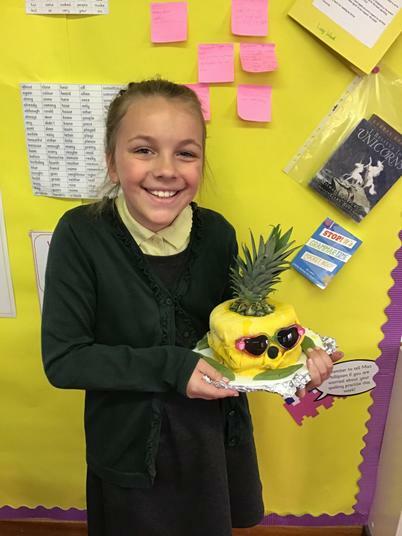 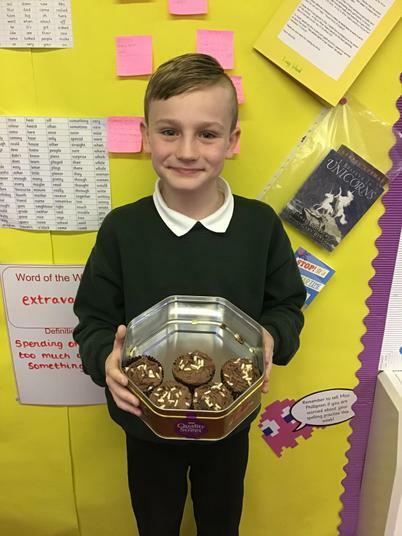 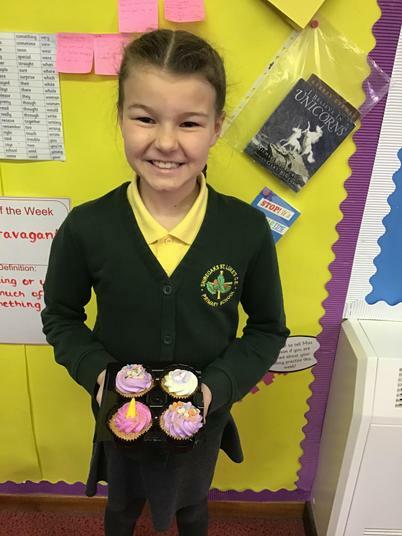 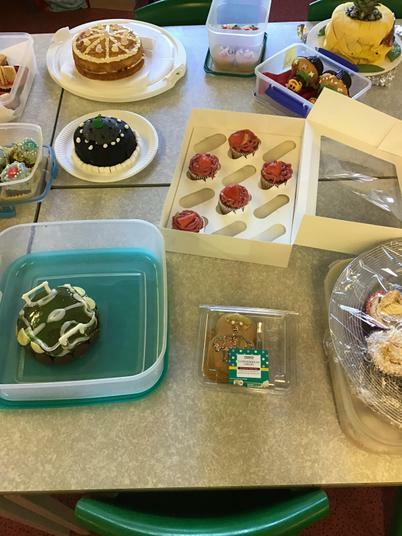 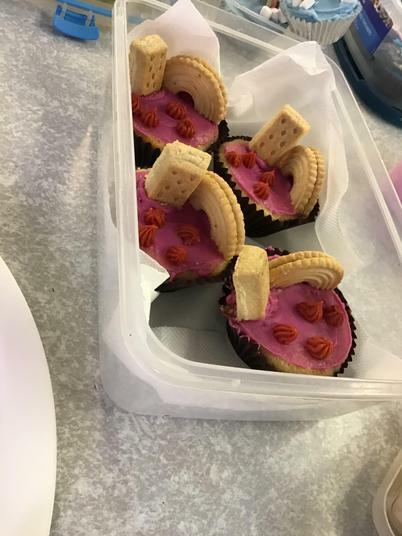 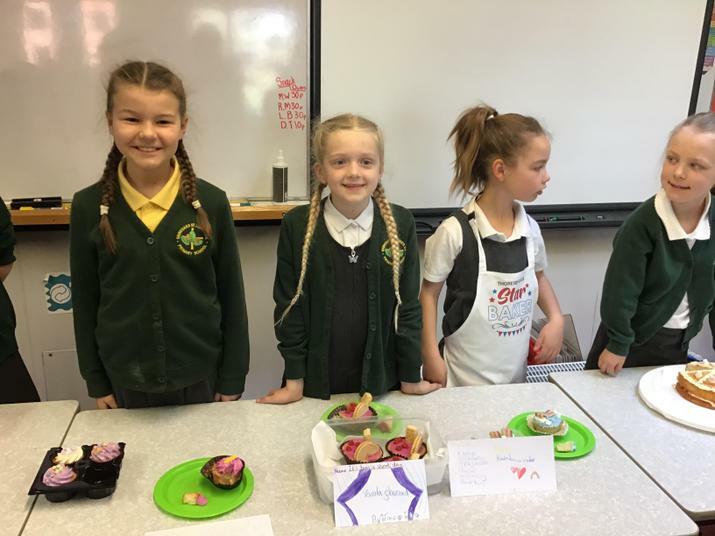 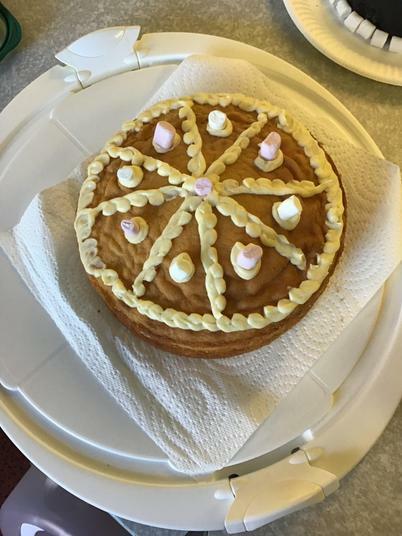 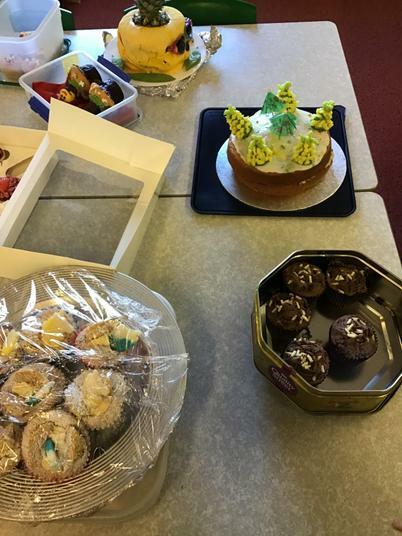 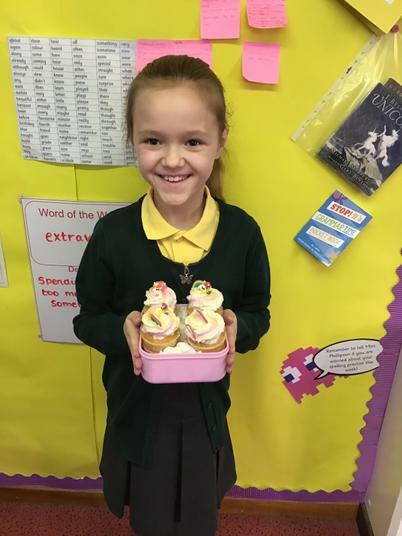 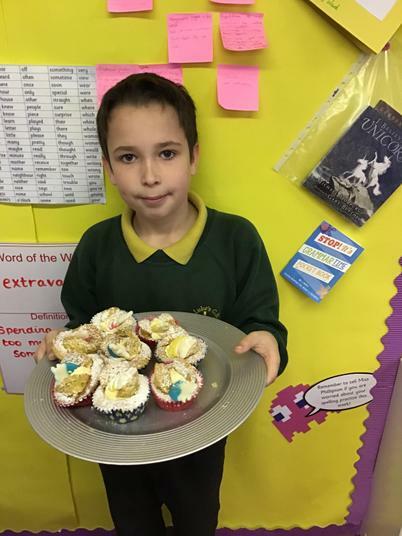 Take a look at the photos of our wonderful bakes below. 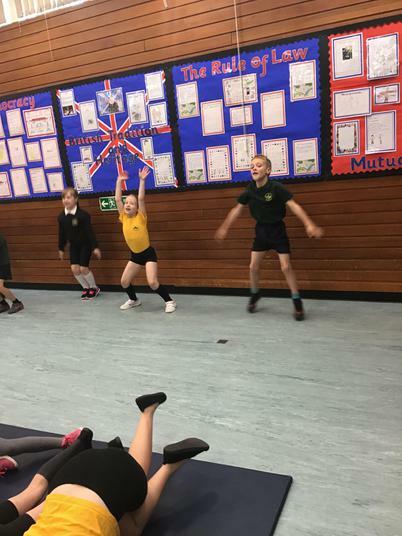 We are welcoming Mrs Hawes and Zoe into school this week to rehearse for Splash! 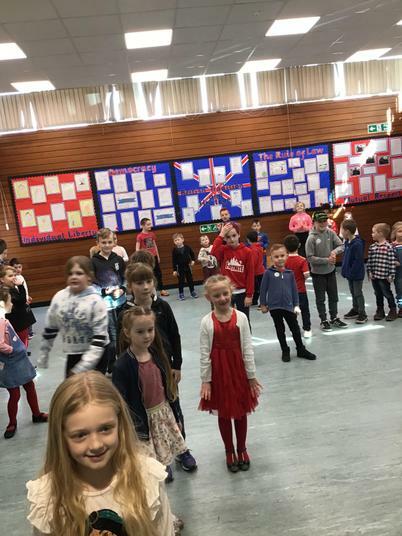 The children are all really excited about this and I know we will work really hard and put on a fantastic show. 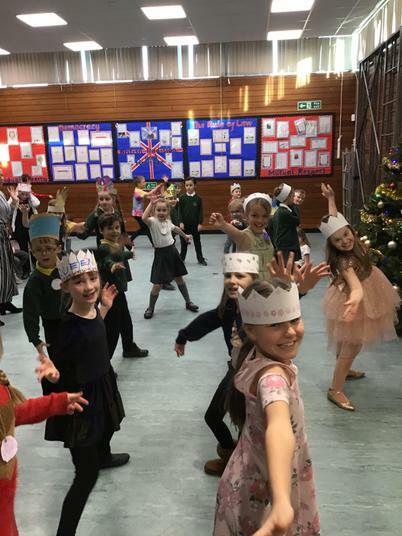 Don't forget about rehearsals at the theatre on Friday this week - children should be dropped off there at 9am. 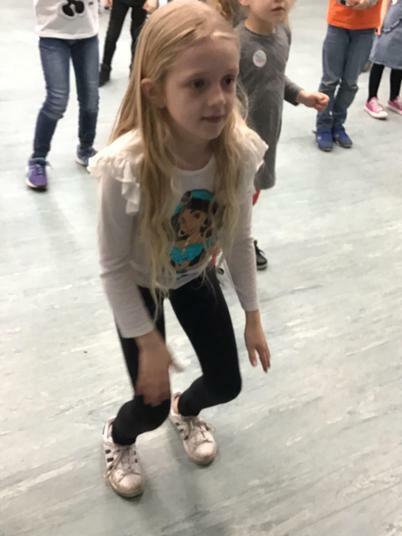 Please remember to practise your lines as much as you can - any queries please let me know. 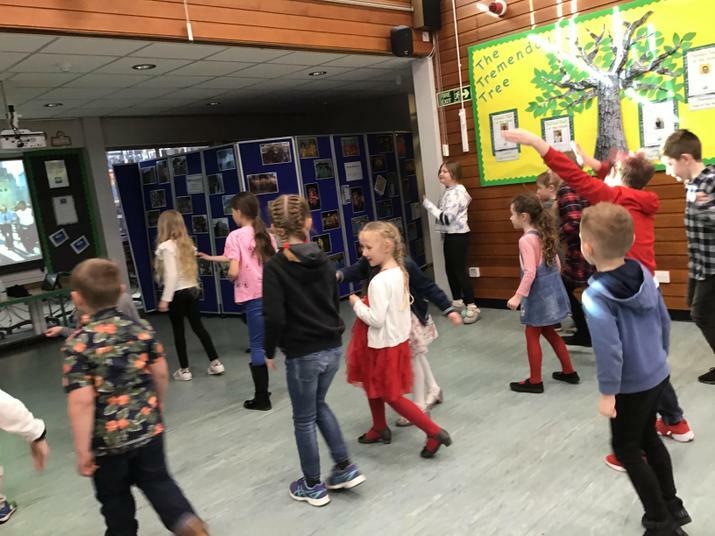 The children worked really hard this afternoon and danced in the school hall for an hour in order to raise money for Comic Relief. 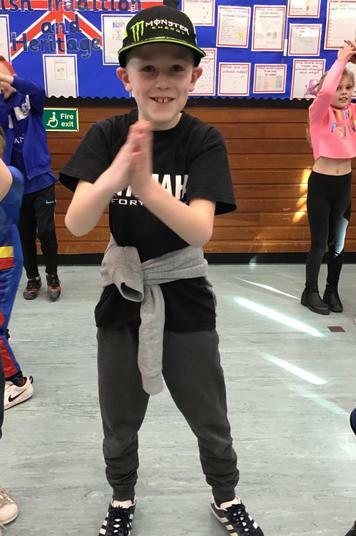 They all performed excellently and showed us a few great moves! 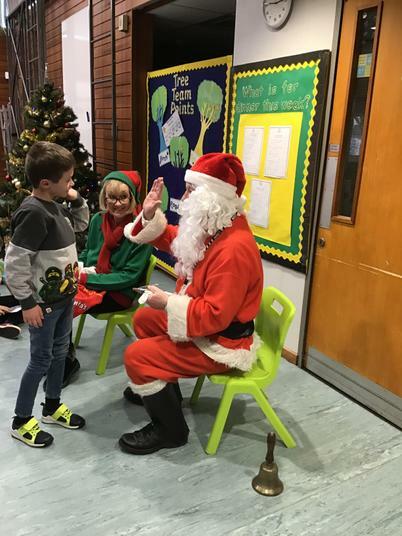 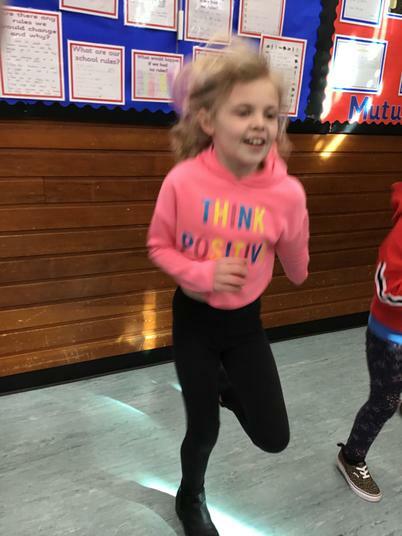 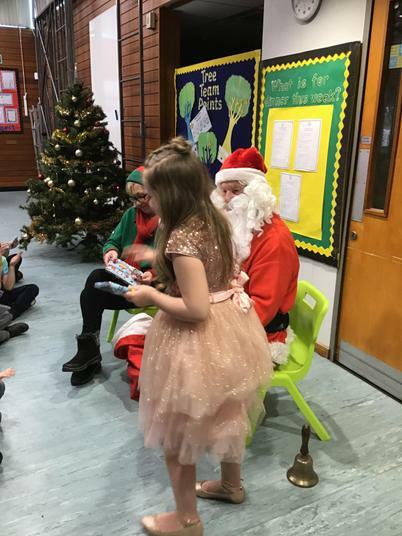 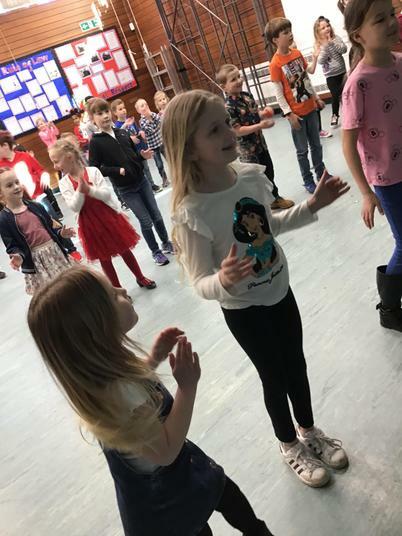 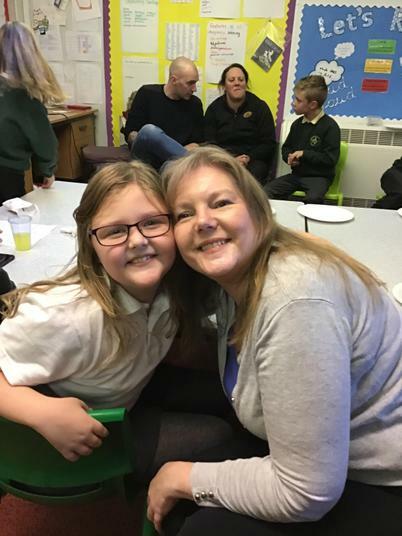 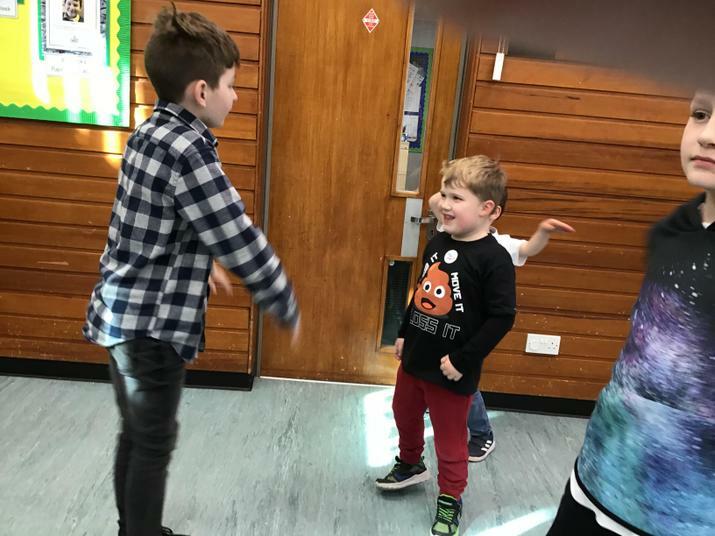 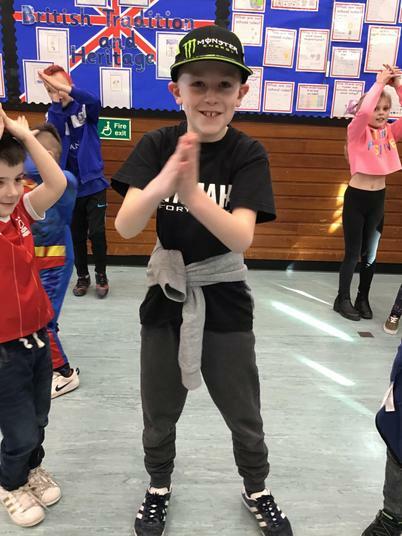 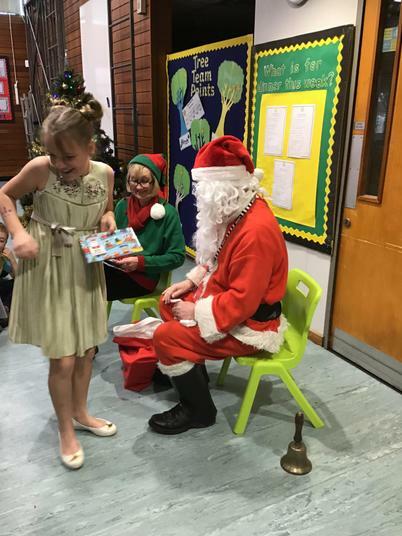 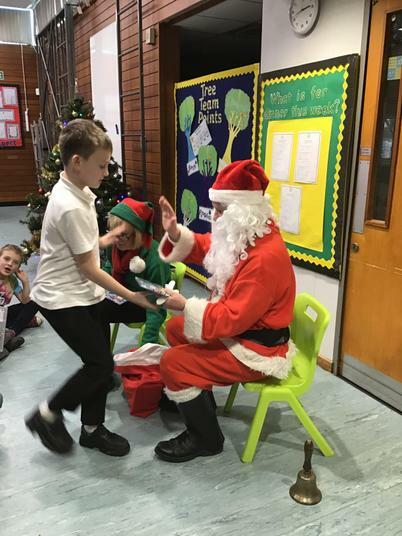 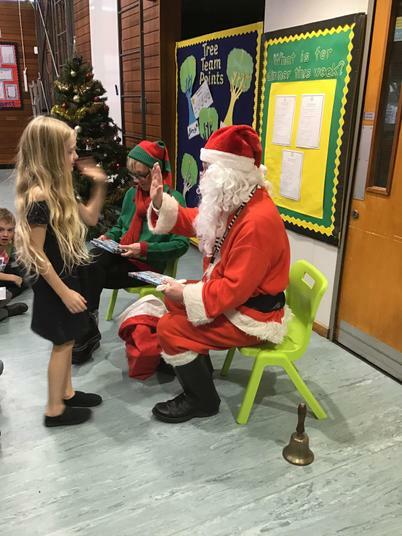 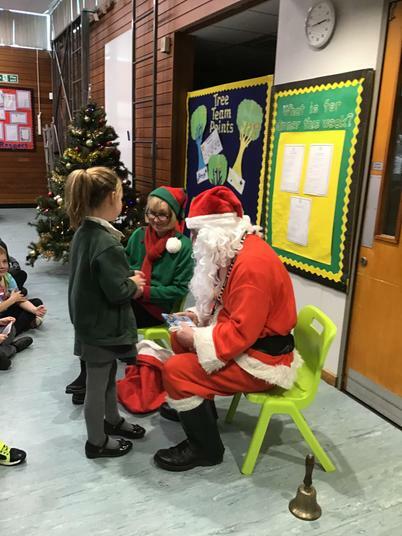 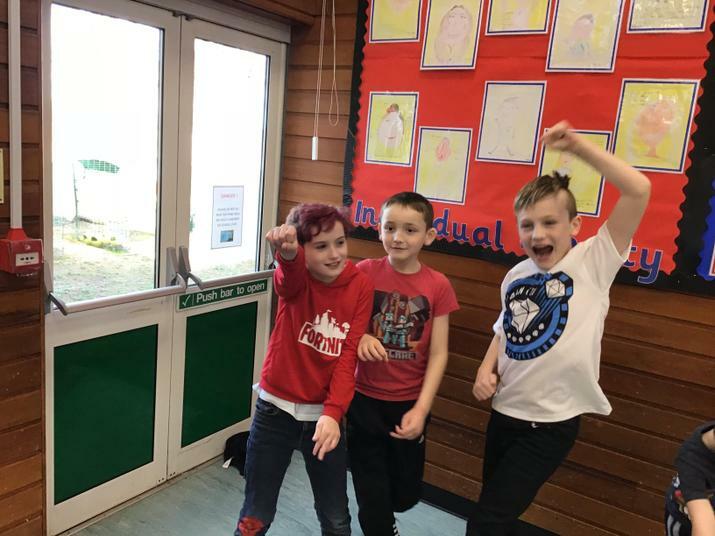 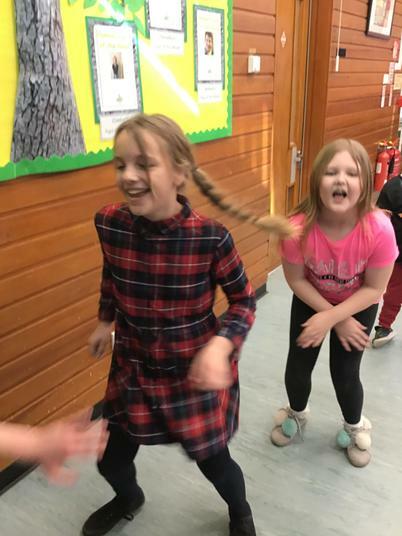 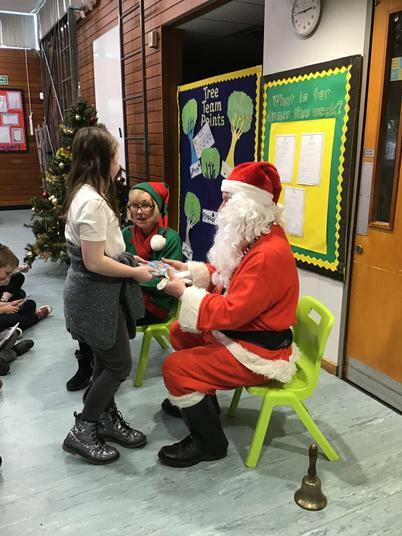 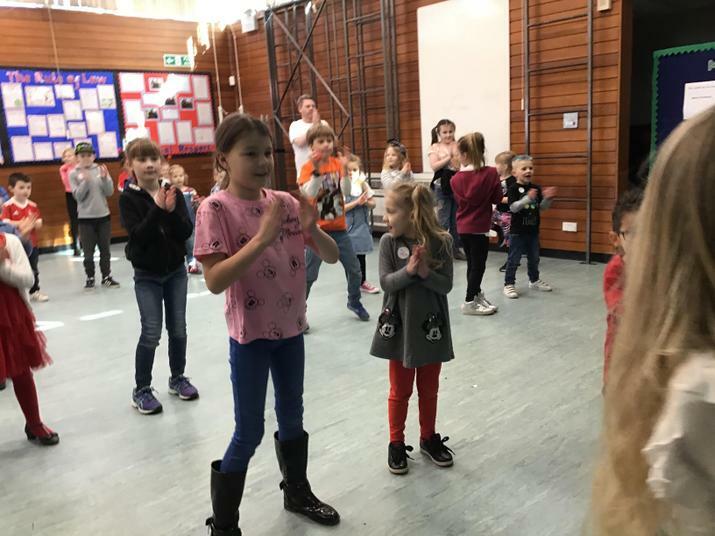 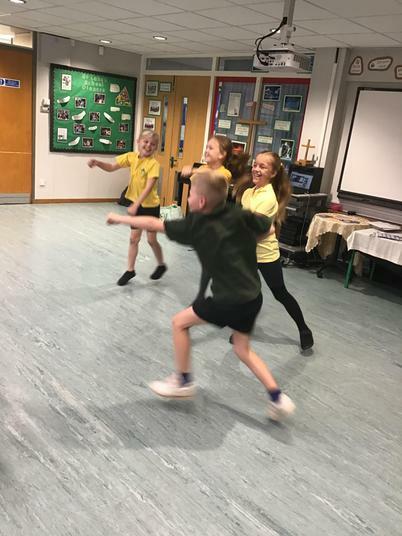 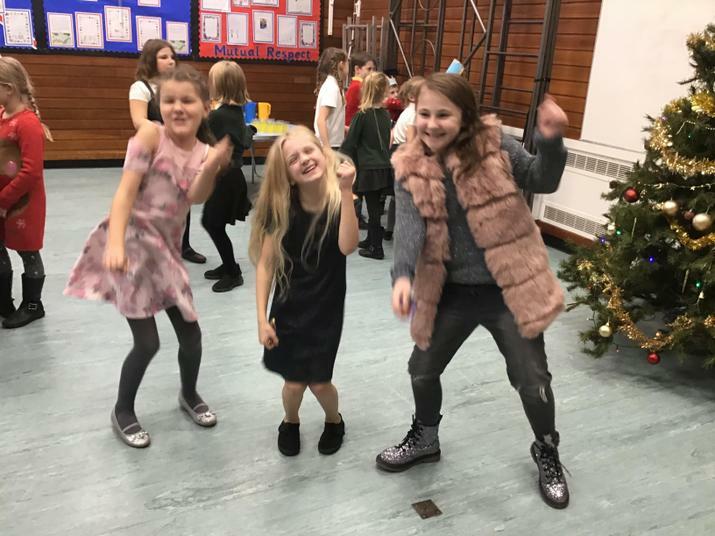 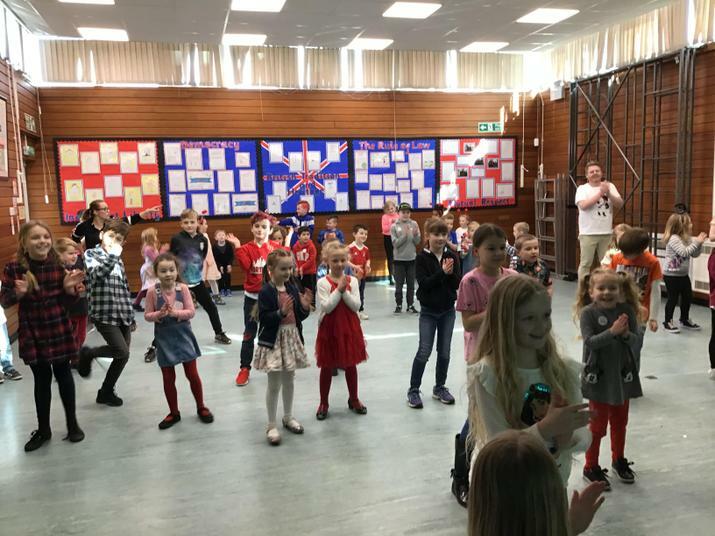 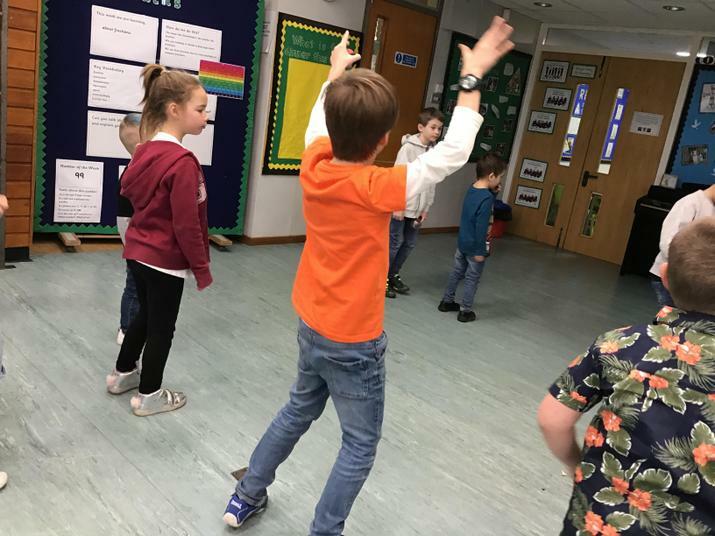 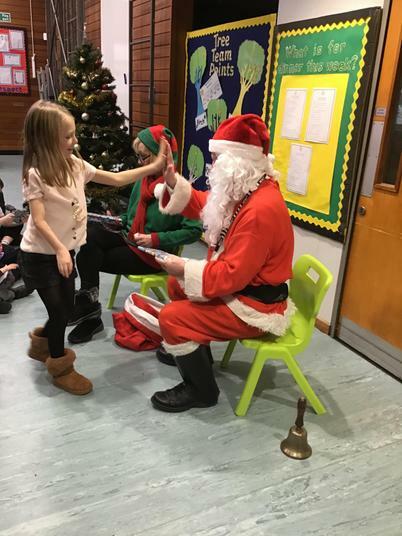 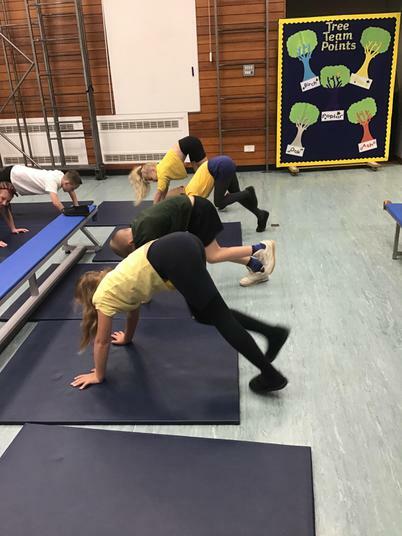 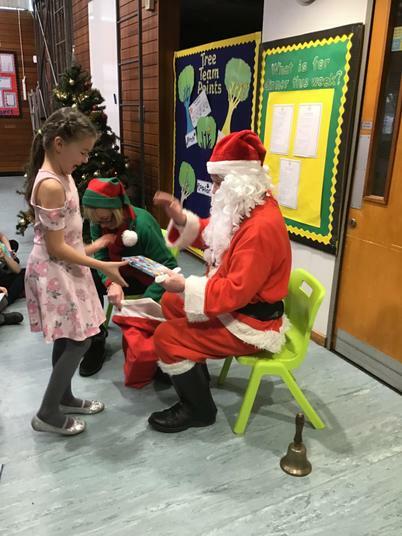 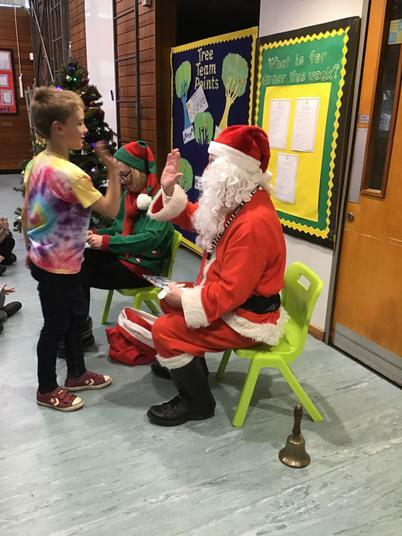 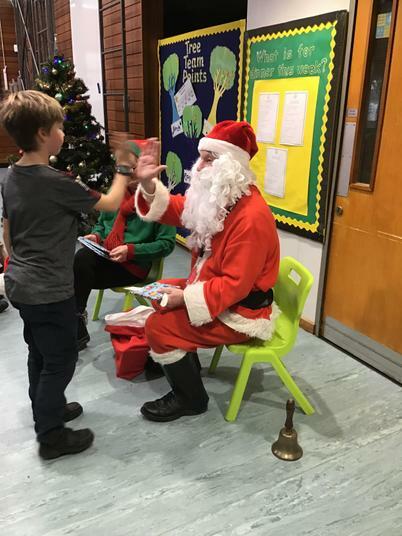 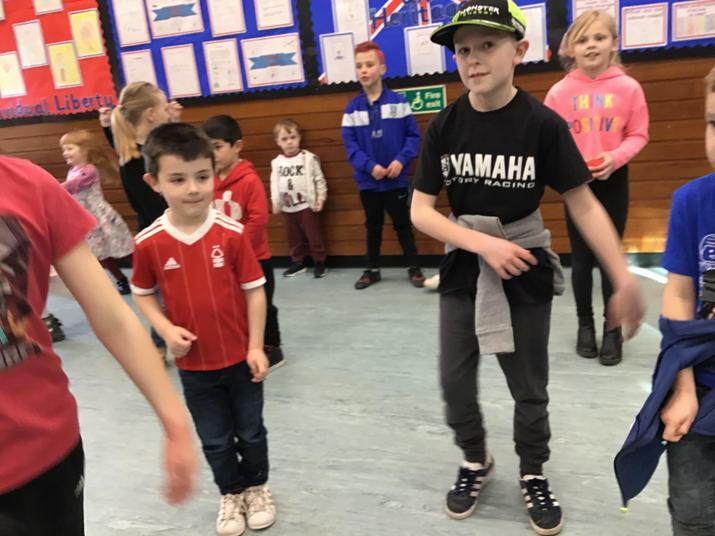 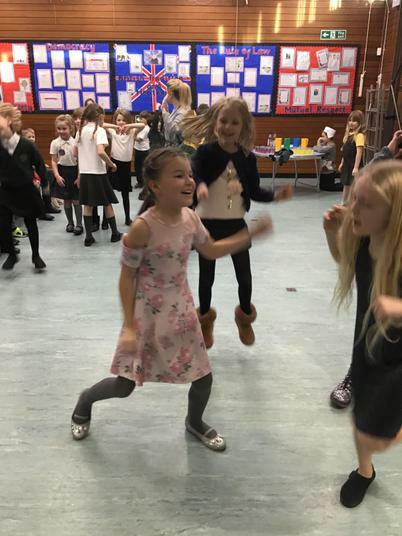 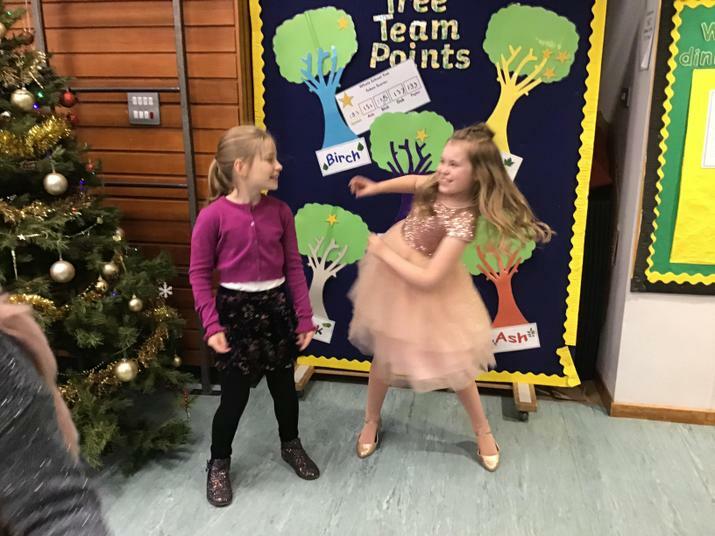 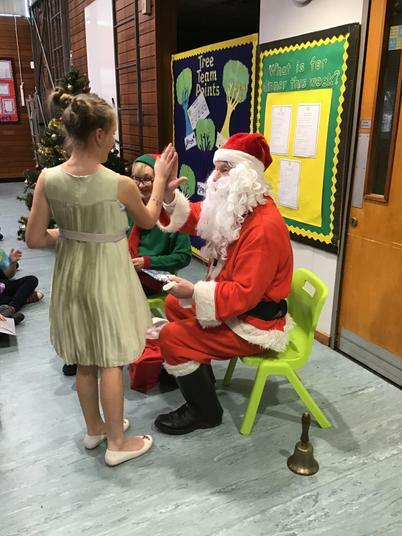 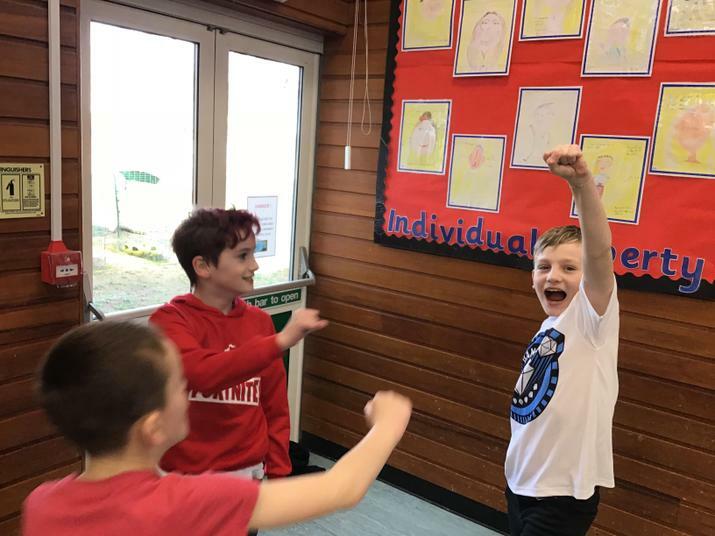 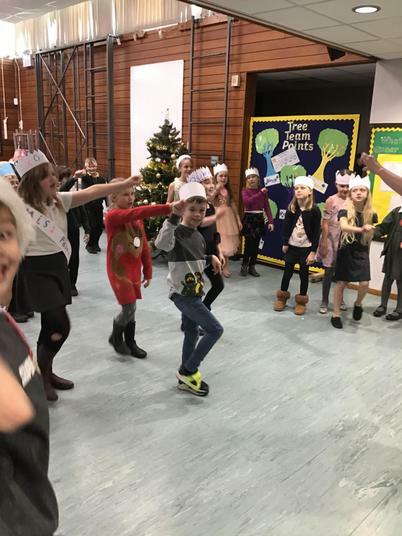 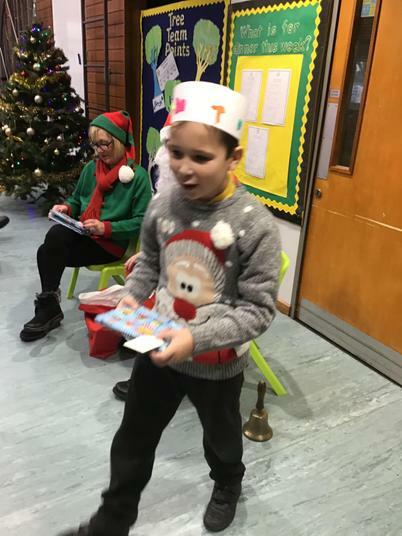 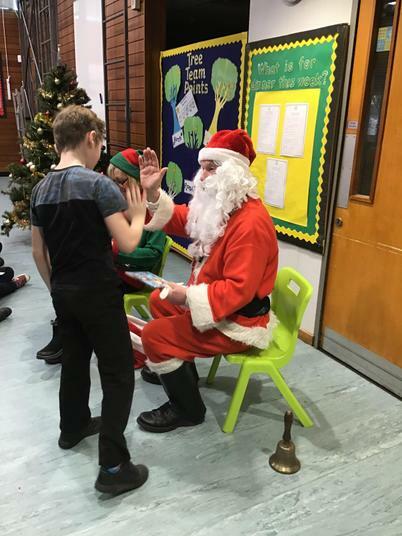 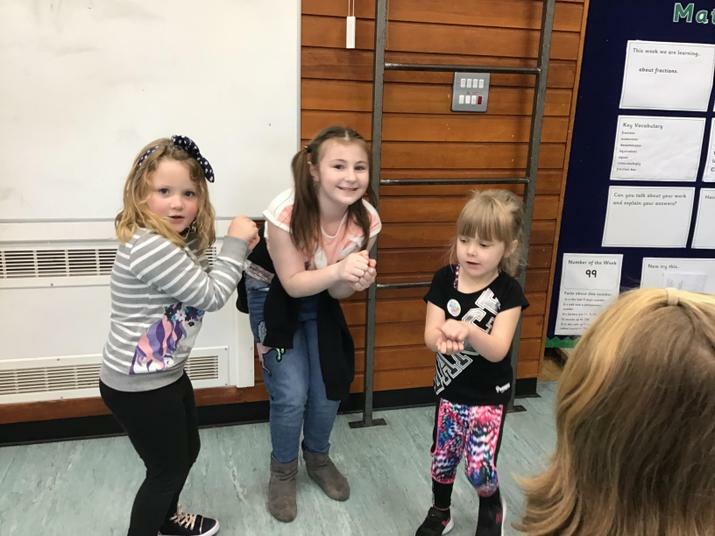 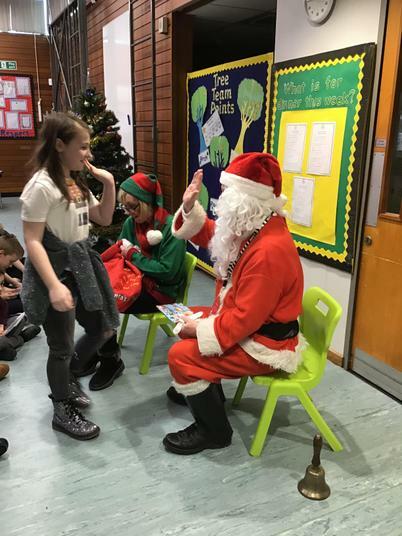 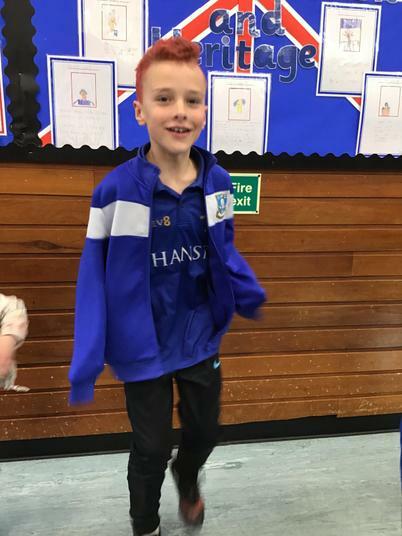 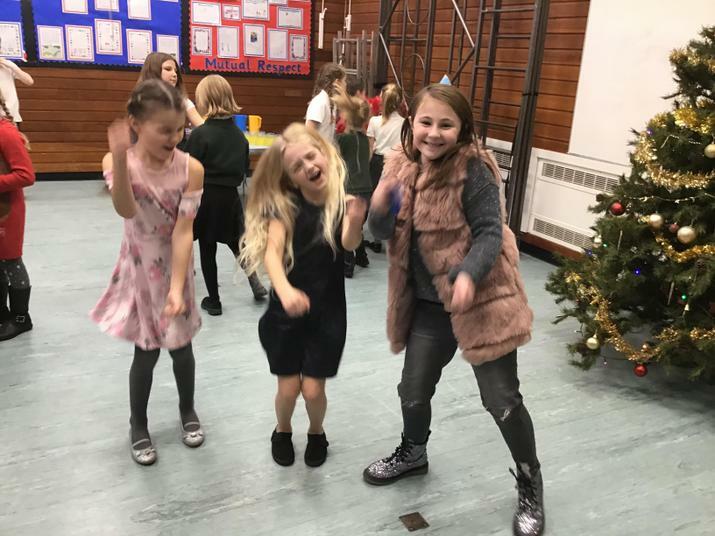 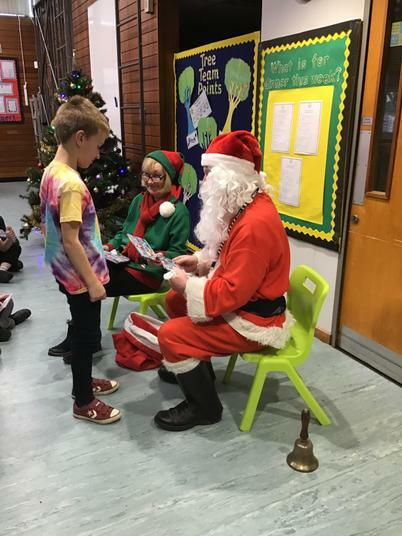 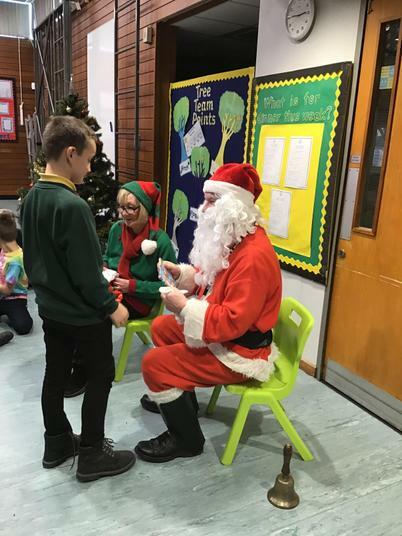 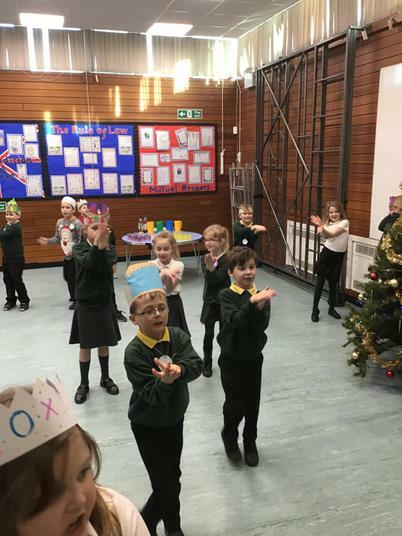 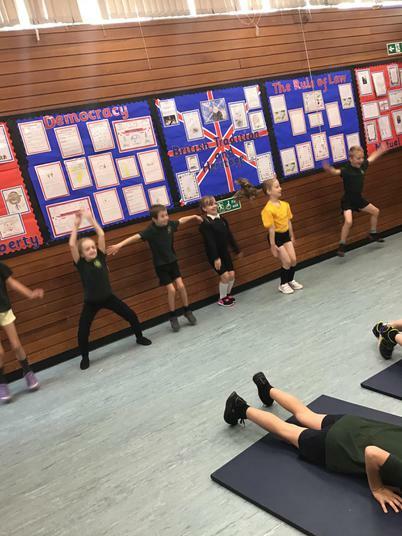 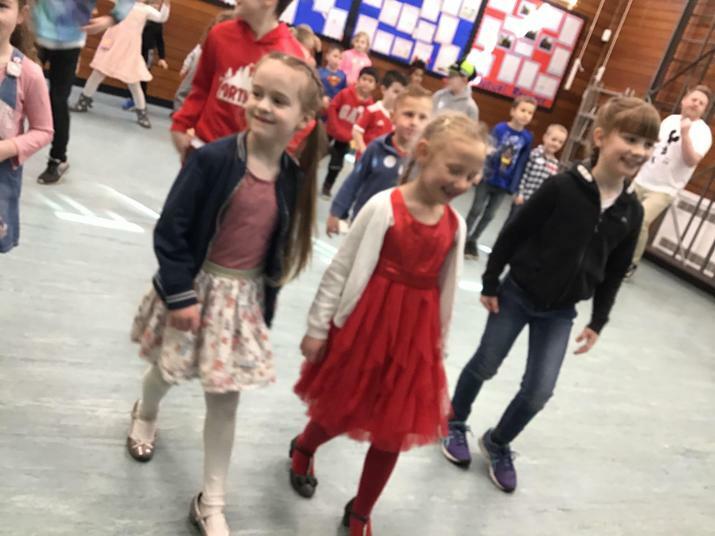 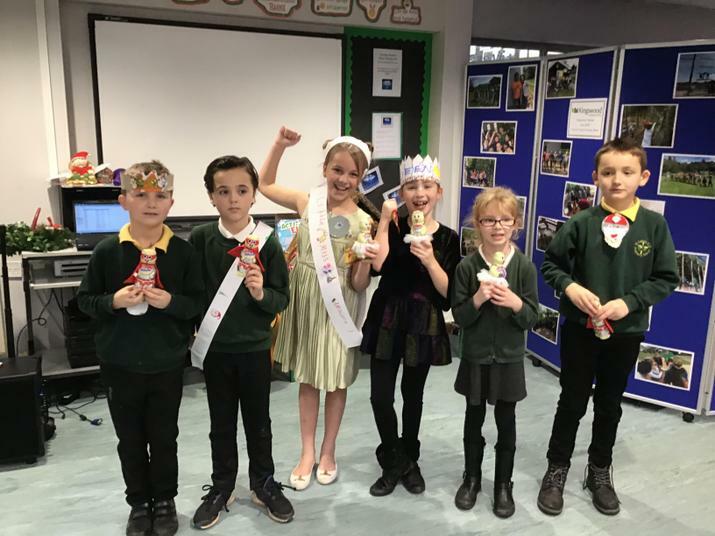 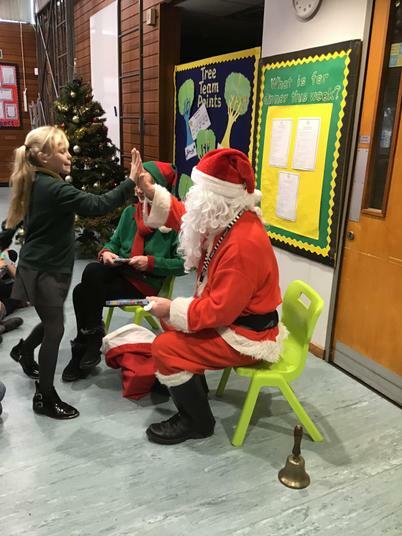 Some pictures of the Danceathon are below - we teamed up with Creswell class so we could help the younger children and be great examples to them. 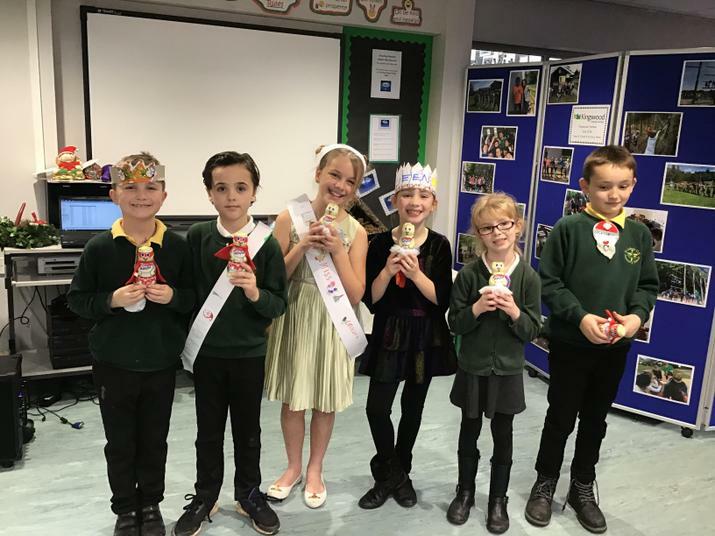 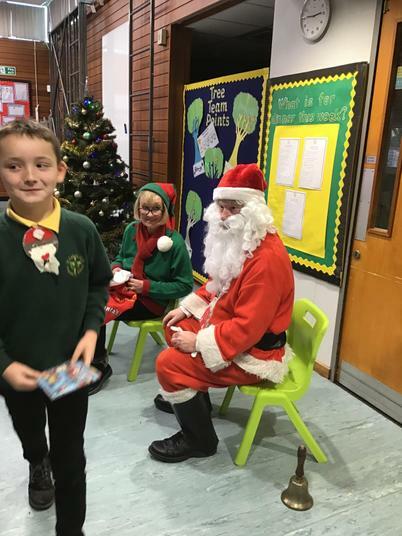 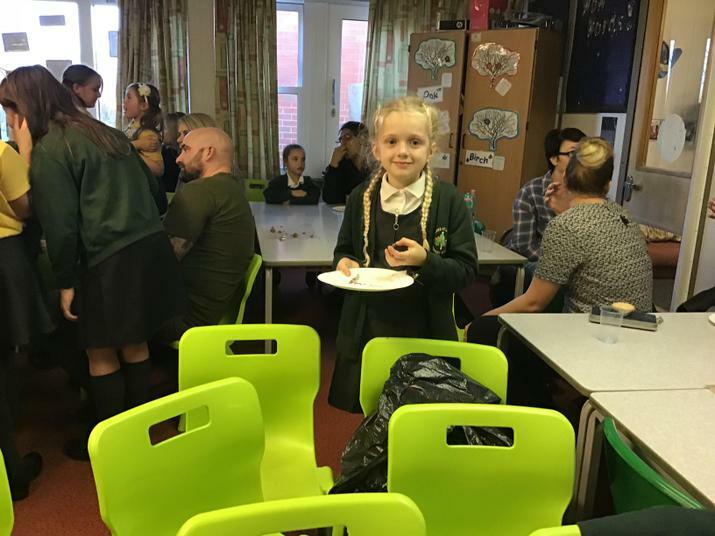 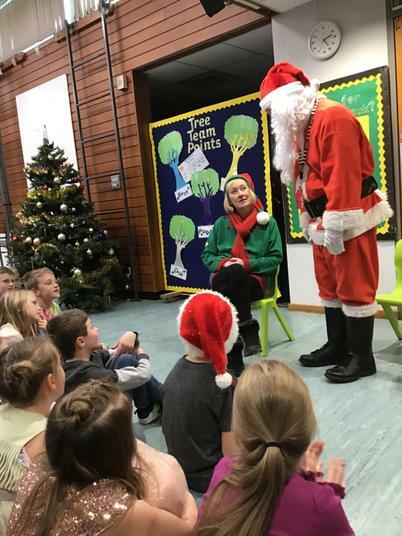 Thank you to everyone who sponsored members of Thoresby Class for the event! 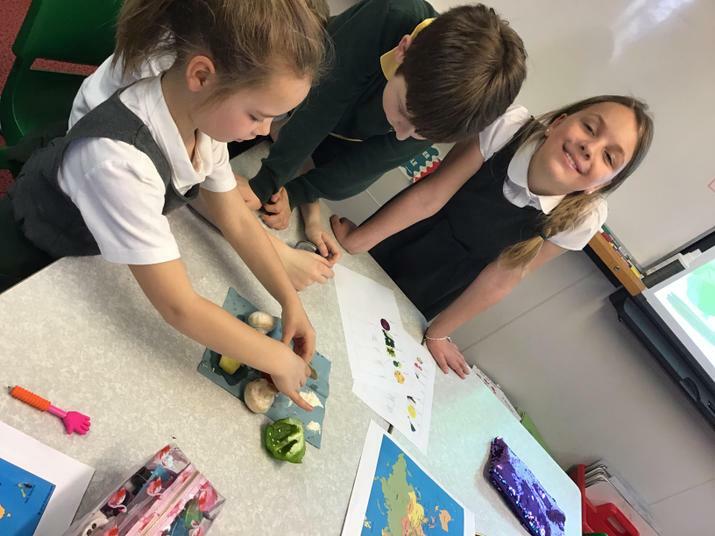 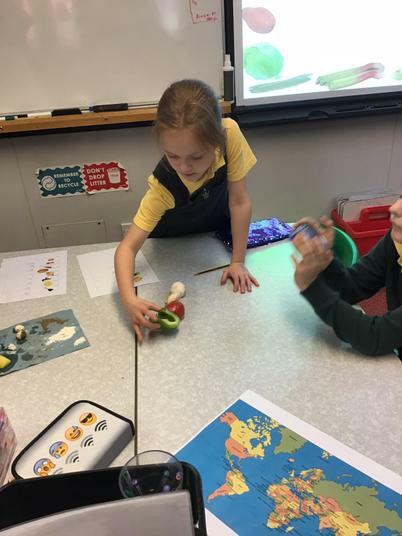 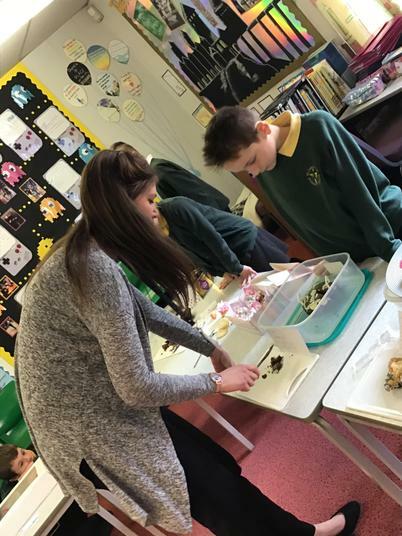 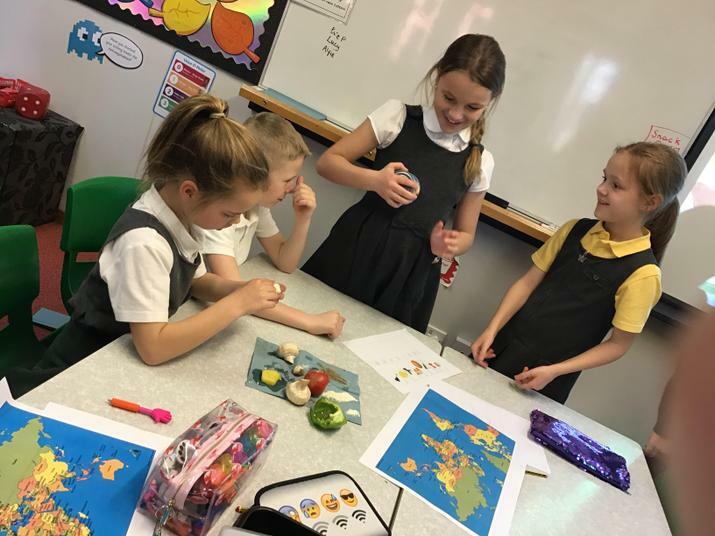 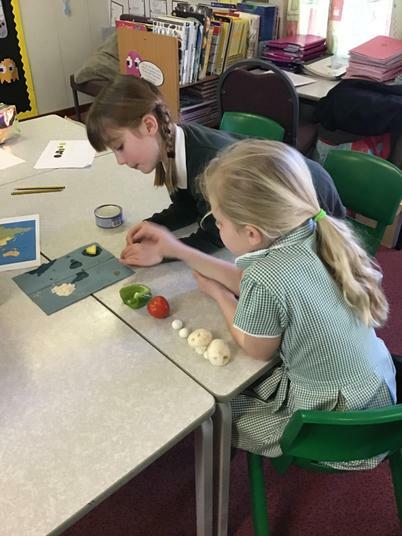 Geography: Discovering where food is produced! 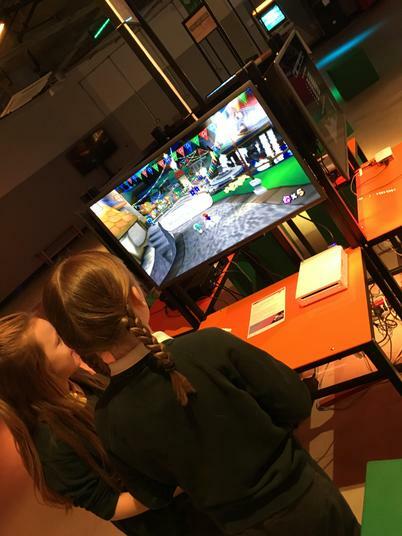 We have spent this afternoon taking part in our own gaming exhibition! 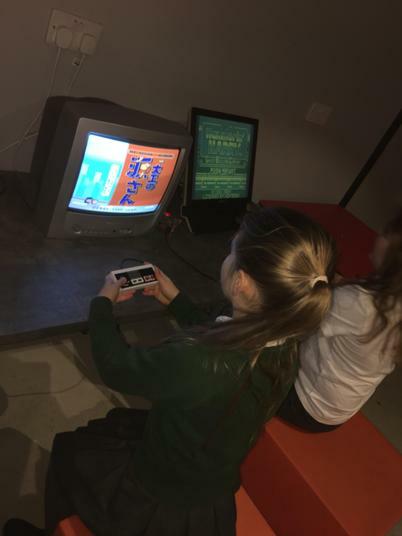 We invited all of the classes to come and have a look at our consoles and the PowerPoints that went alongside them. 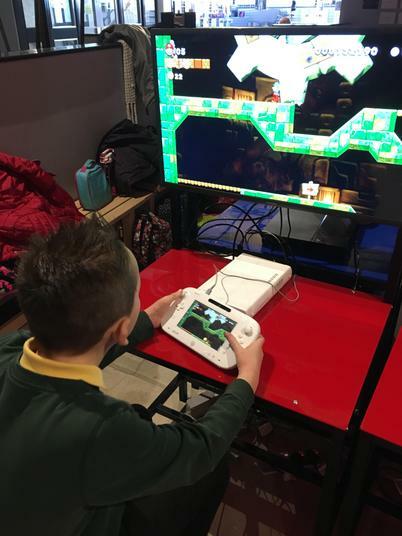 This gave us the opportunity to tell others all about how our consoles work, as well as other details such as what games you could play on them or how much they would cost. 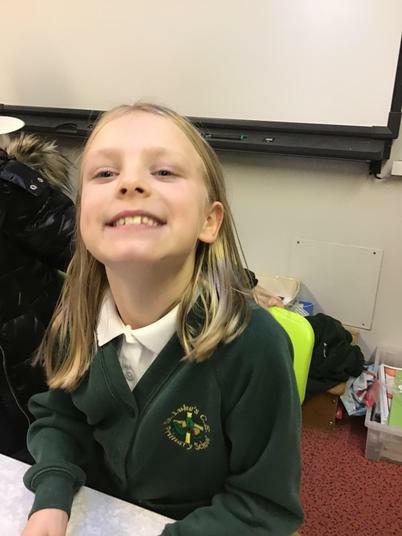 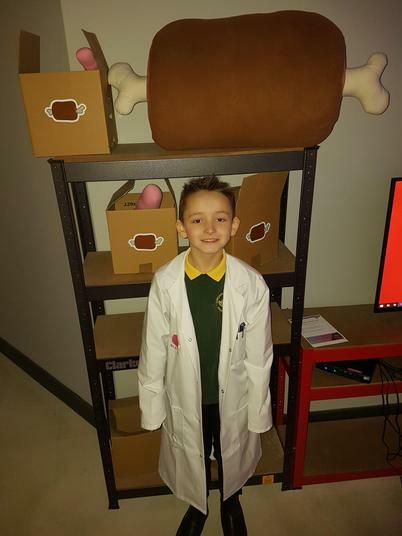 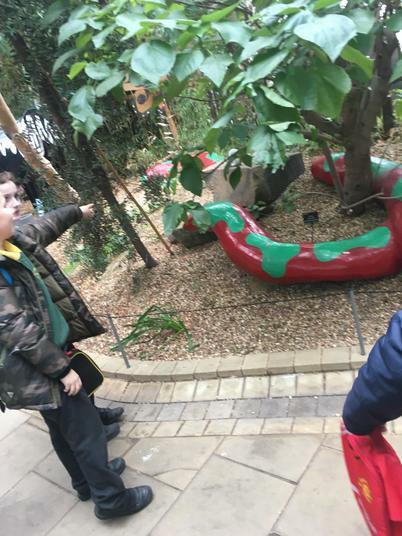 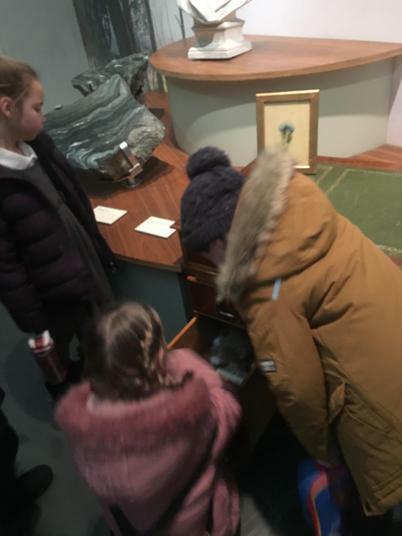 The children really enjoyed showcasing their hard work, and thank you to Creswell, Rufford, Clumber and Welbeck classes for coming to our exhibition! 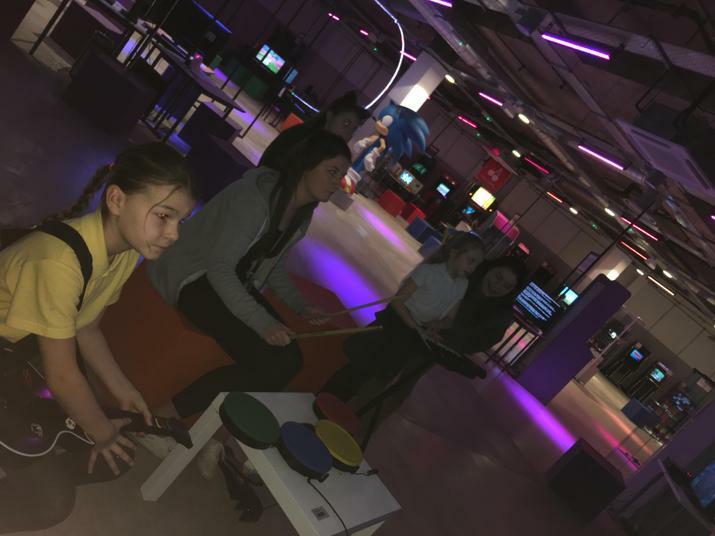 Photos of the groups with their consoles are below..
Our discussion about mental health to coincide with Children's Mental Health Week! 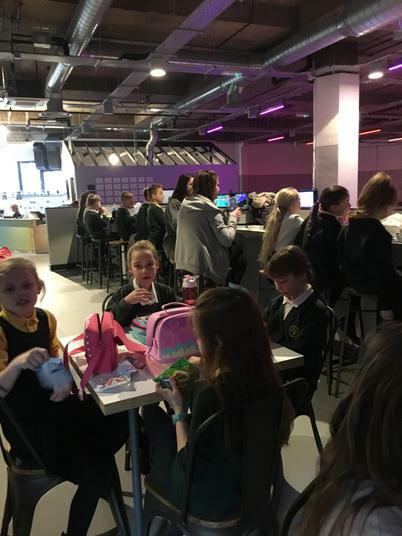 As our topic is Gaming and Technology we thought we would take a step back from the technological side and explore gaming through board games! 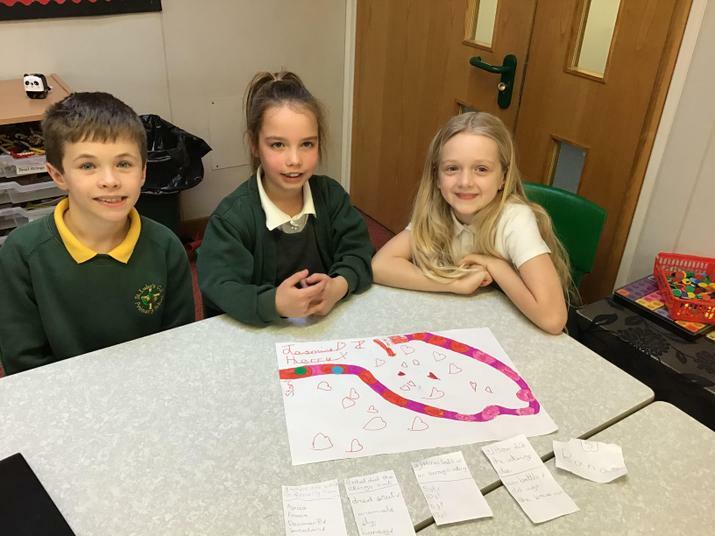 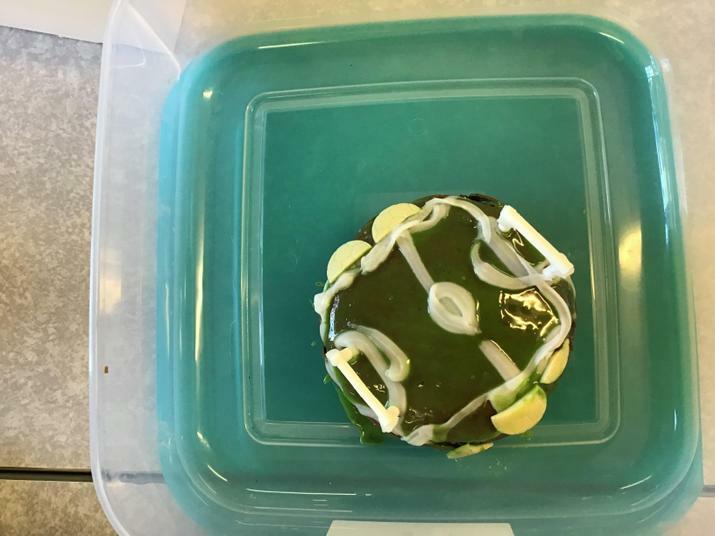 We used our knowledge of the Vikings and created a board game which has its own unique set of rules and instructions. 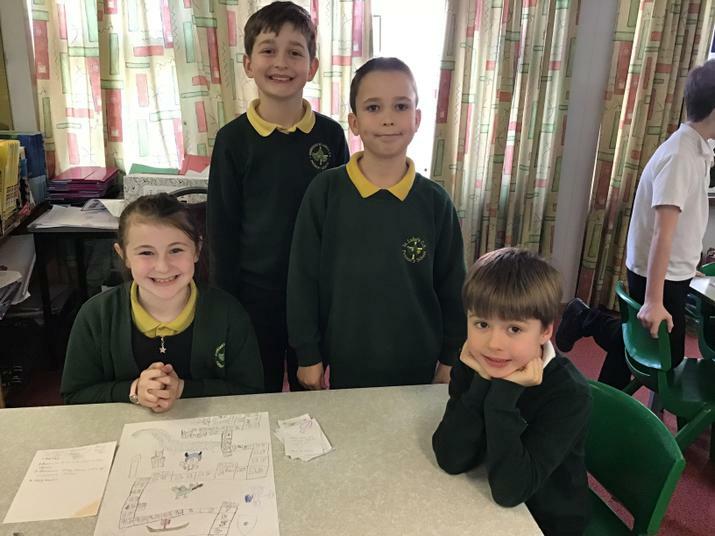 Each group has created a very different game, but you have to answer questions about the Vikings in order to progress. 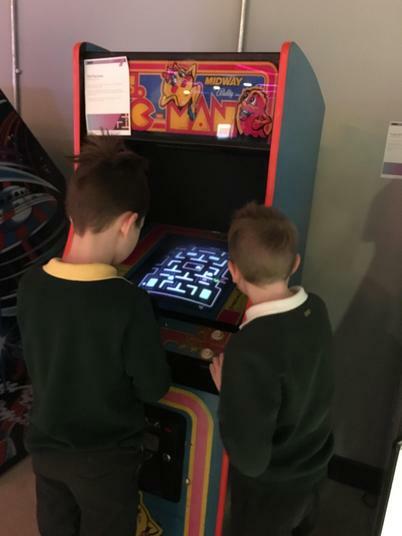 Take a look at our games below! 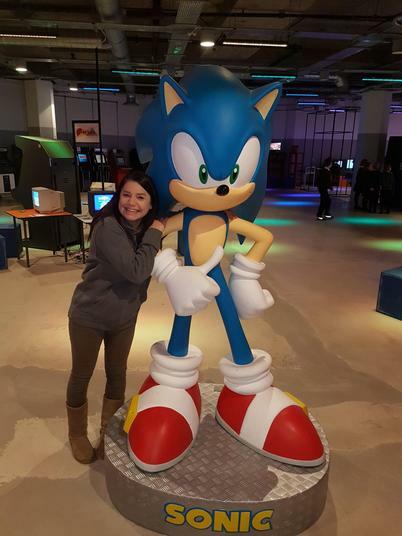 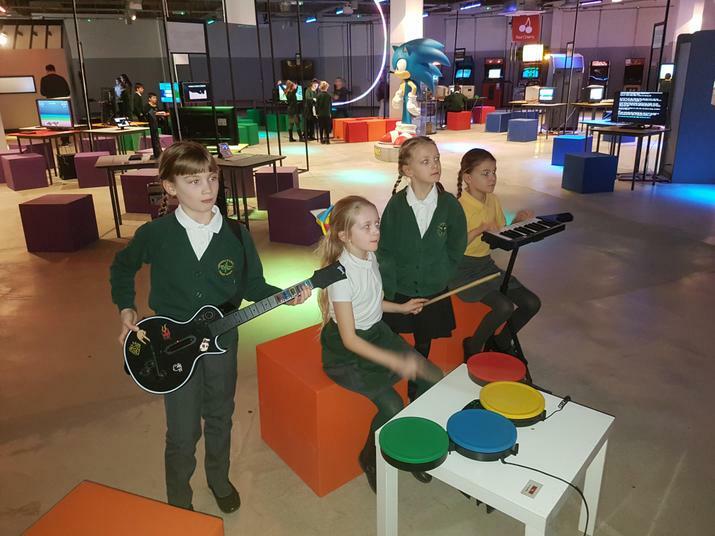 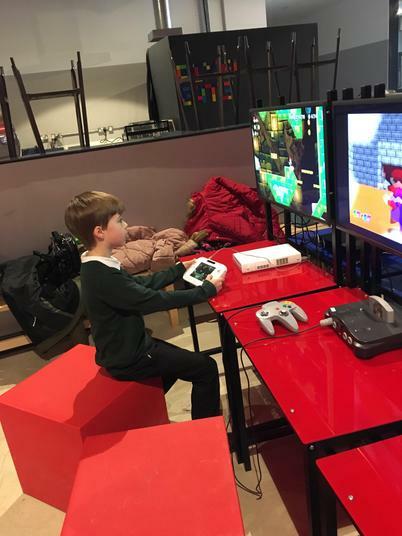 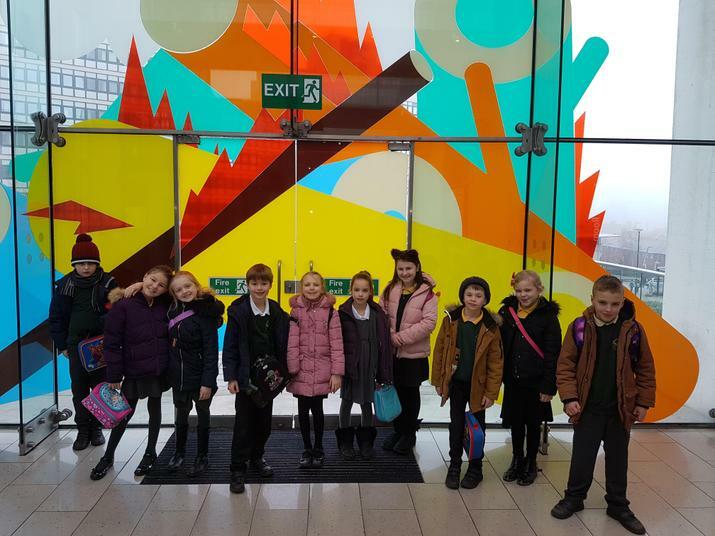 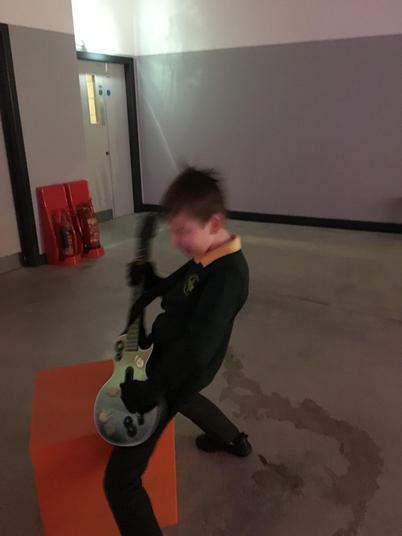 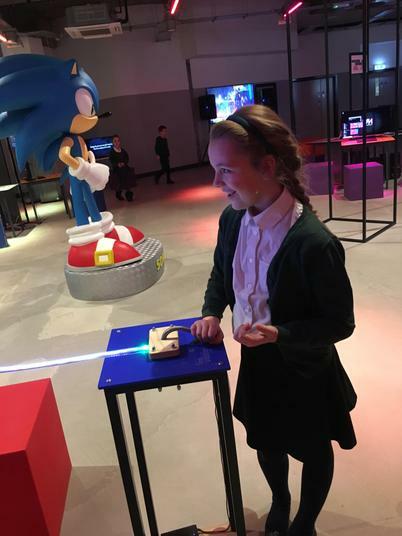 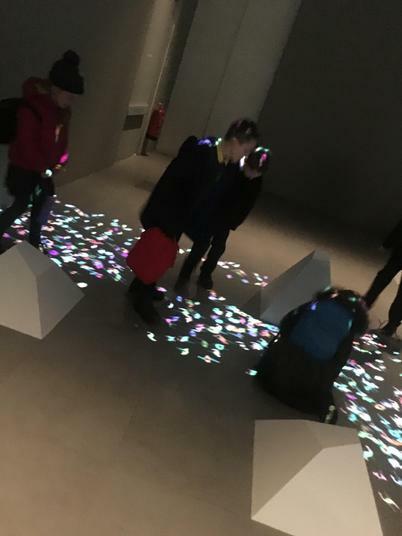 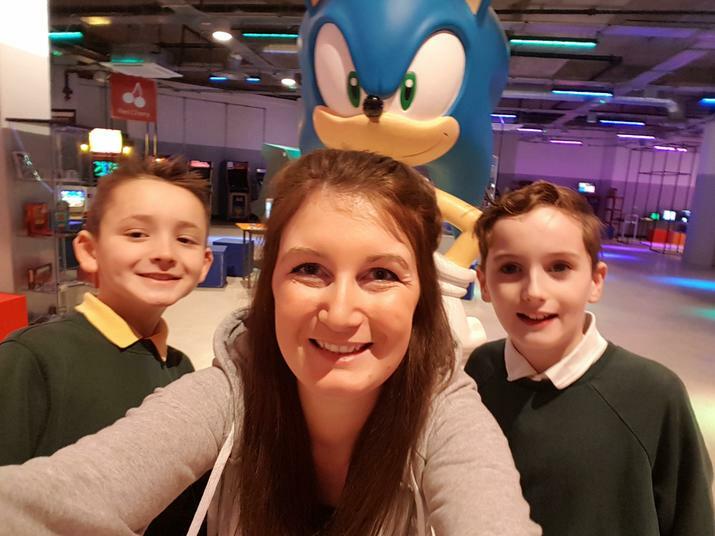 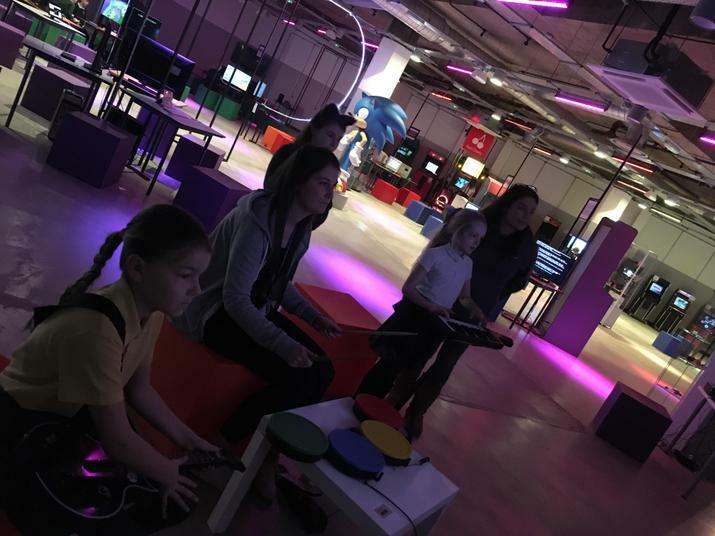 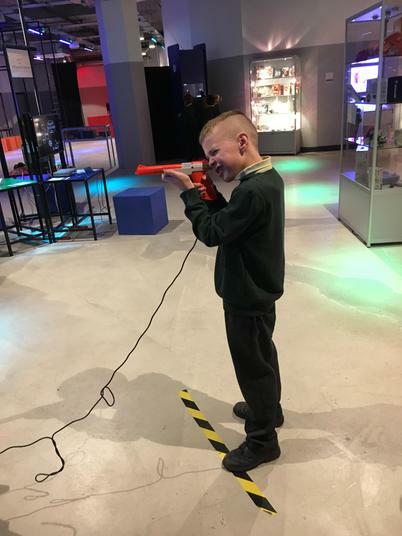 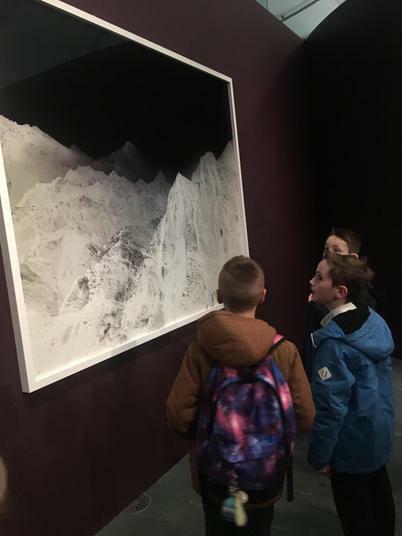 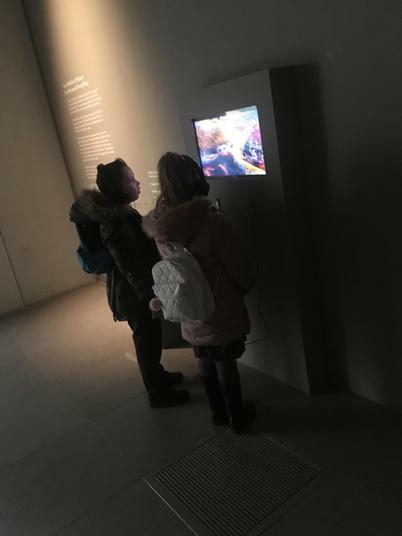 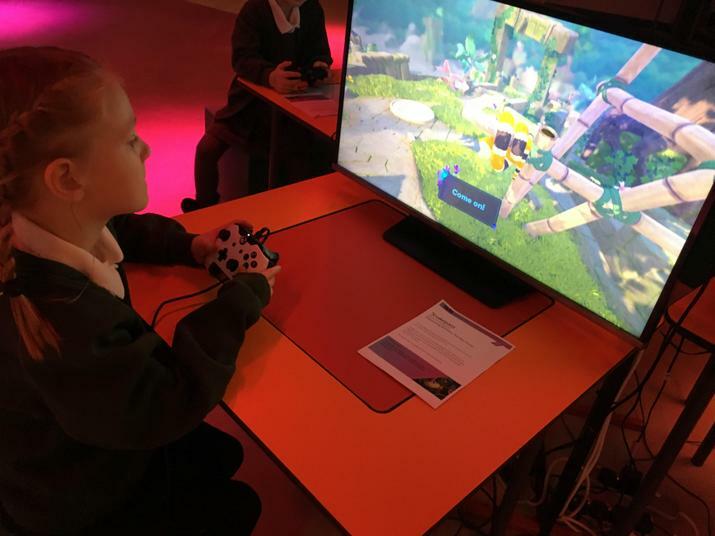 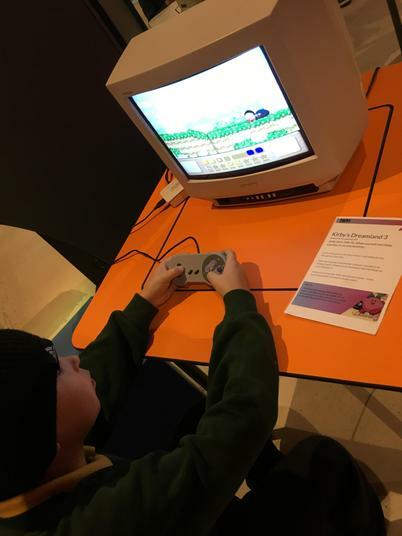 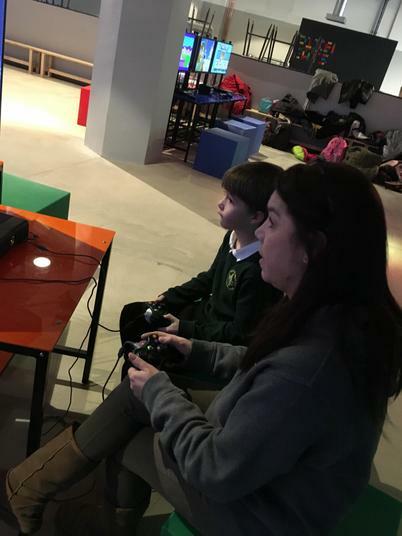 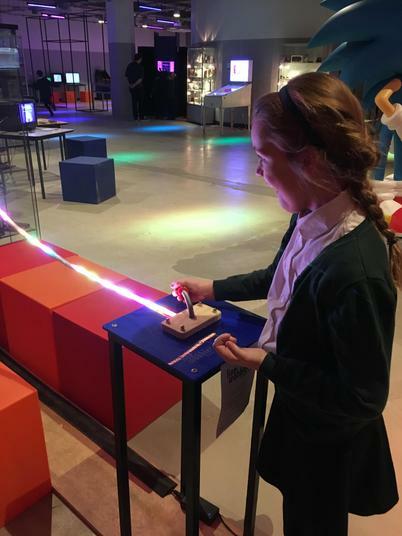 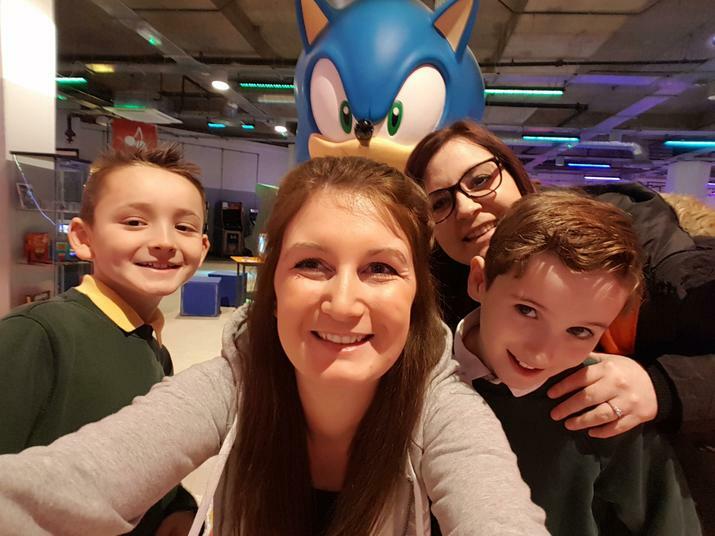 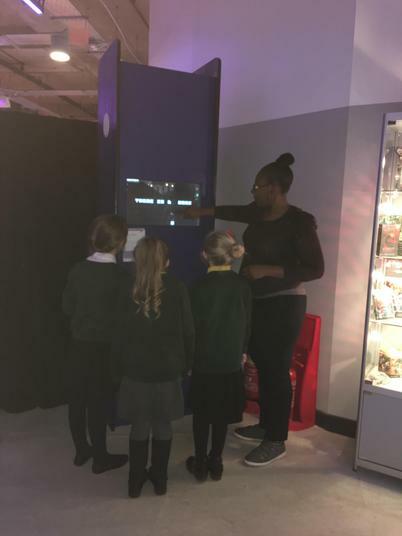 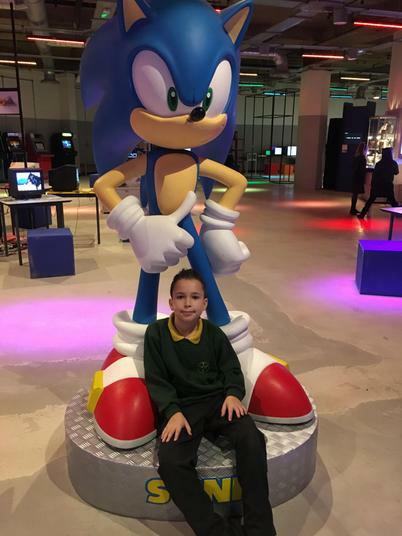 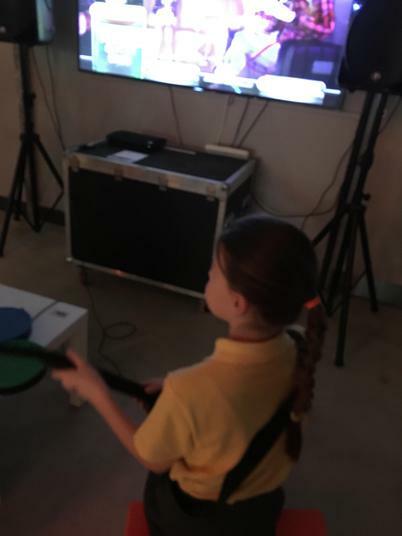 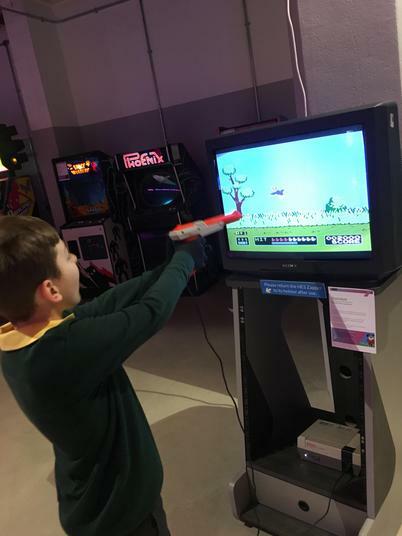 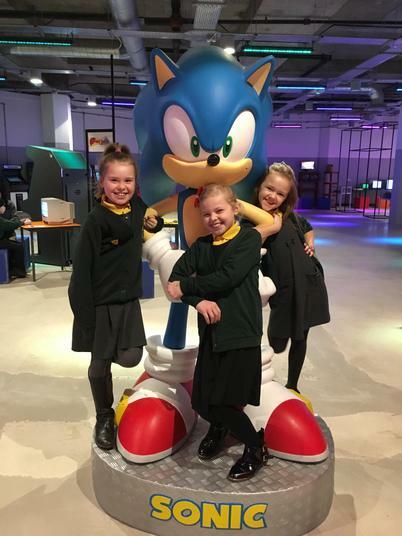 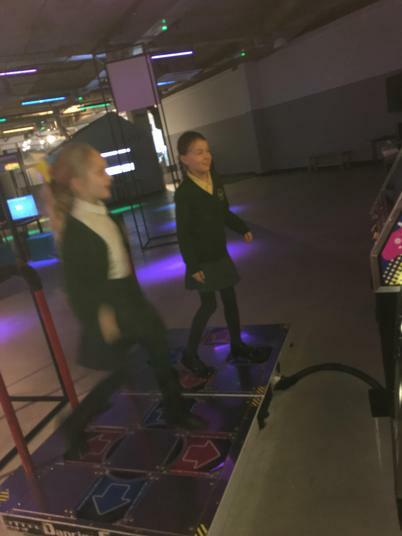 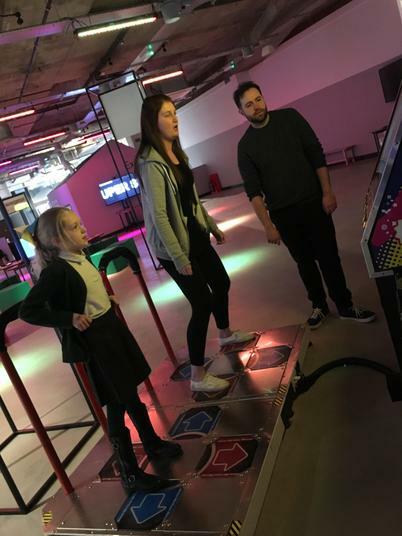 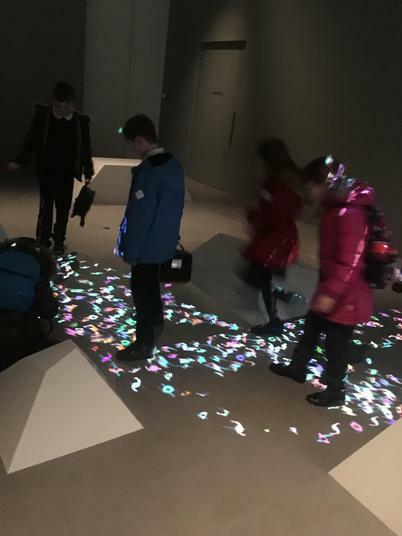 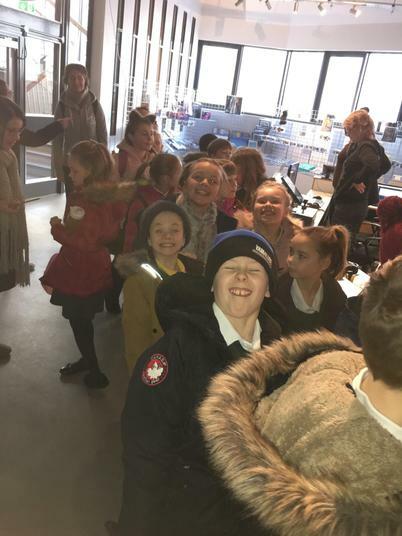 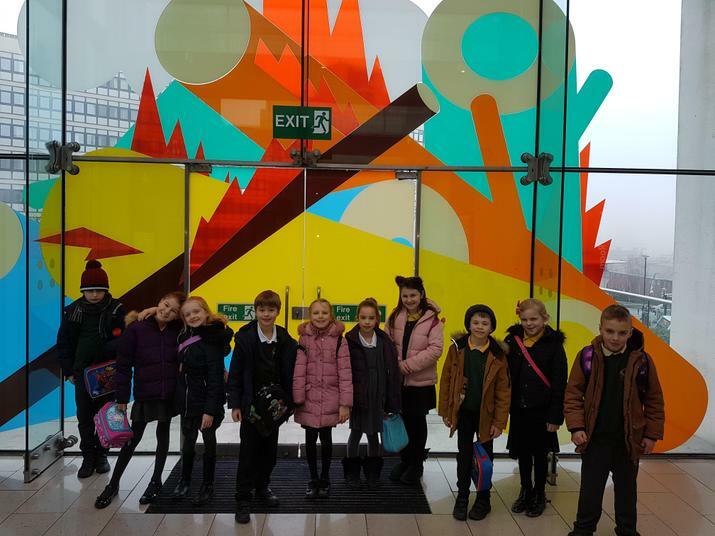 Children had a lovely time at the Videogame museum yesterday! 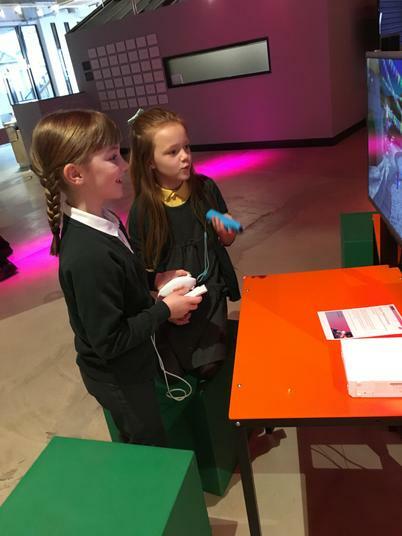 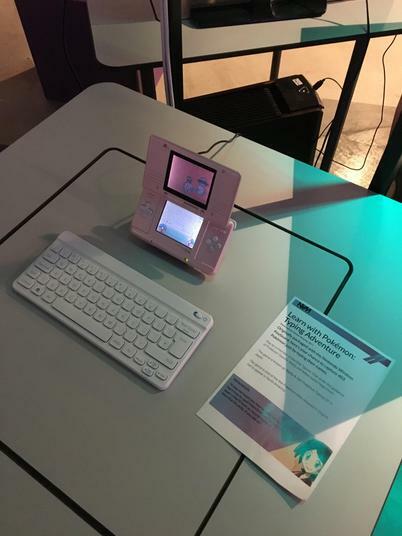 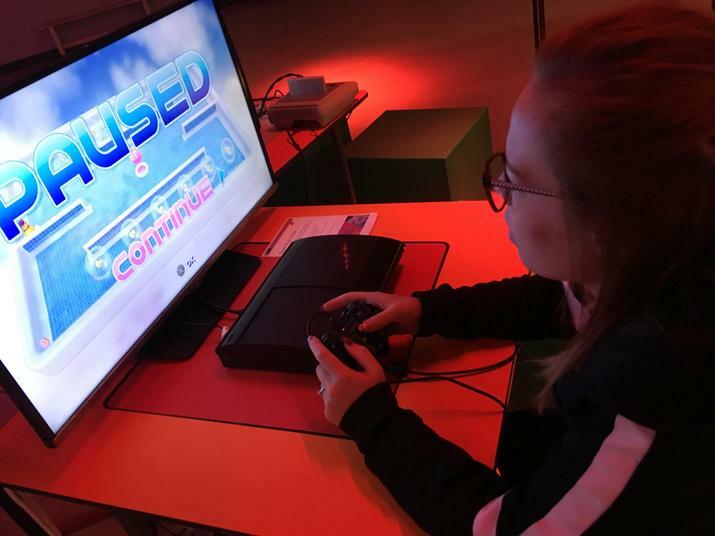 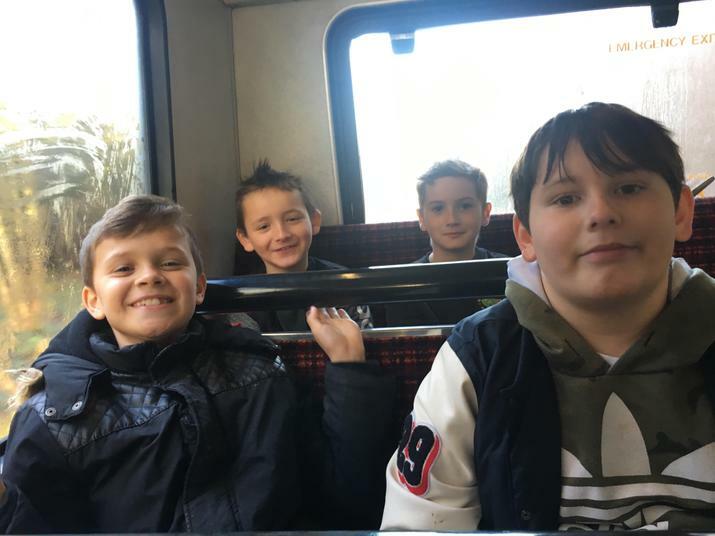 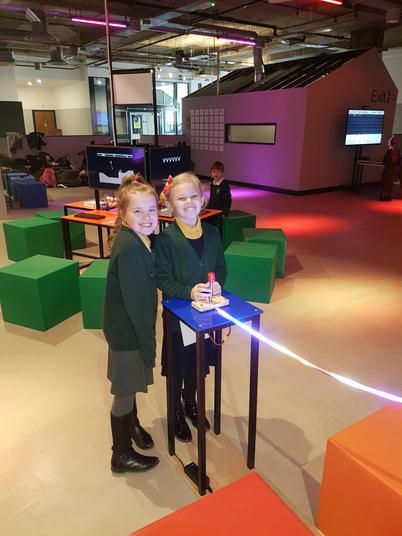 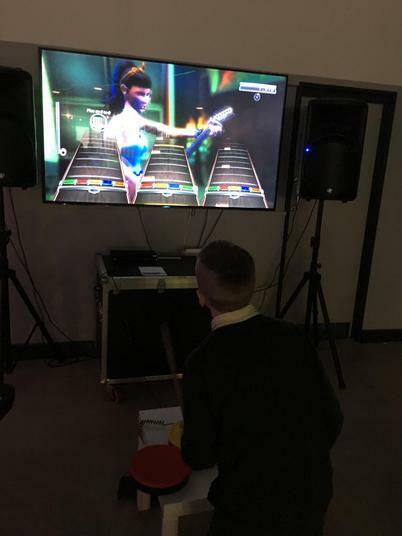 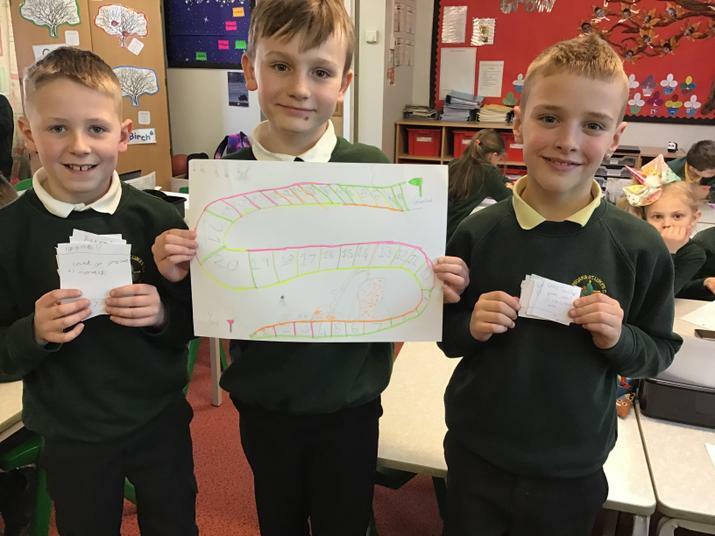 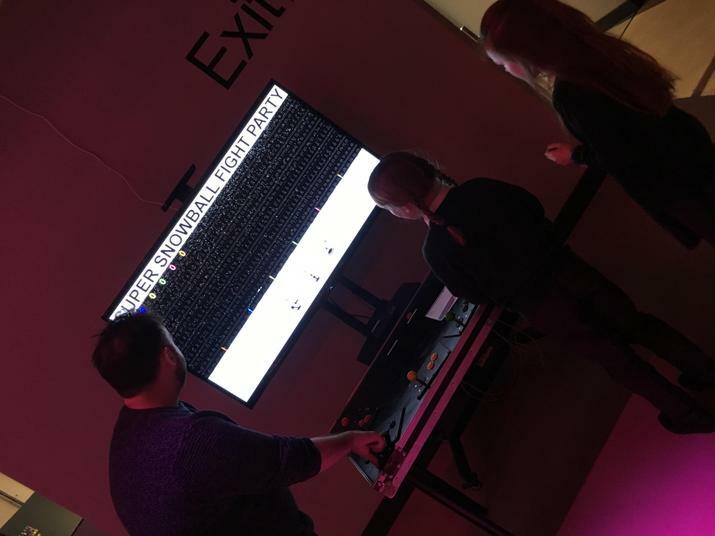 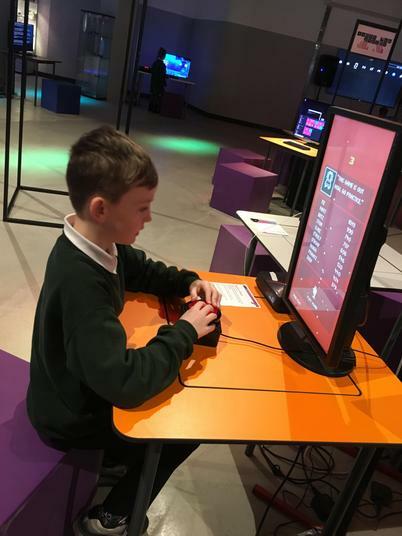 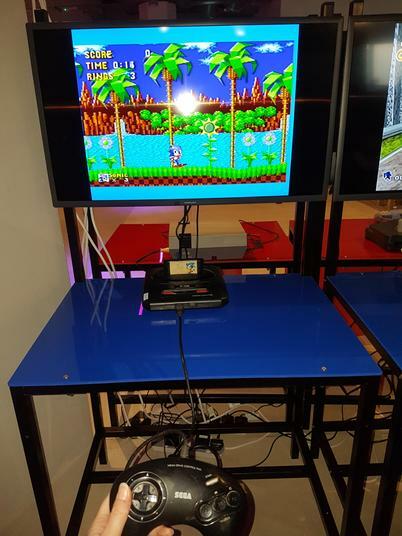 They were able to play on a wide range of games and this gave them some real inspiration for their own games consoles, which we will be finalising next week. 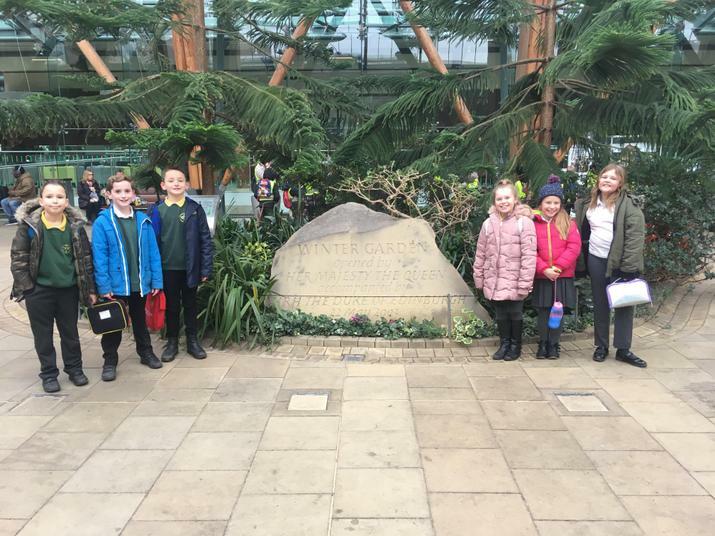 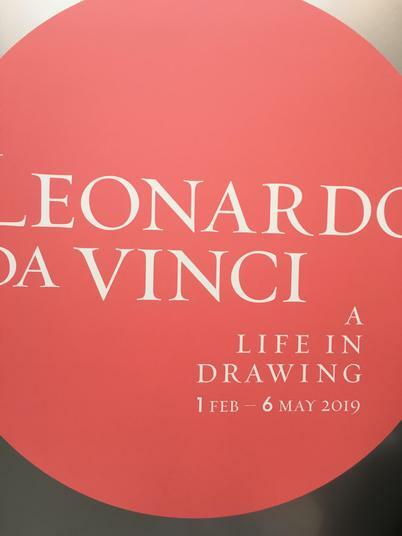 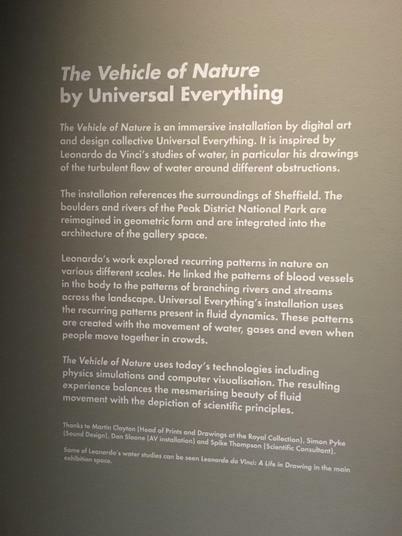 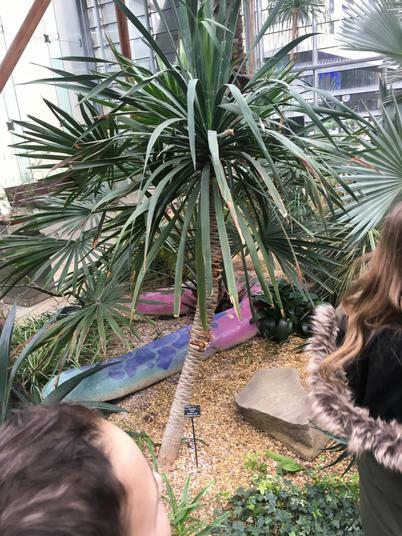 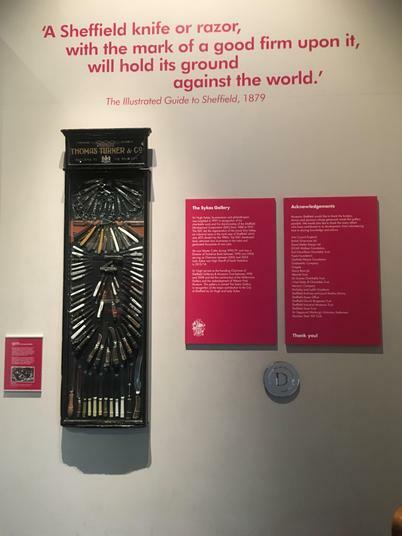 We then walked to the Winter Gardens in Sheffield City Centre and visited the Leonardo Da Vinci art exhibit which was really interesting. 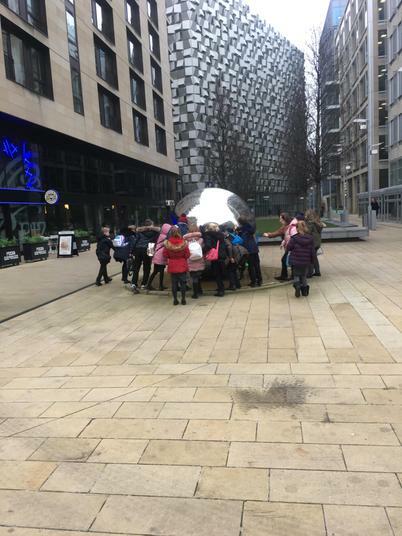 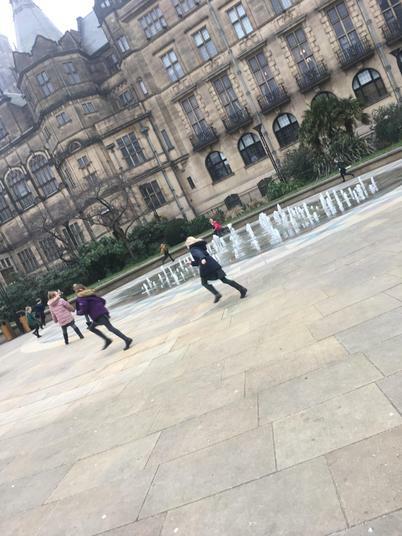 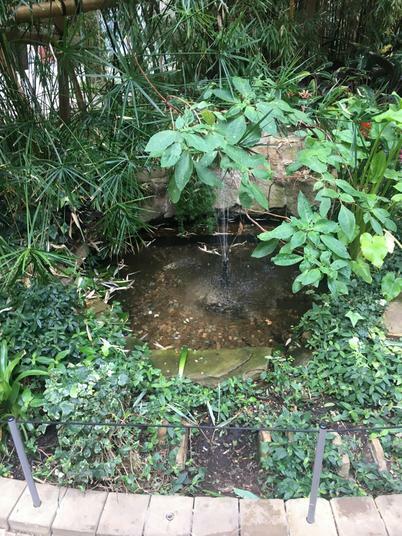 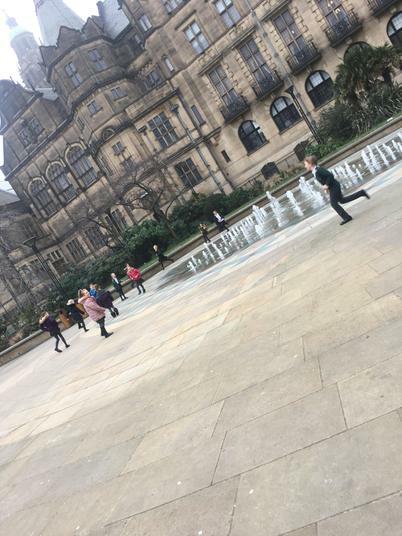 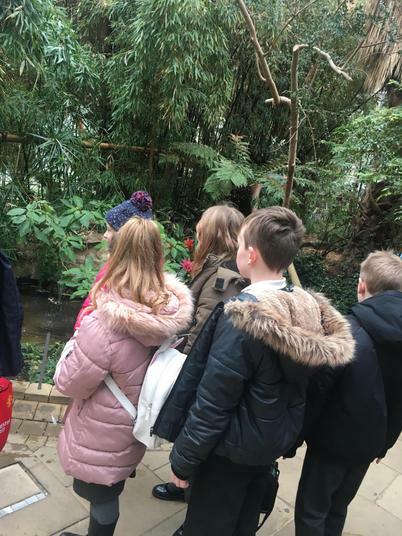 Finally, we explored the Peace Gardens, although not for long as it was freezing cold! 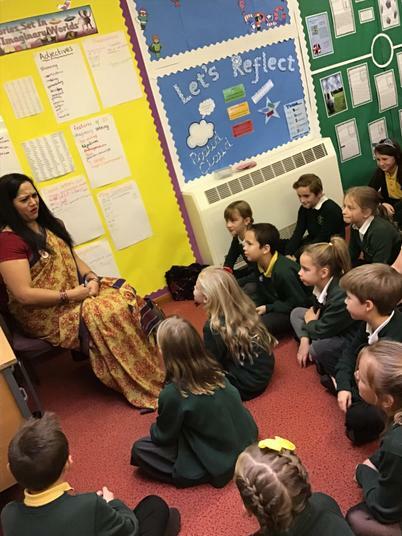 The children behaved wonderfully and seemed to take a lot from the experiences. 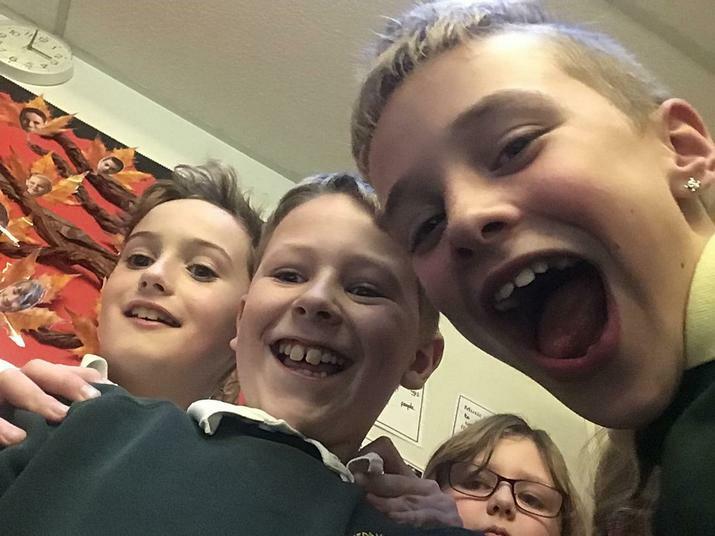 Some photos are below. 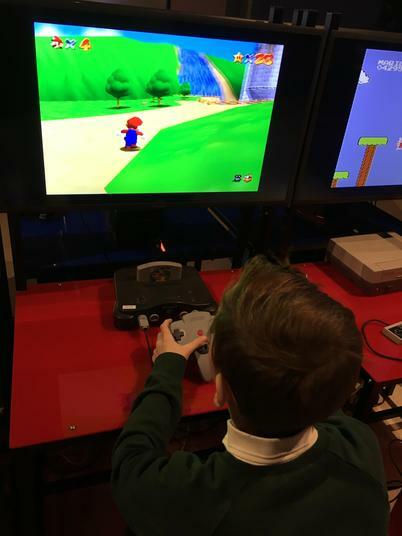 The children have made a wonderful start on their games consoles today and they look amazing already! 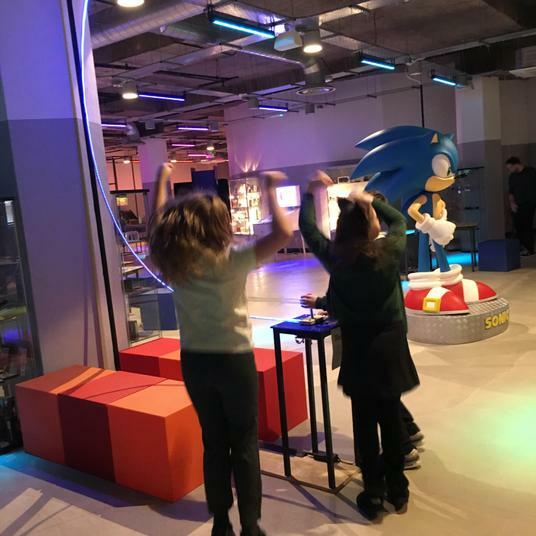 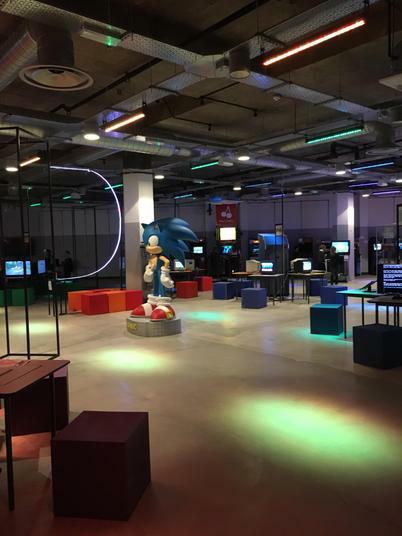 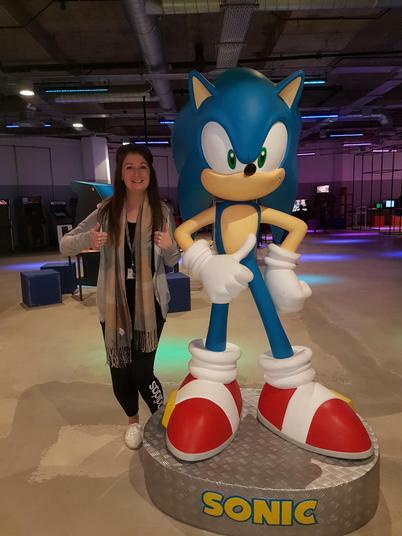 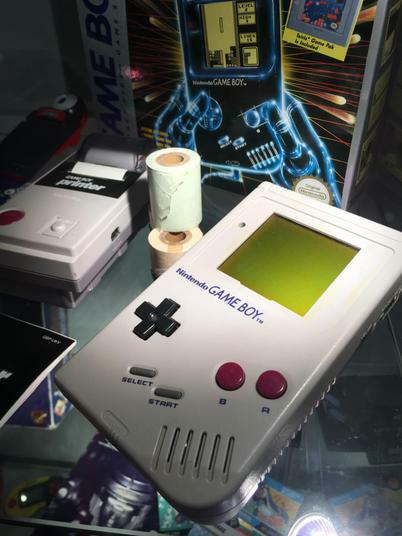 We are really looking forward to our trip to the Videogame Museum on Thursday to get some more inspiration. 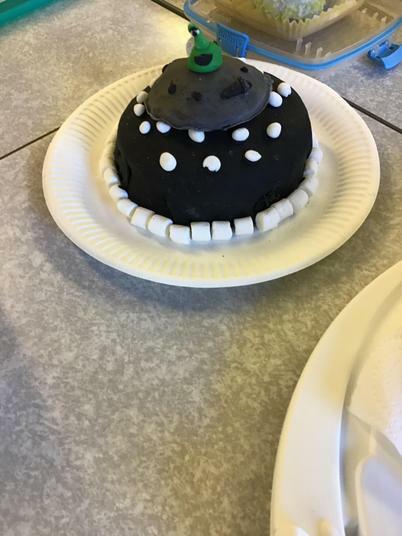 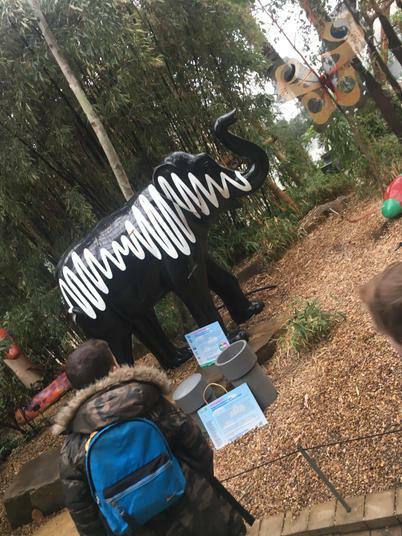 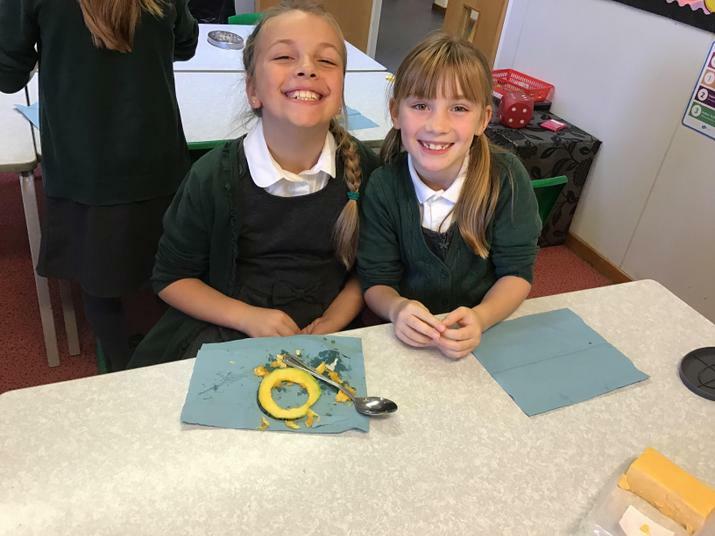 The groups have worked really well together using a wide range of materials and have all generated their own unique designs. 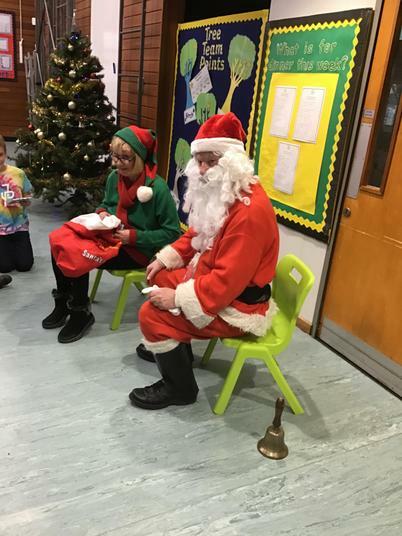 Thank you to the grown ups for supplying some of the materials for the children. 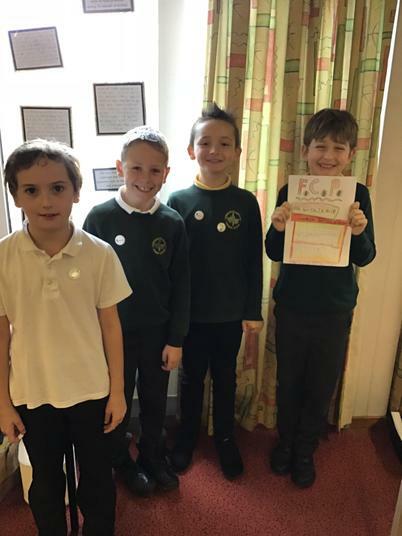 Just before the Christmas holidays, the children created a list of all the 'non-negotiables' that they believe should always be in every piece of writing they do. 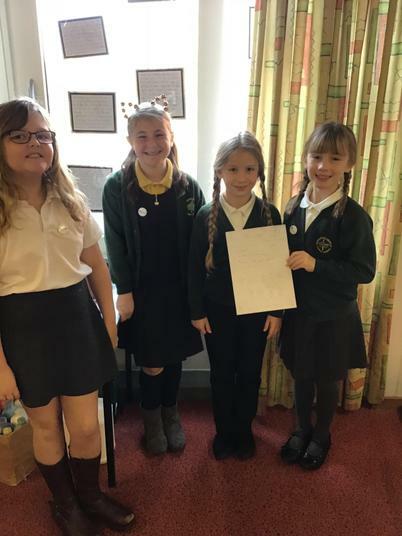 They created the list themselves and we have made their ideas into a display full of potions - if they include all of the potions available, they will have a wonderful piece of writing at the end! 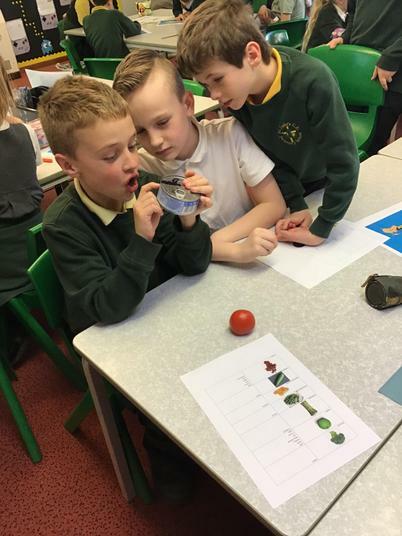 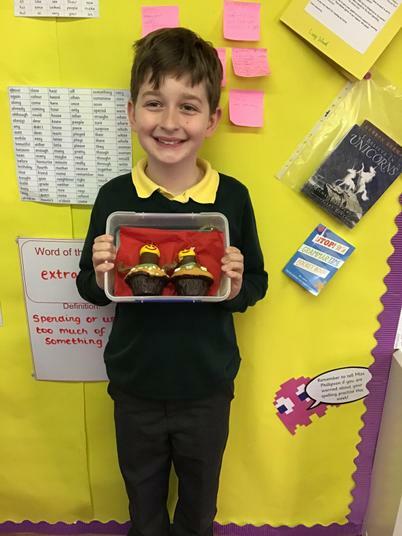 These potions include ideas such as accurate capital letters and full stops, correct Standard English and a variety of sentence structures to name but a few. 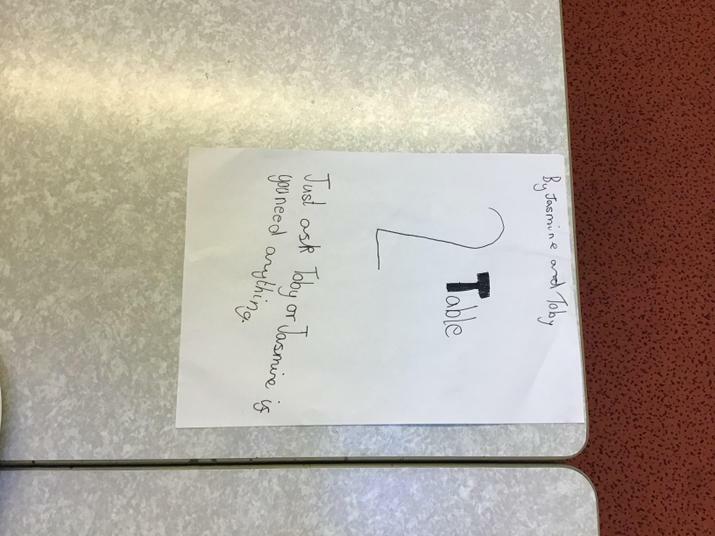 Feel free to pop into class and check out what is needed for a wonderful piece of writing! 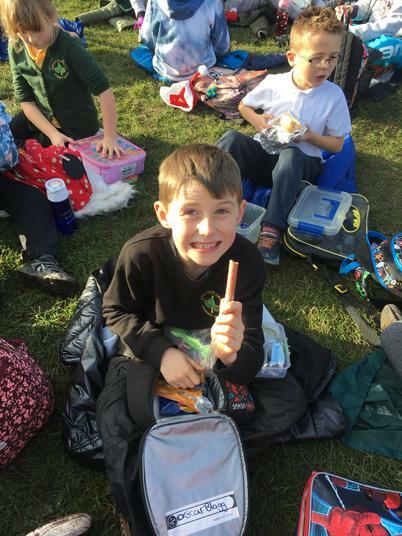 Welcome back to what will be another wonderful term full of learning and experiences for the children! 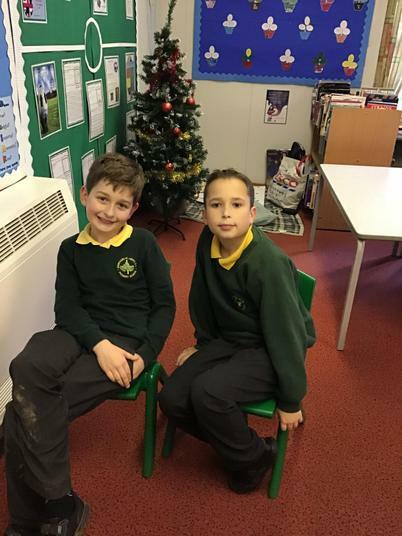 Our reading area has been updated (see pictures below) to include a range of the children's literacy work and their opinions about good and not so good books. 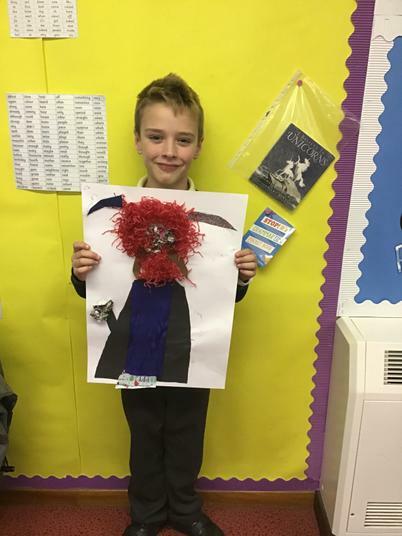 Reading creates so many opportunities for children and allows them to broaden their knowledge of the world as well as expanding their own imaginations and it really comes across in writing when the children have a great exposure to different texts. 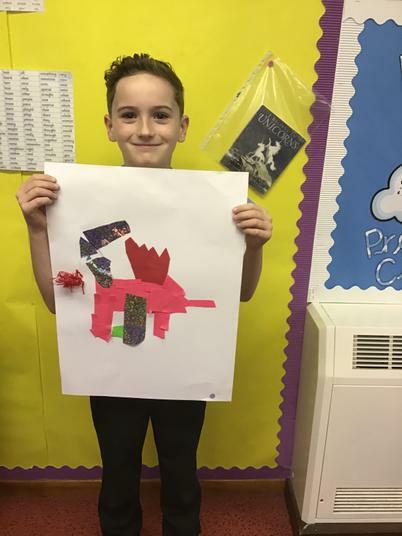 We have lots of books on our shelves here in class and around school, but if children could also read at home alongside their weekly three reads for their learning leaf they will reap the benefits! 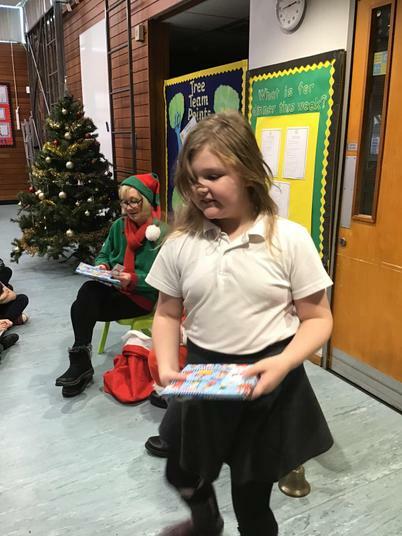 If you or your children wish to borrow any books from school please feel free to ask. 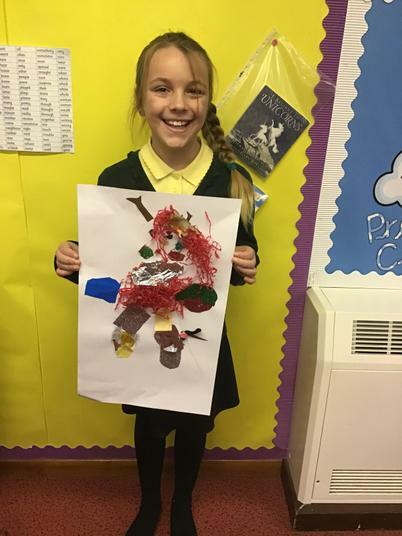 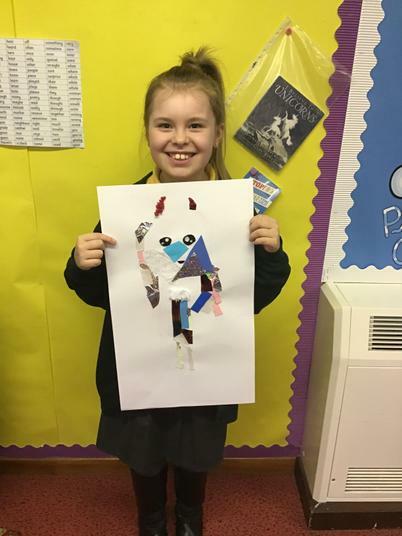 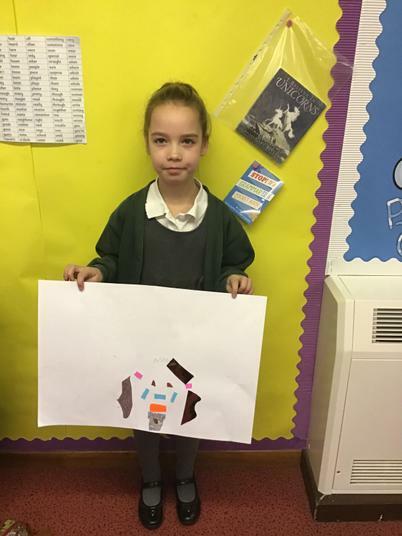 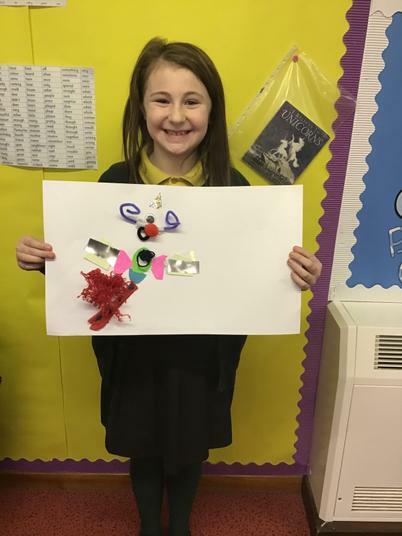 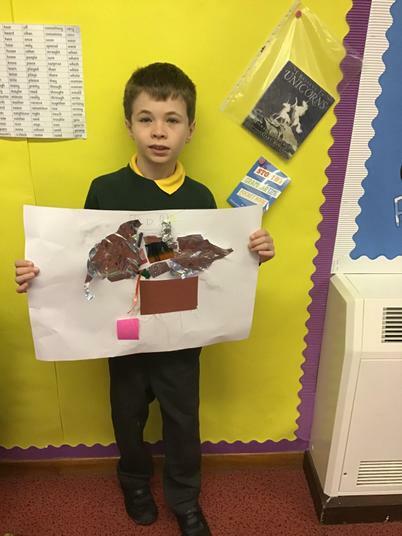 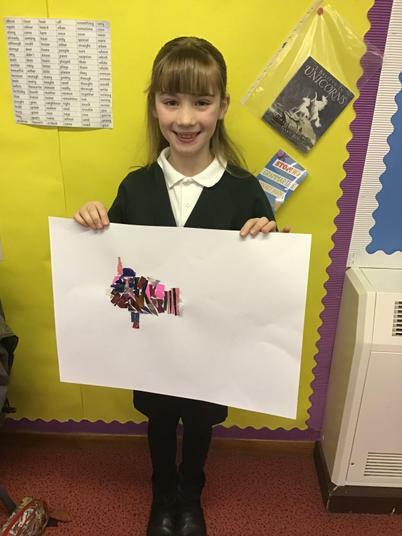 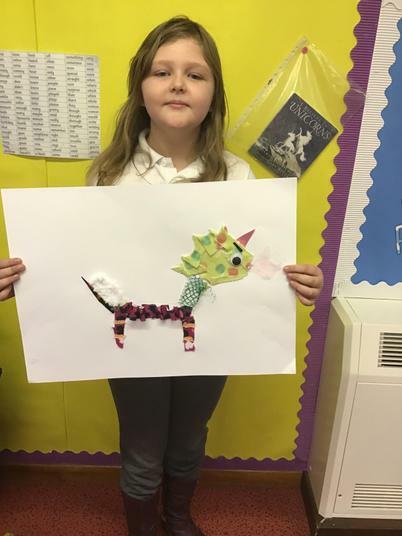 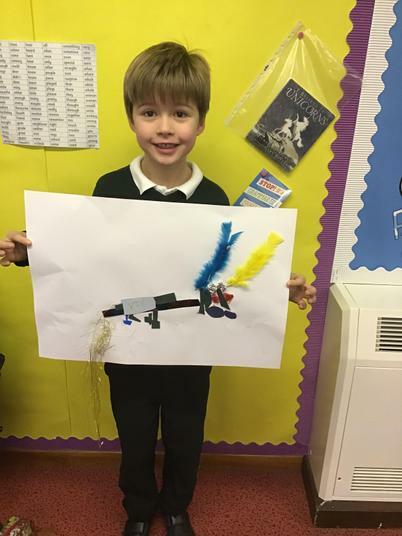 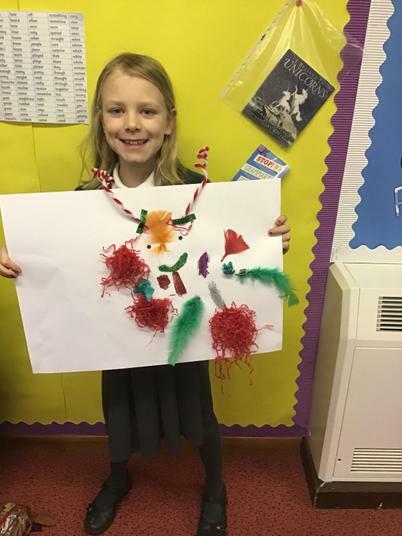 This week our topic of mythical creatures has come to a spectacular end in the creation of our creature collages! 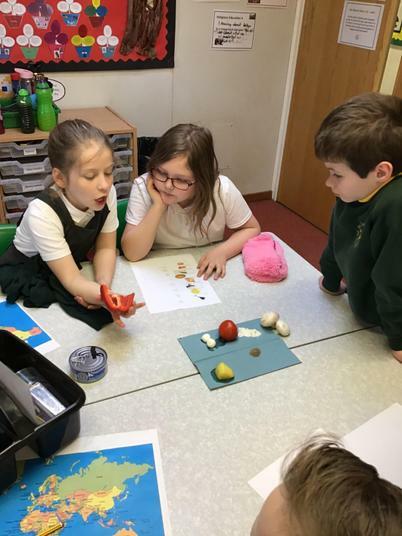 Thank you to all of the grown ups who provided some fabulous materials for the children to use in their work. 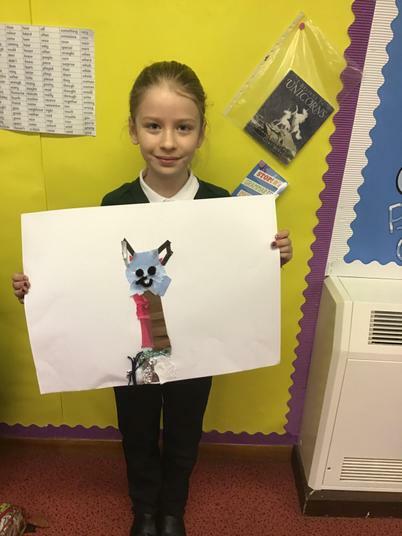 The results of the collages can be seen below. 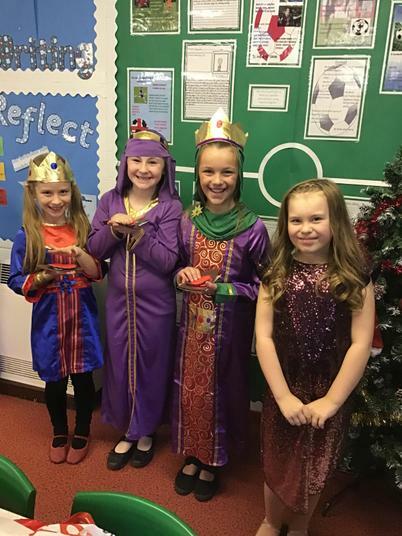 Thank you to everyone who came to watch our performance of 'Straw and Order' yesterday and for the costumes you provided for the children - they all looked amazing! 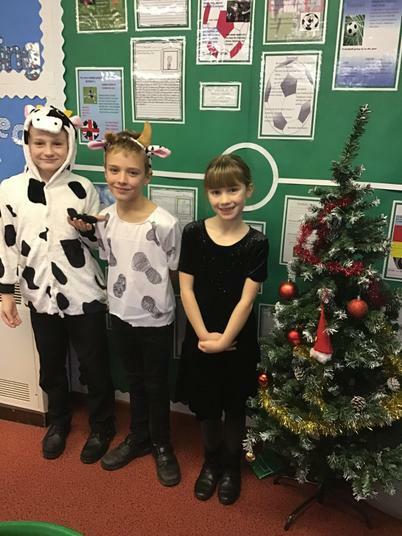 I was so proud of how they all performed and how they delivered their lines alongside the songs and the dances too. 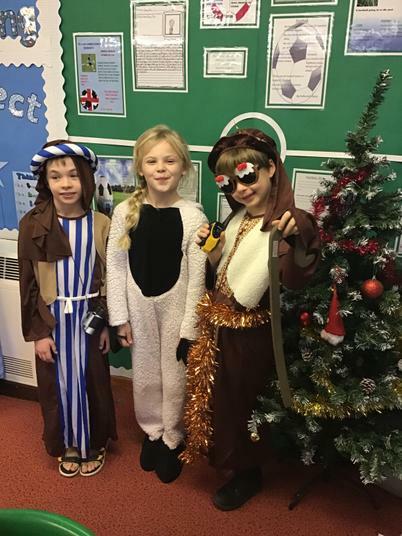 We all had lots of fun and the photos of the children in their costumes are below. 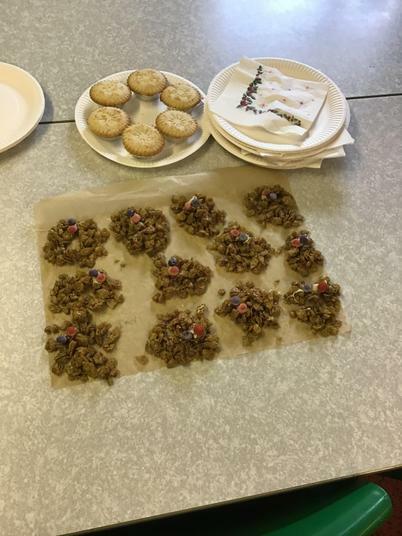 Christmas Wreath and Mince Pie Afternoon! 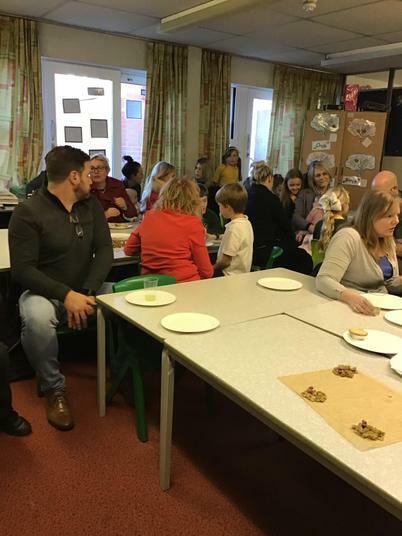 Thank you to all of the grown ups who came to our Christmas Wreath afternoon on Friday! 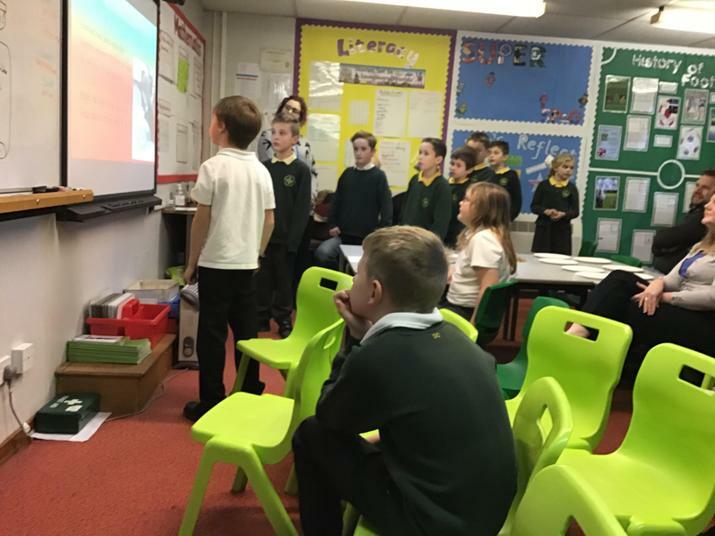 The children had a really lovely time in class with you and they also enjoyed presenting their work too. 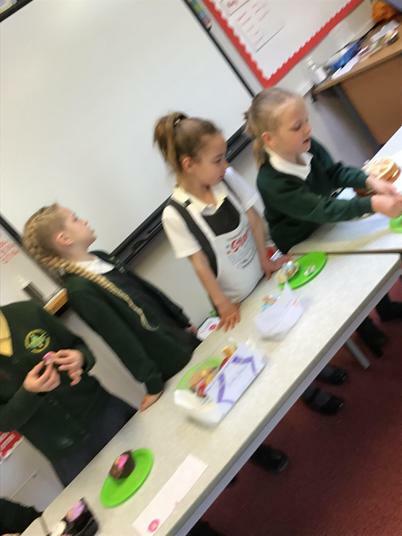 We hope you enjoyed tasting what we had made. 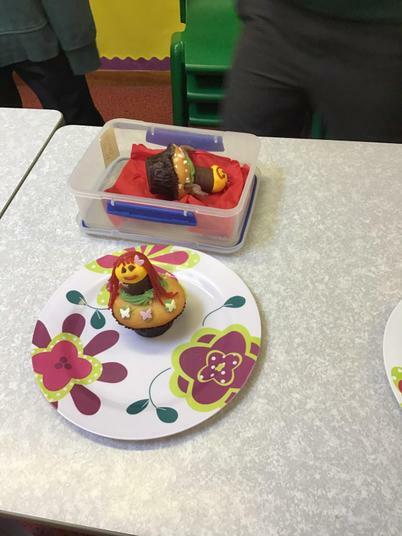 Below are some pictures (taken by the children!) 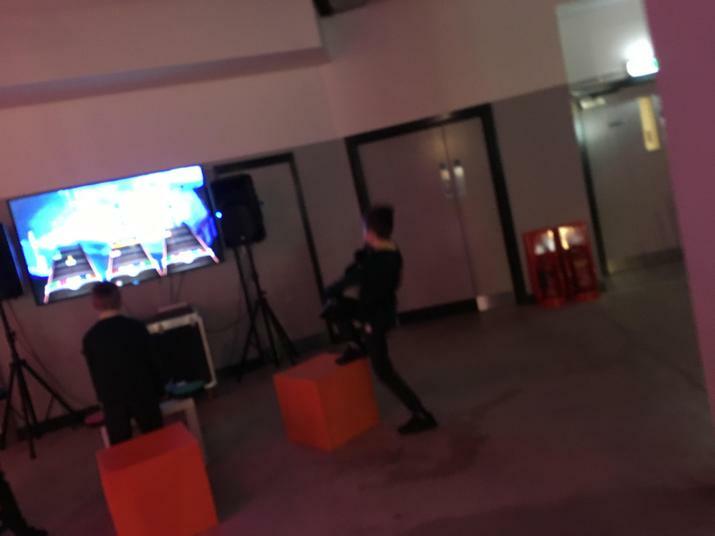 of the event. 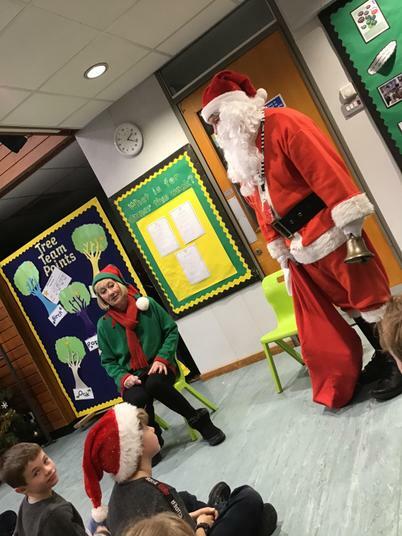 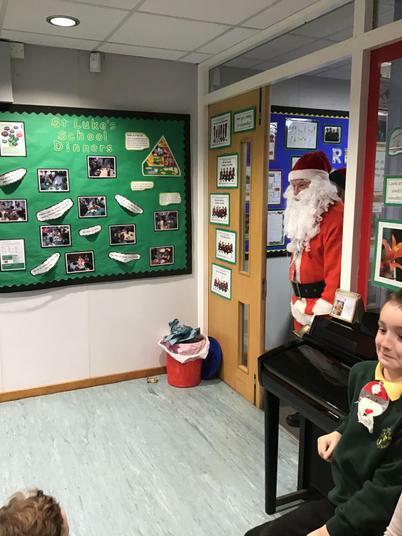 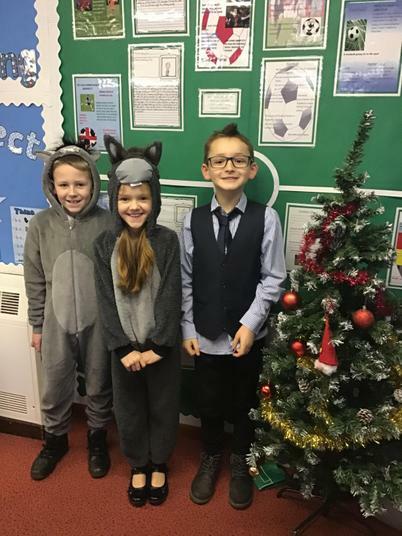 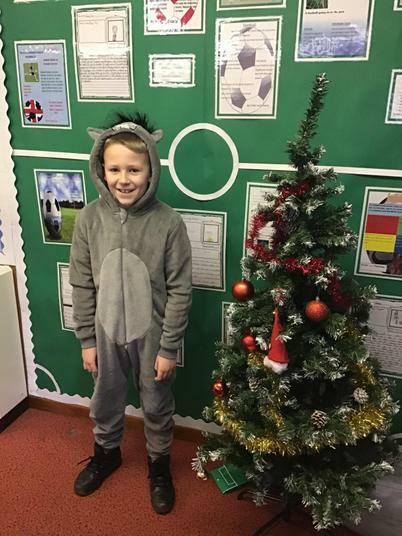 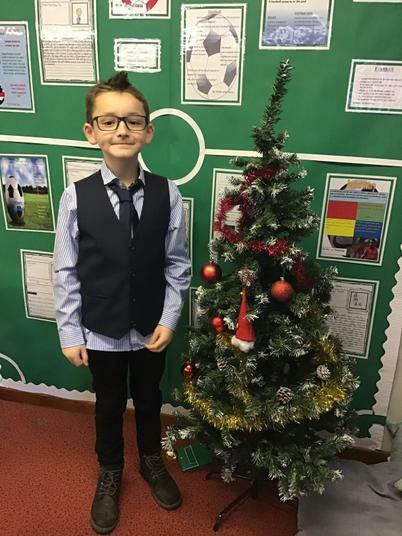 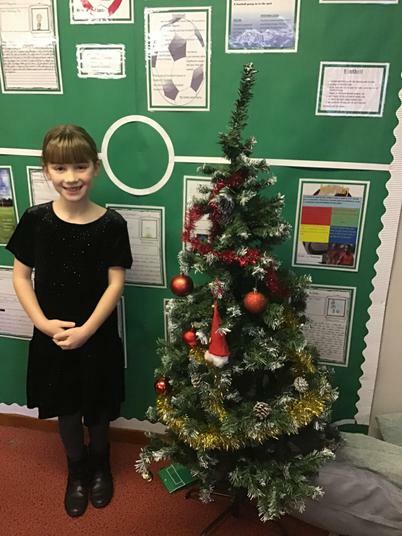 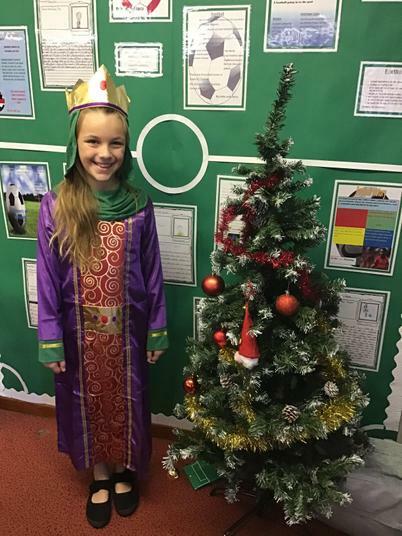 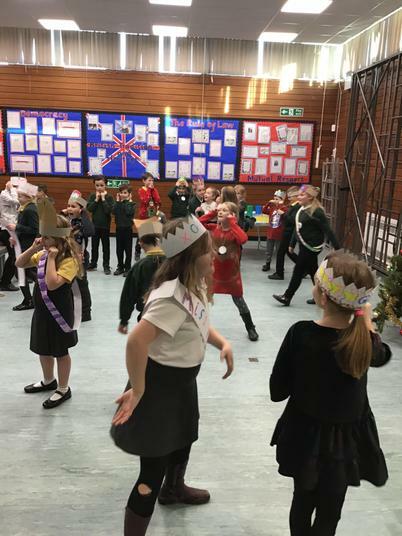 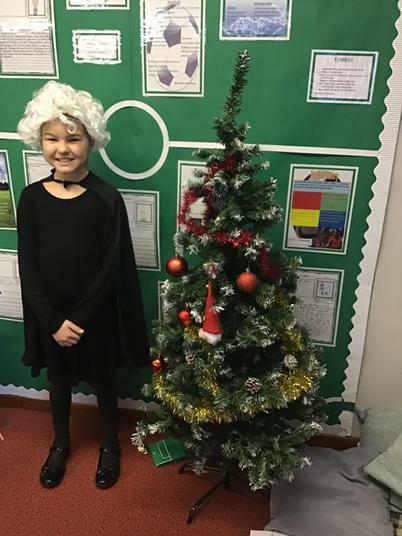 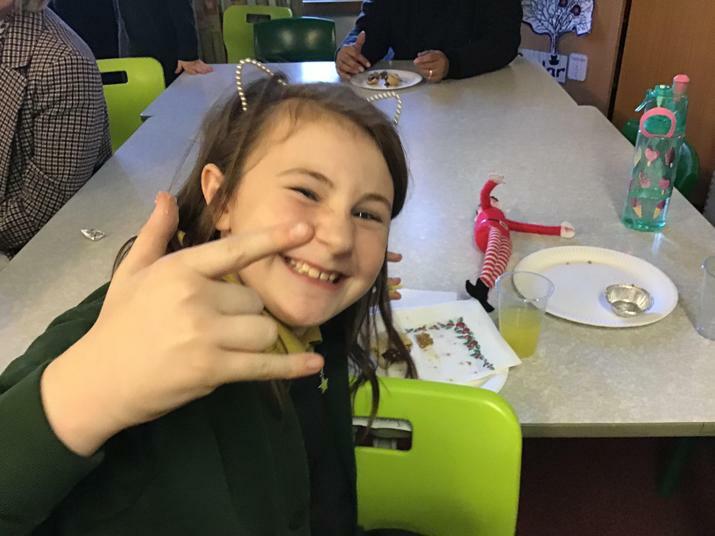 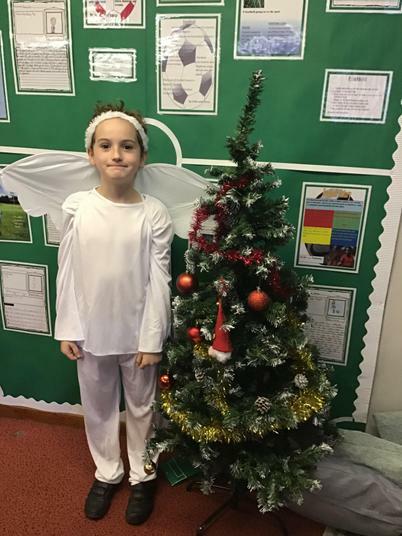 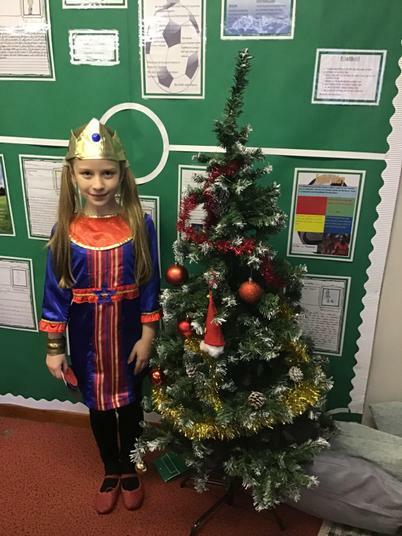 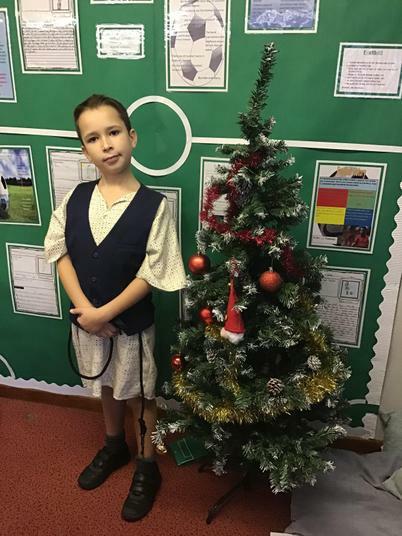 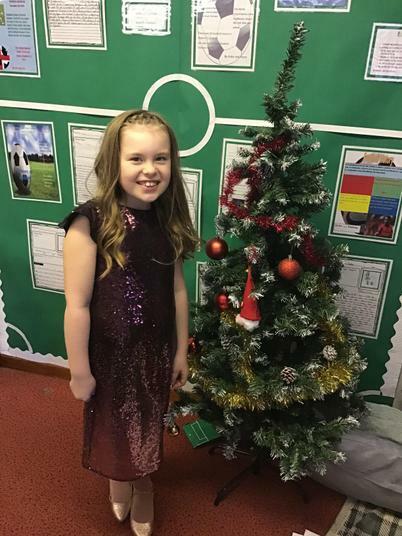 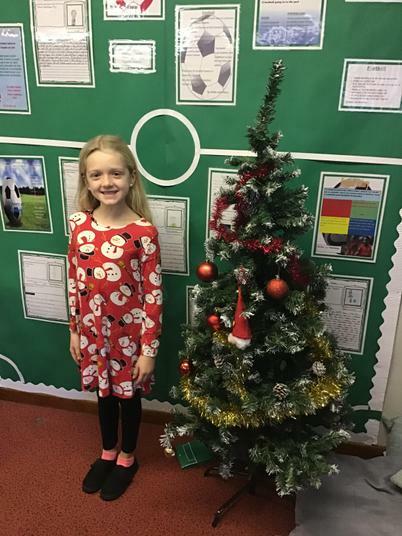 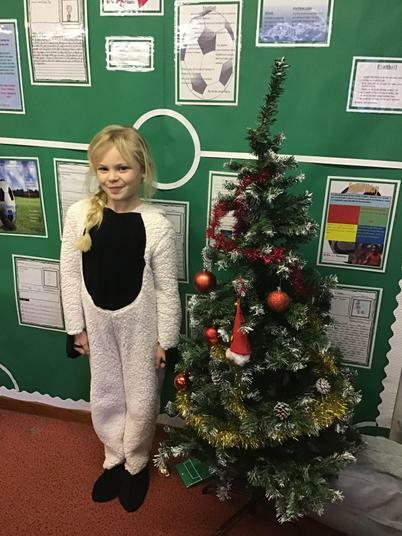 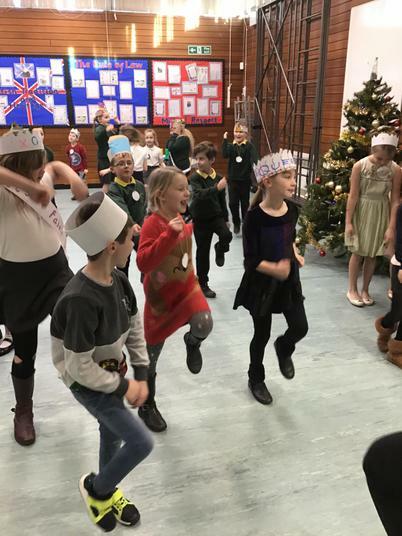 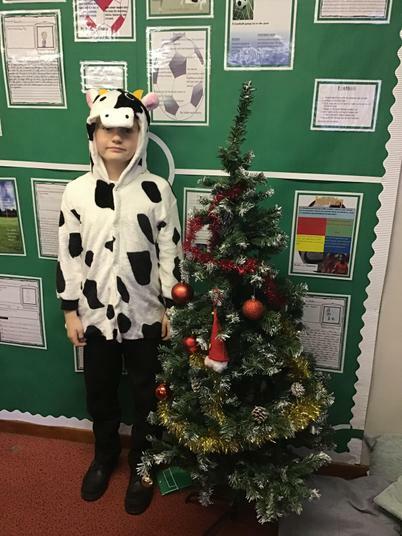 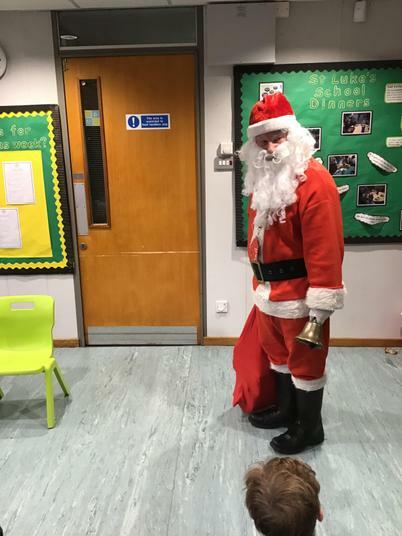 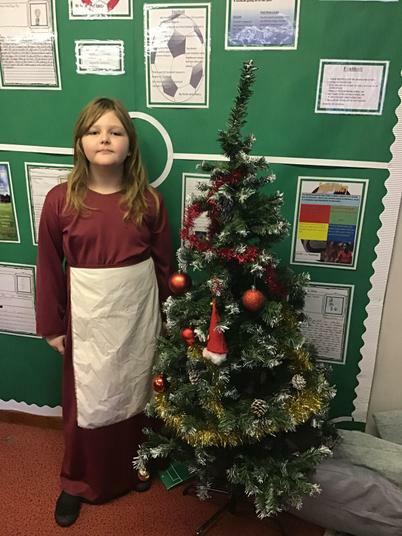 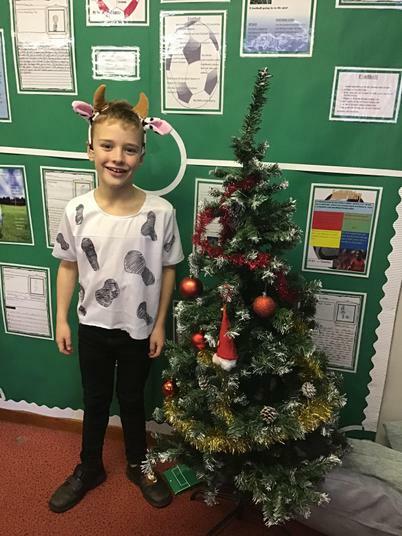 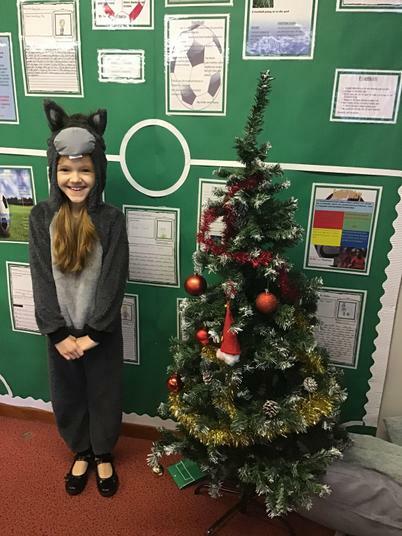 This week in Thoresby Class we have been getting into the Christmas spirit! 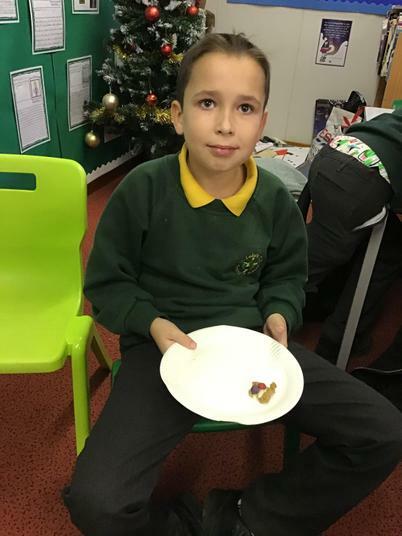 We started the week with our Christingle service, which Reverend Lima also attended. 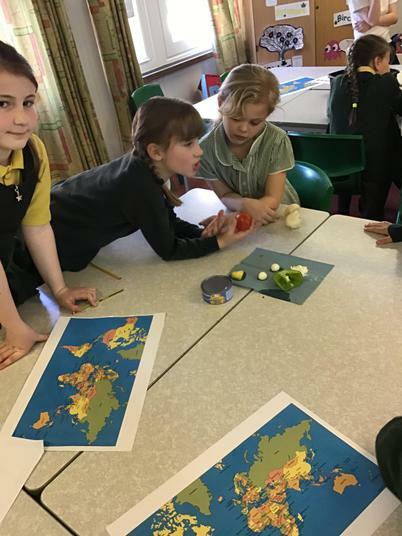 We were able to create our oranges that represent the world and these looked wonderful! 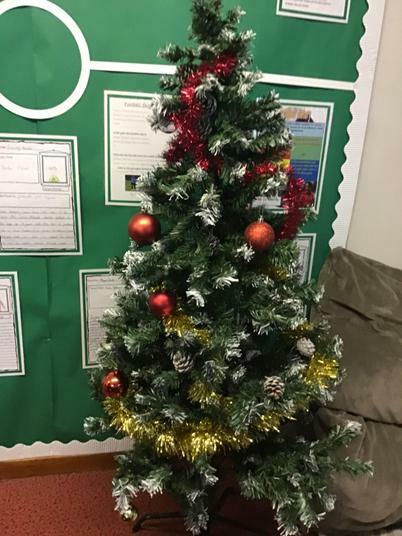 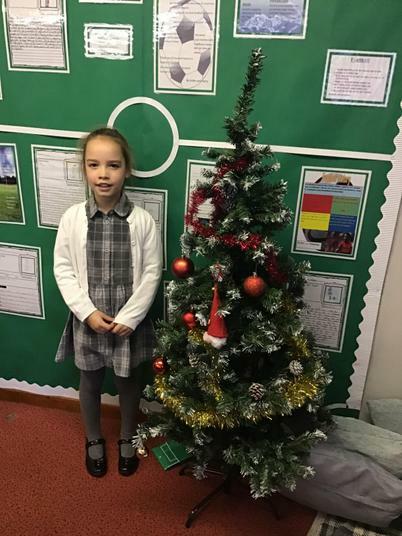 Today we have been creating Christmas cards and putting our class tree up in the classroom - if you would like to create any baubles with your children or donate some to the class they would be very gratefully received. 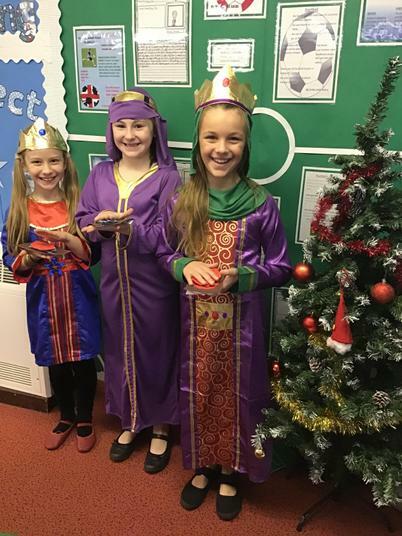 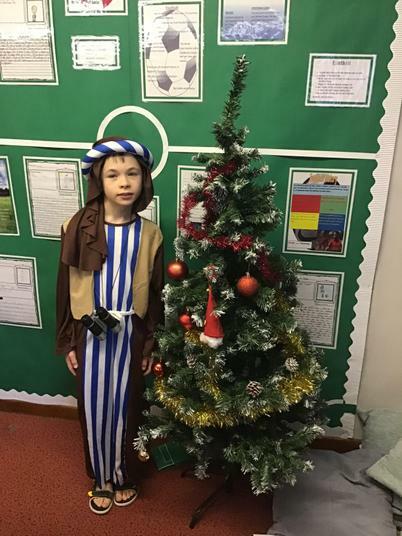 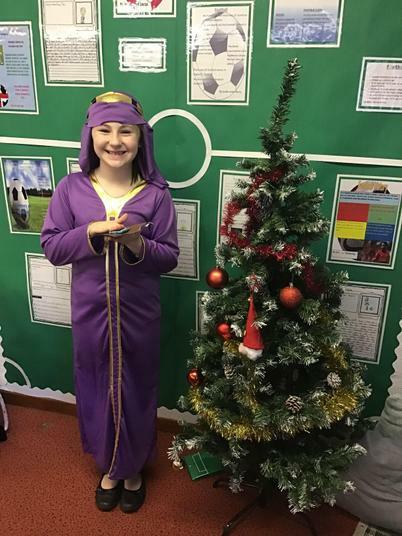 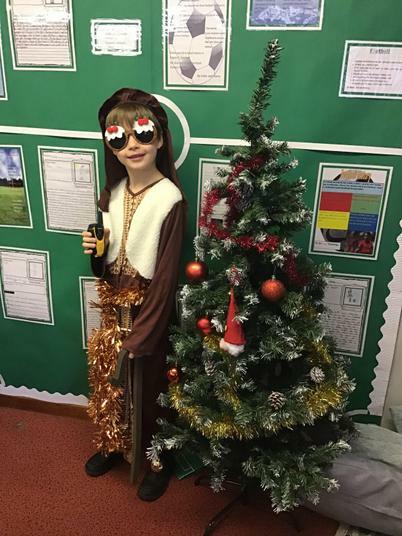 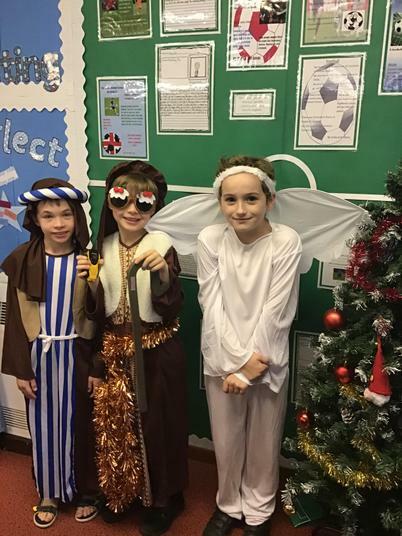 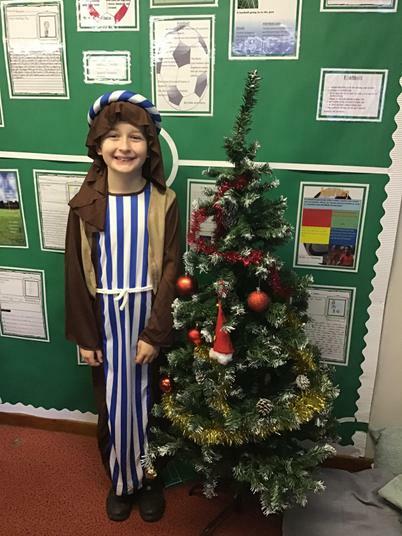 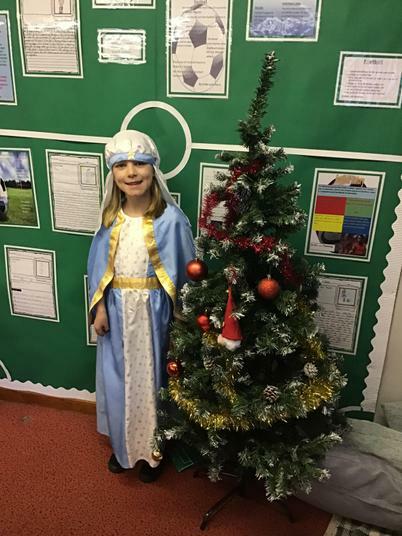 Alongside all of this we have been practising for our nativity, which is next Thursday at 6pm and everyone is doing a fantastic job with their lines! 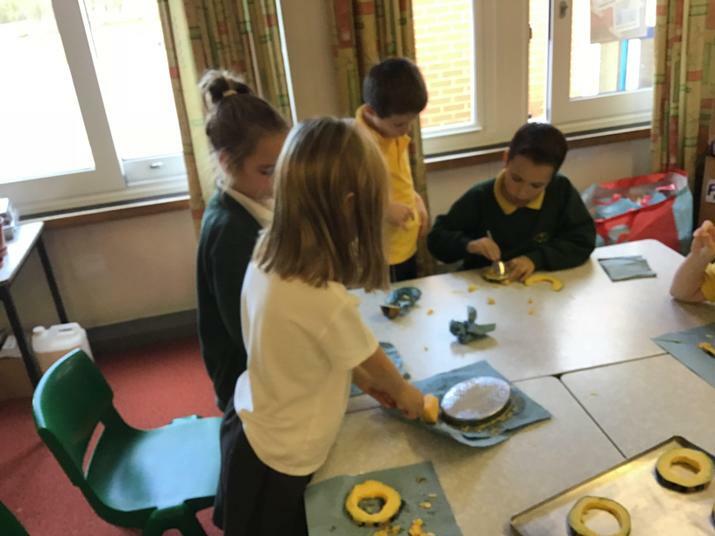 We will be making our Christmas wreaths tomorrow too ready for our event on Friday afternoon - we hope to see you all there! 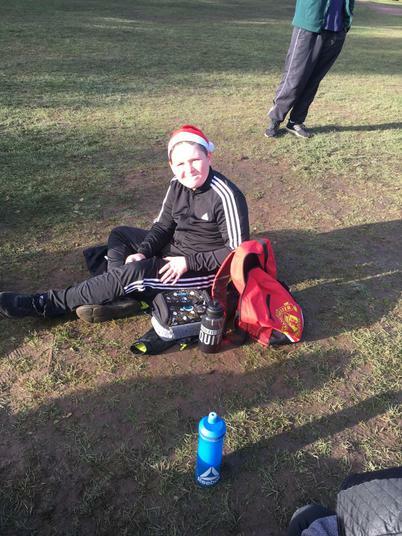 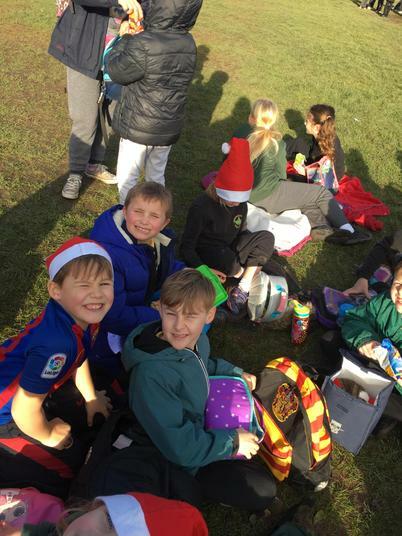 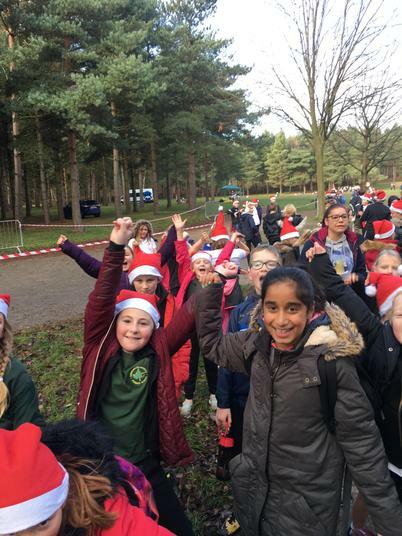 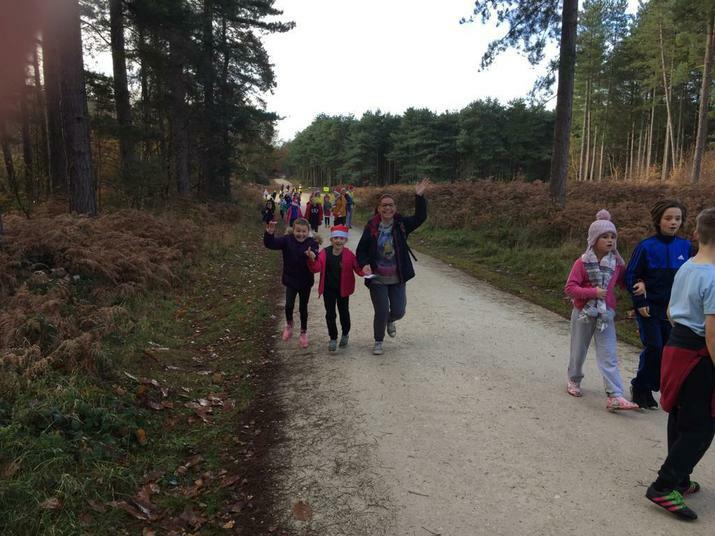 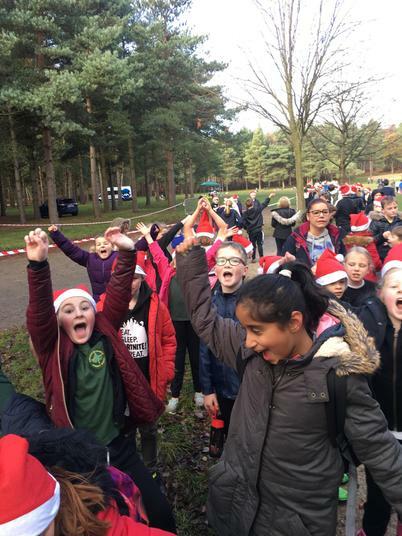 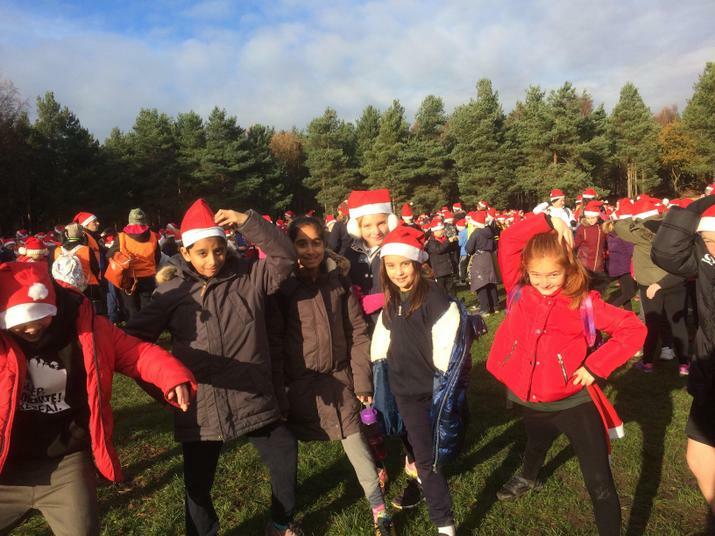 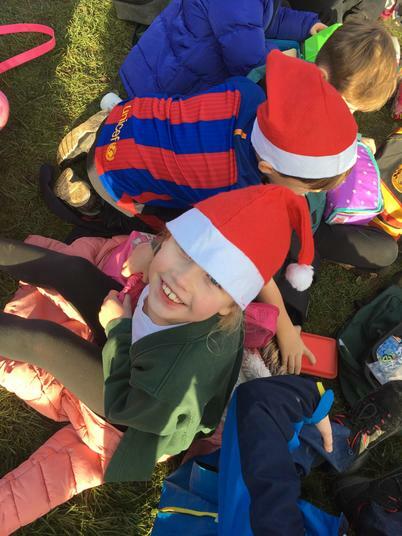 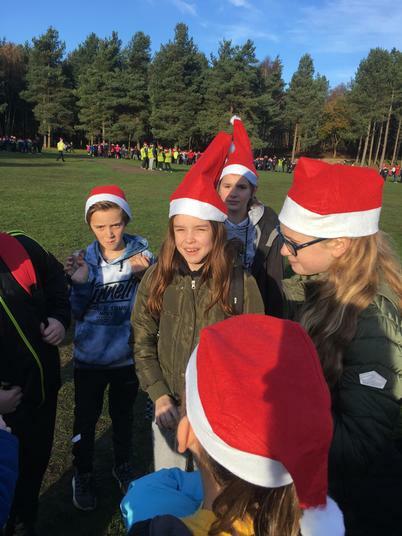 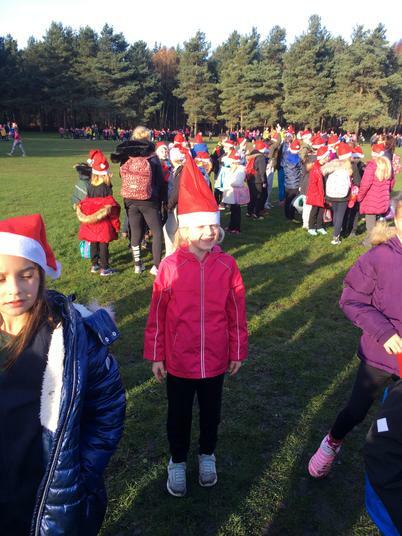 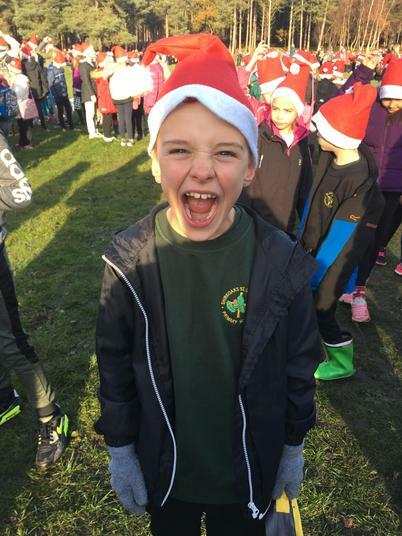 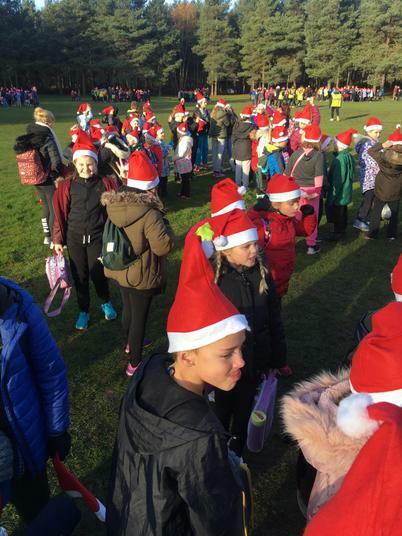 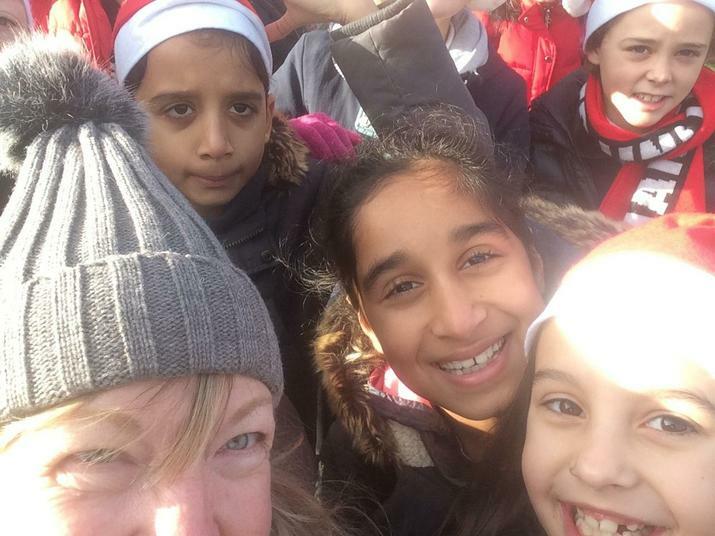 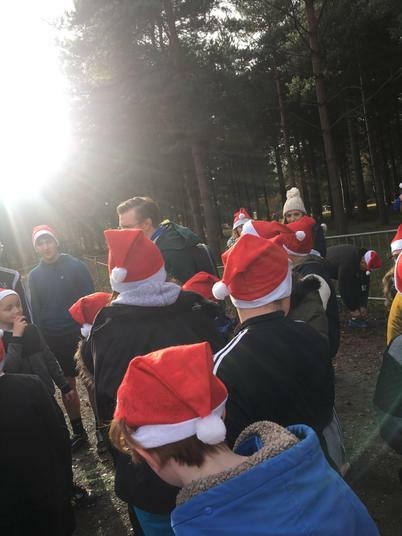 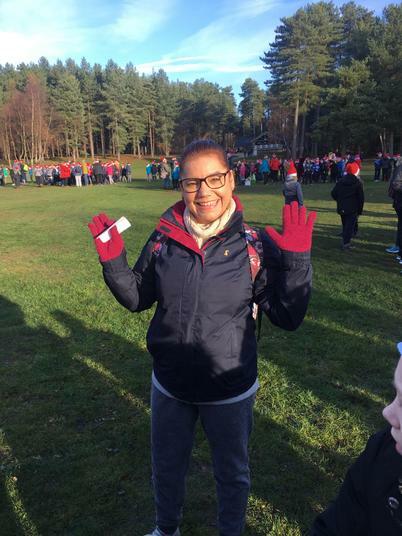 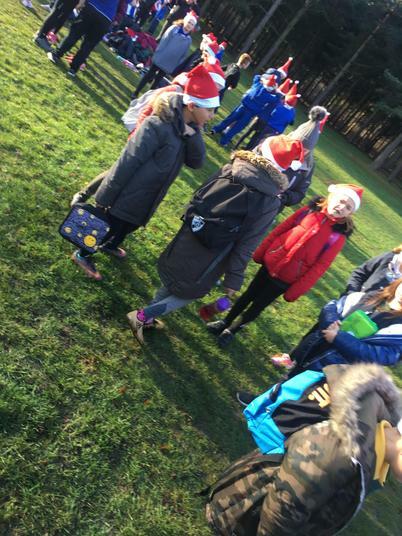 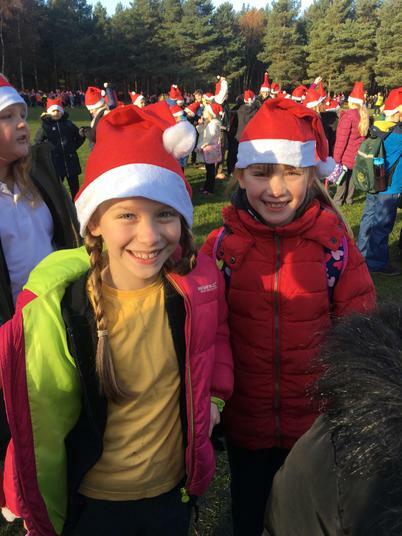 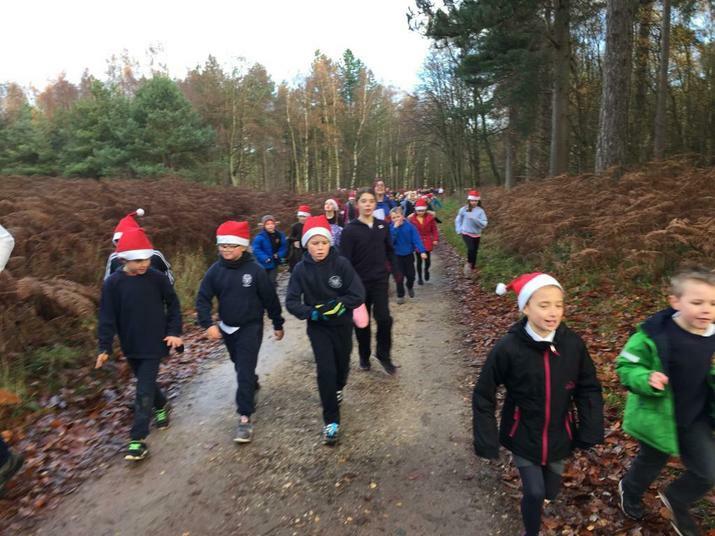 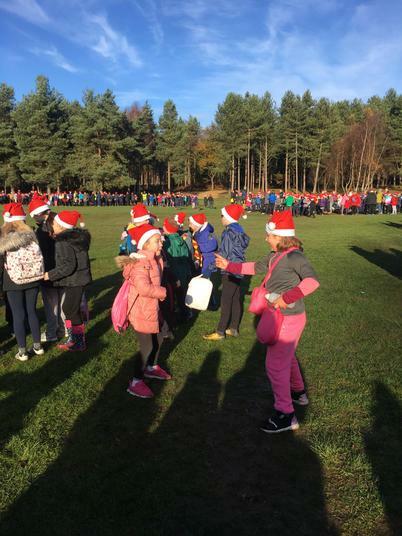 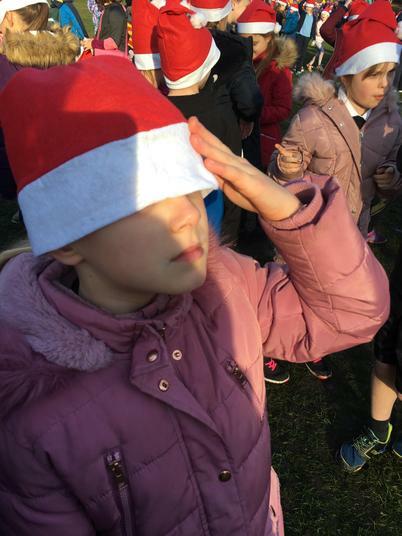 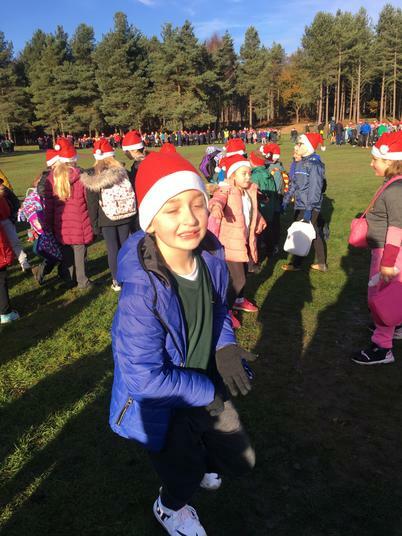 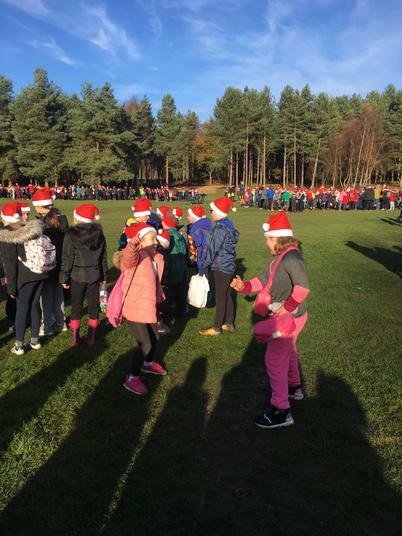 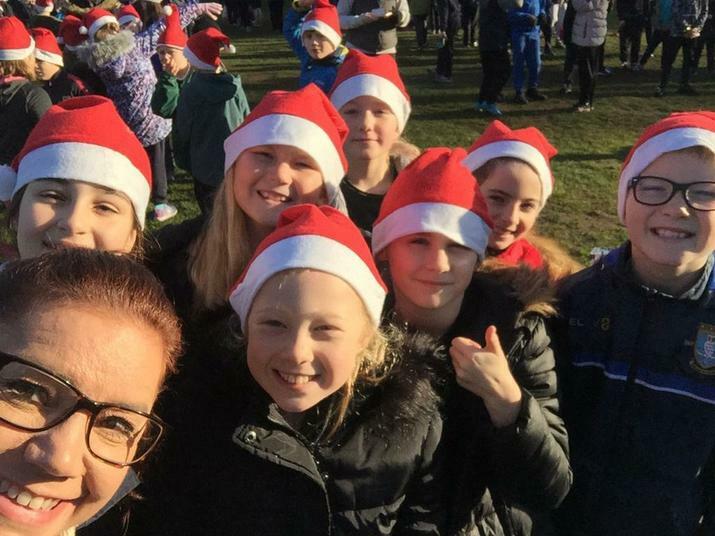 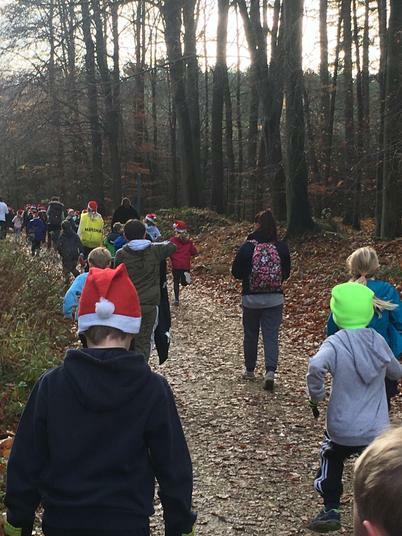 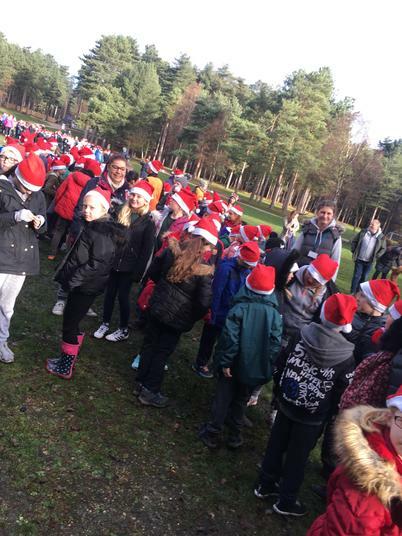 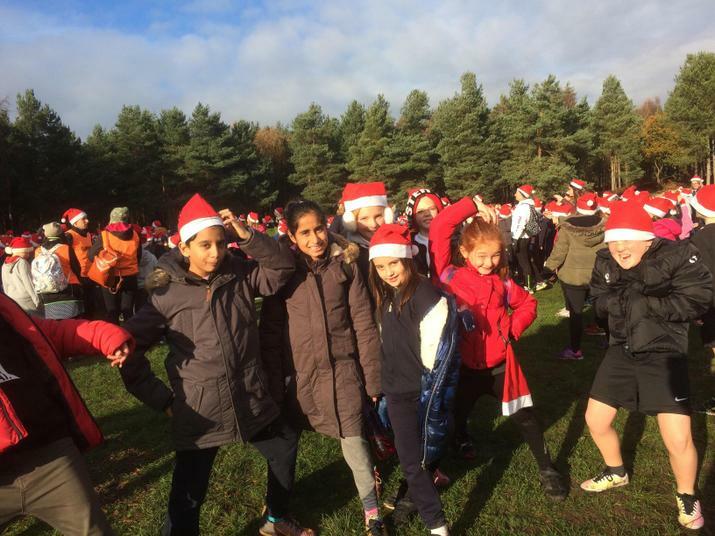 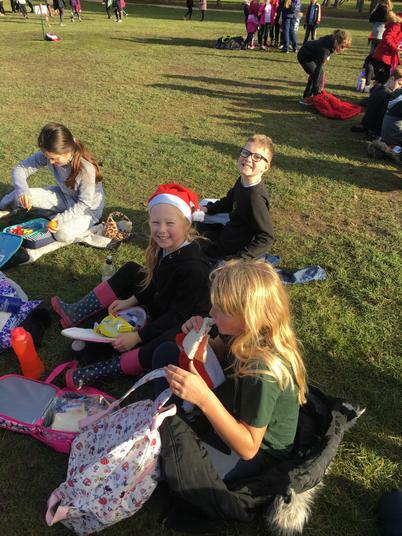 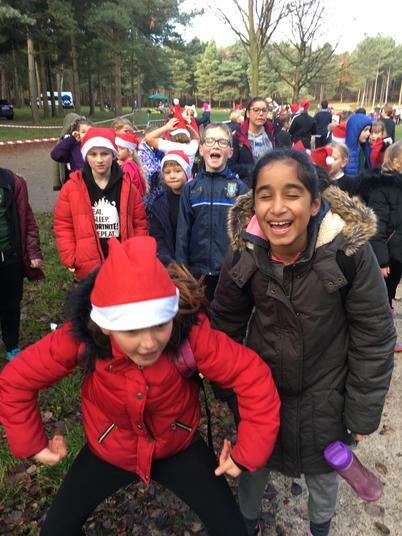 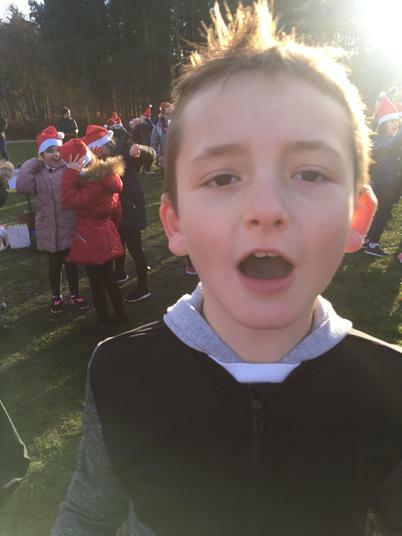 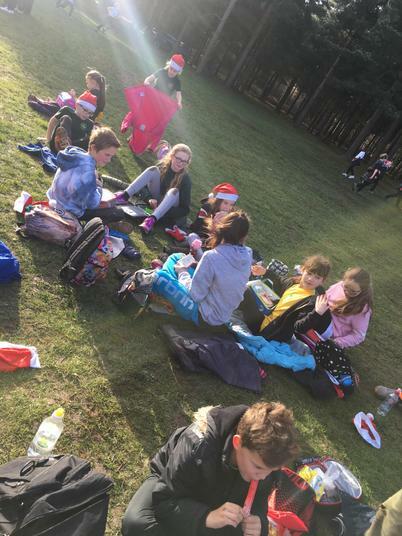 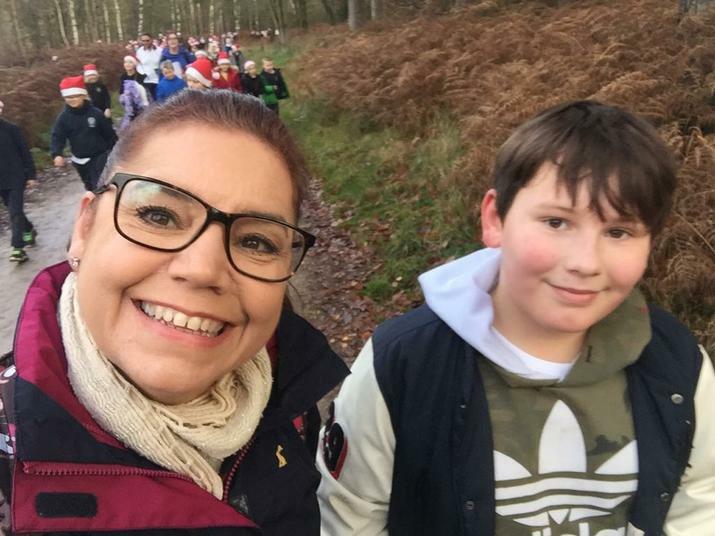 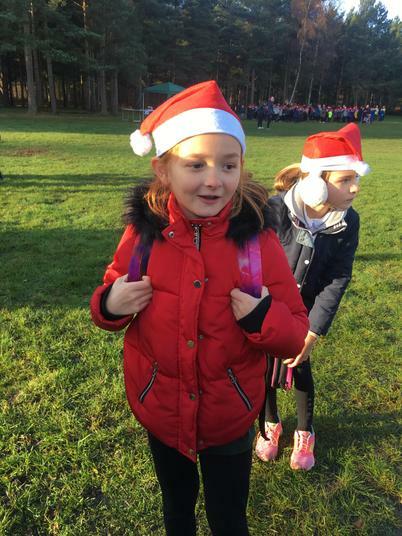 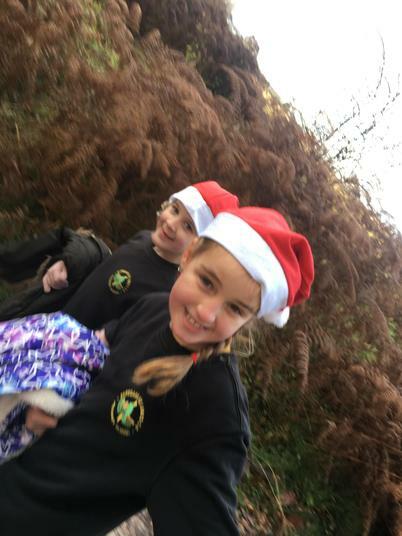 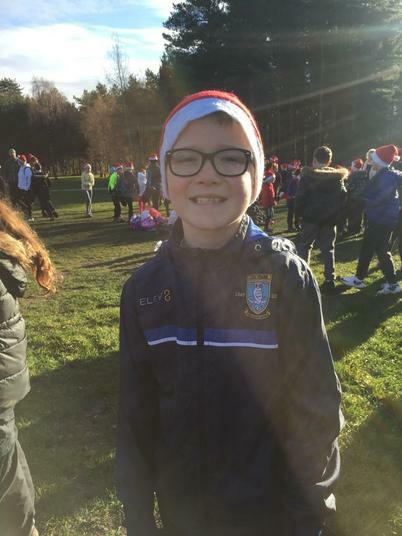 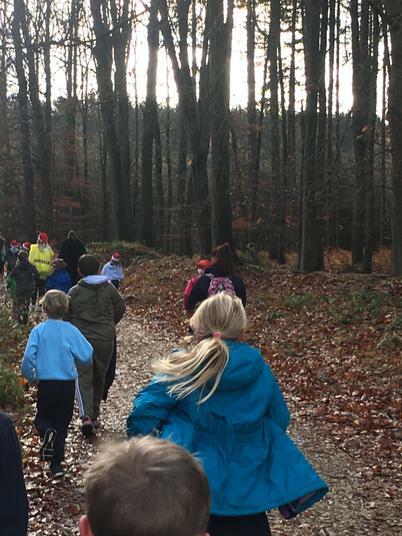 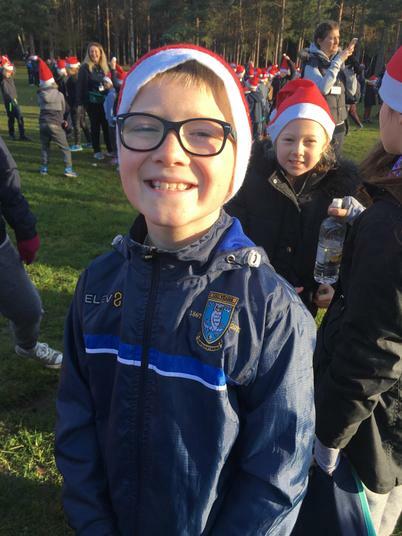 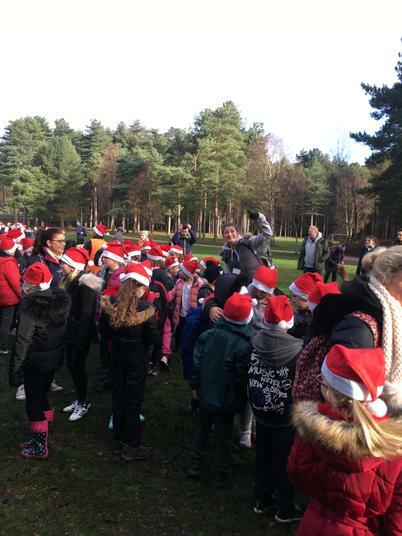 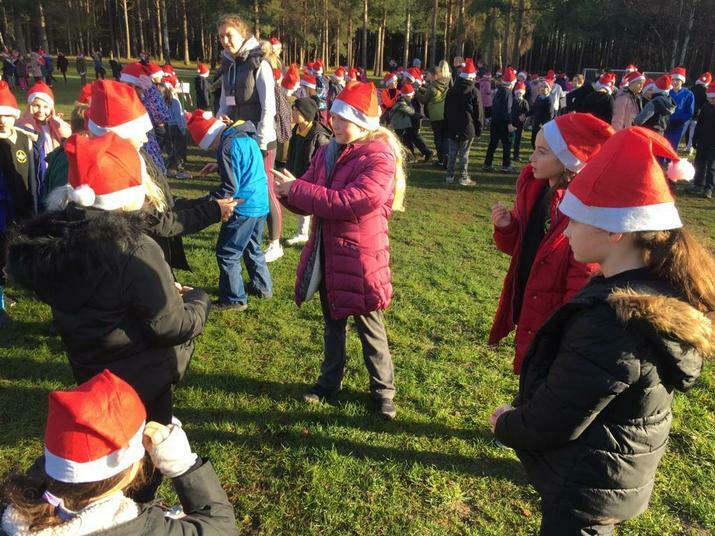 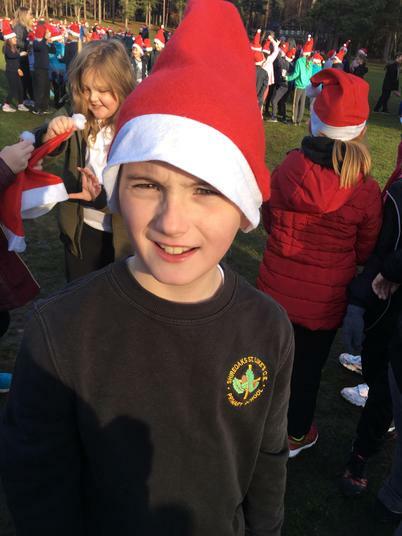 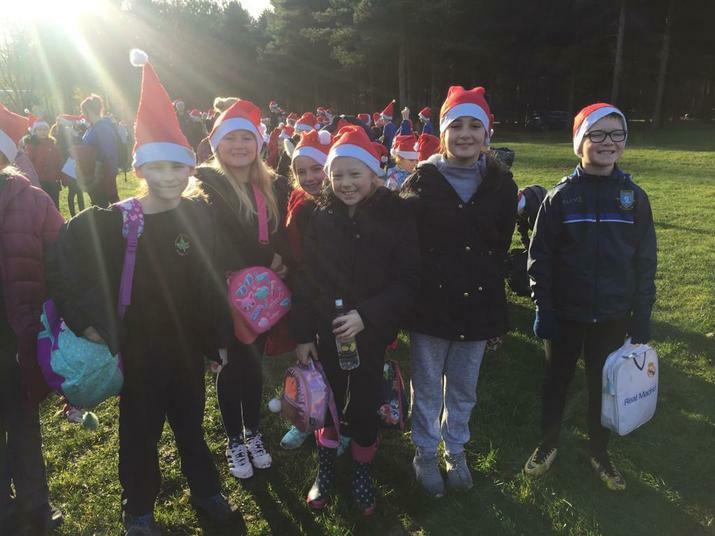 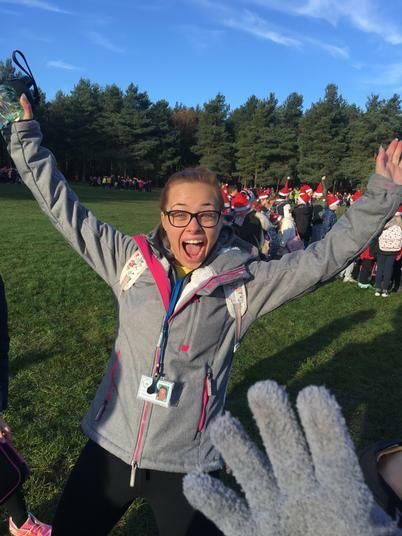 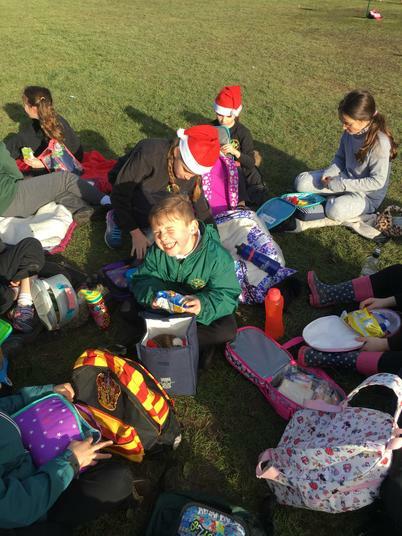 All children from KS2 took part in the Jingle Jog at Sherwood Pines on Monday. 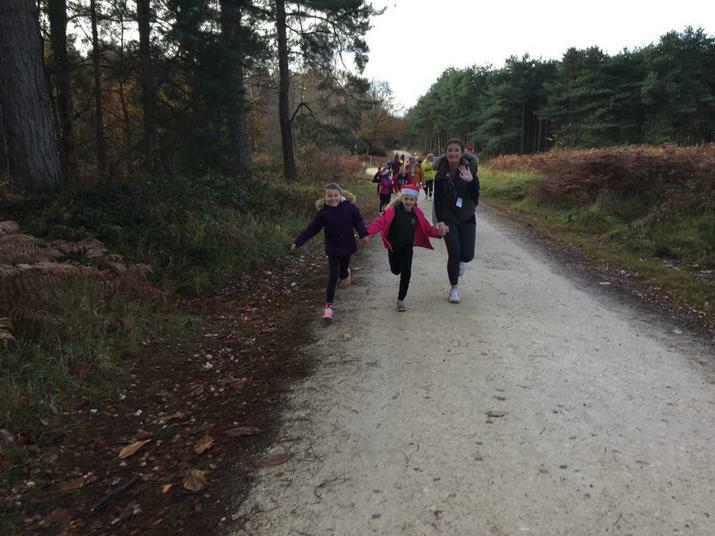 We had lots of fun and we ran 3km around the forest! 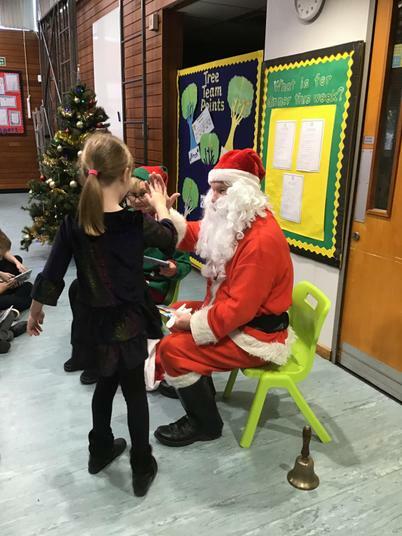 The children were really well behaved and all participated in the event really well, we are so proud of them all. 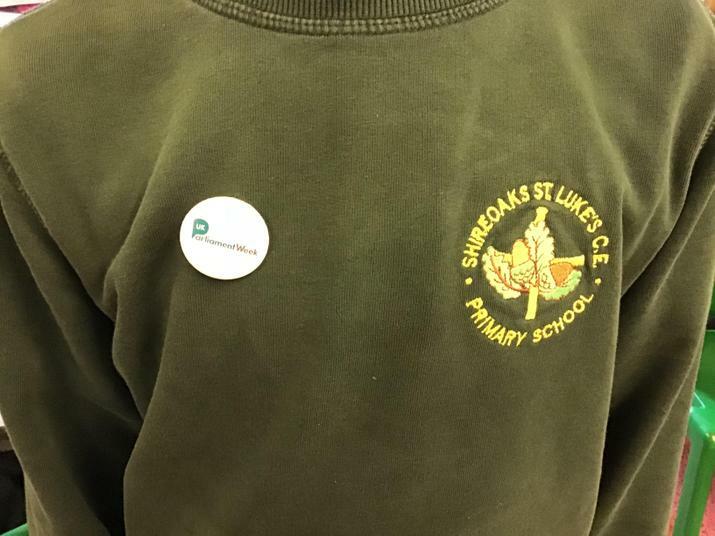 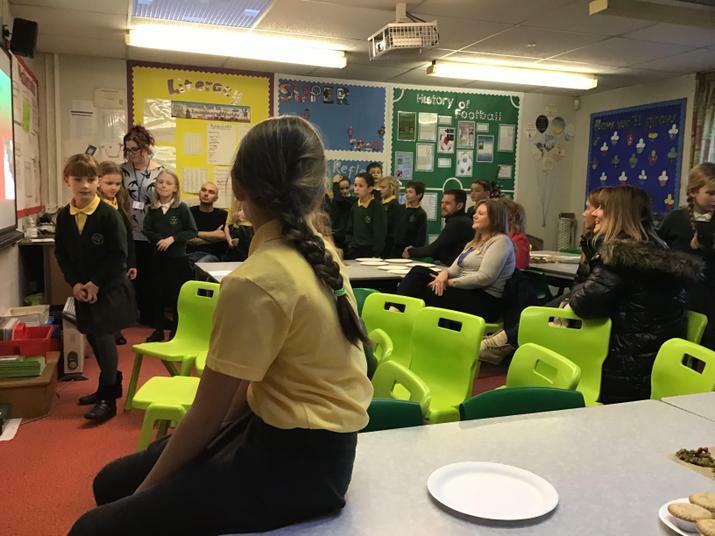 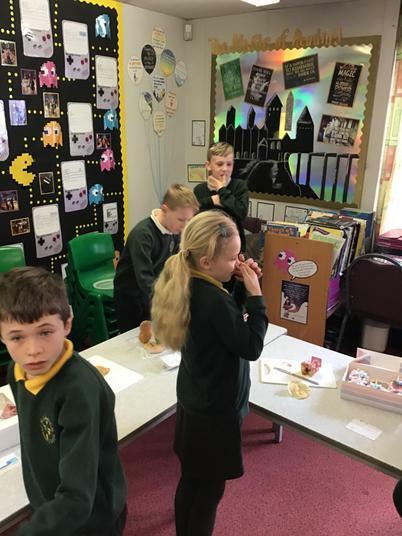 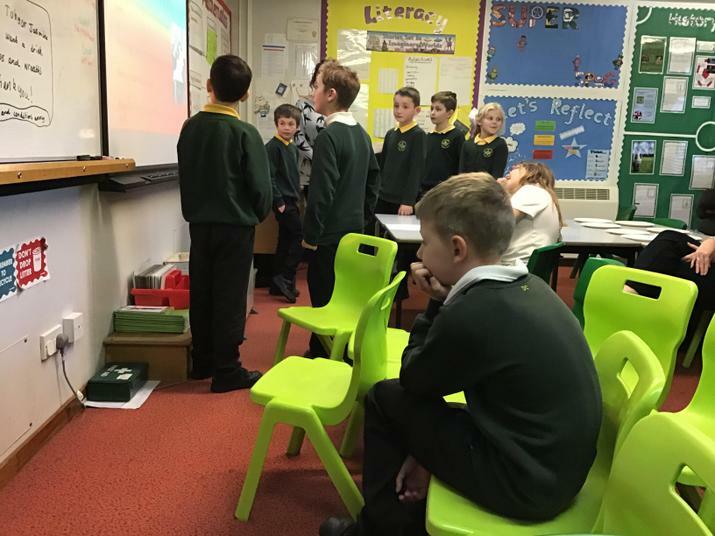 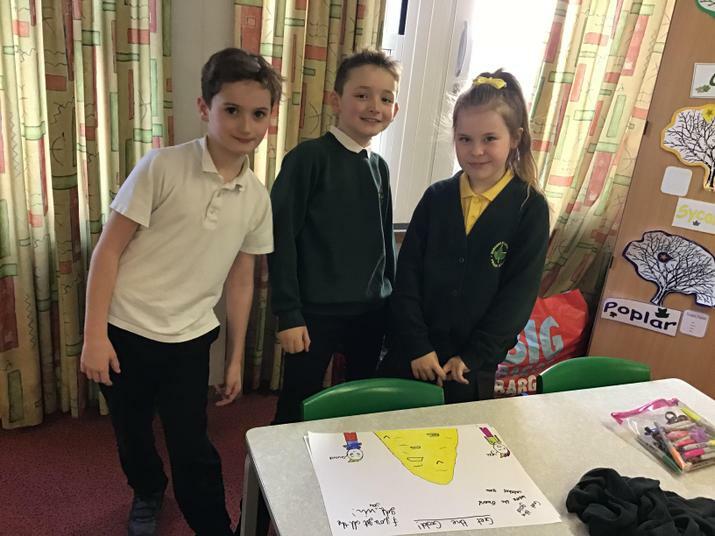 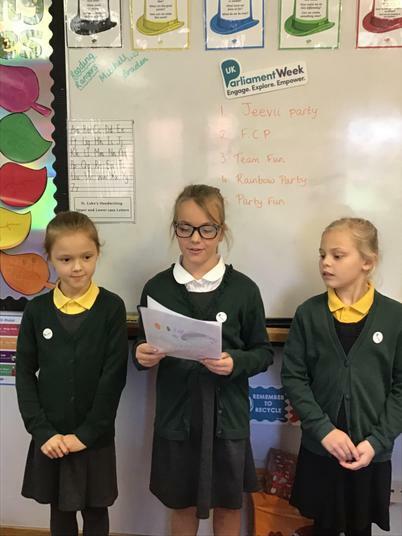 This week is UK Parliament week and in Thoresby Class we have been taking part in different activities to learn more about politics. 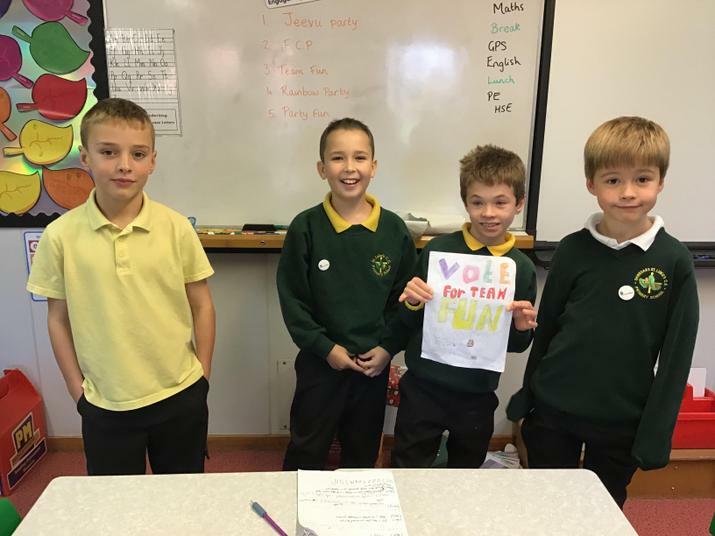 First we looked at how a policy on a manifesto actually gets passed as law and it turns out there are a lot of people who have to approve and debate each idea before it becomes law! 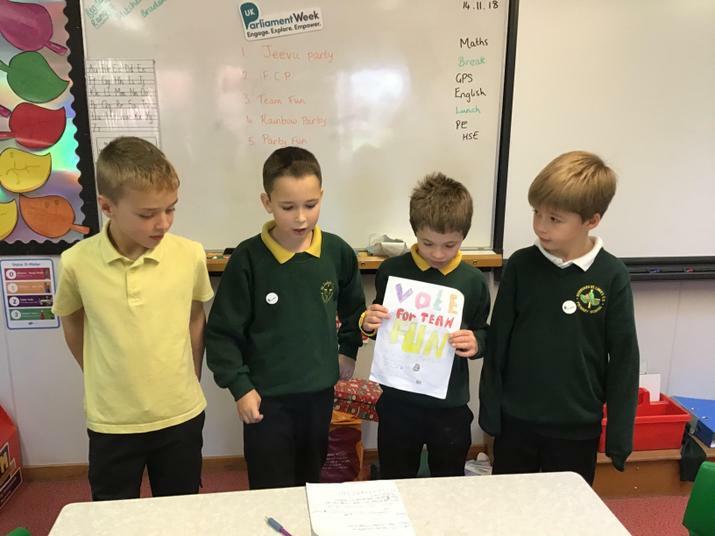 Then we worked in small groups and created our own campaigns, where we detailed what policies we would put in place if we were in charge of the school. 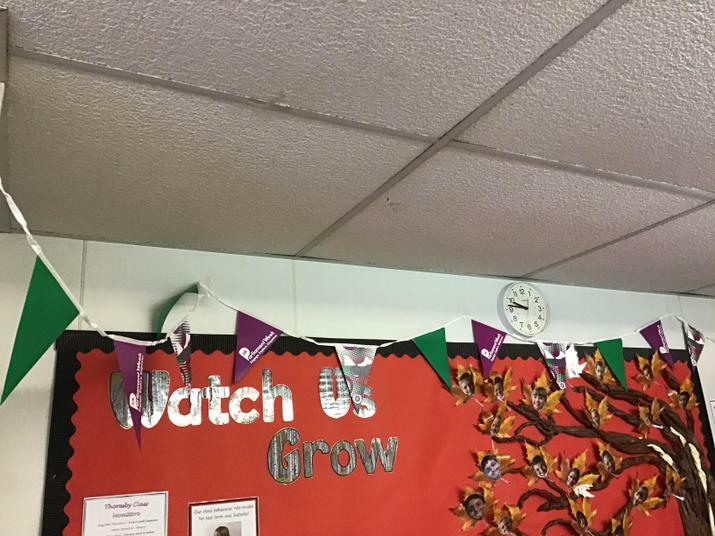 We created our policies and displayed these using posters that were placed around the room. 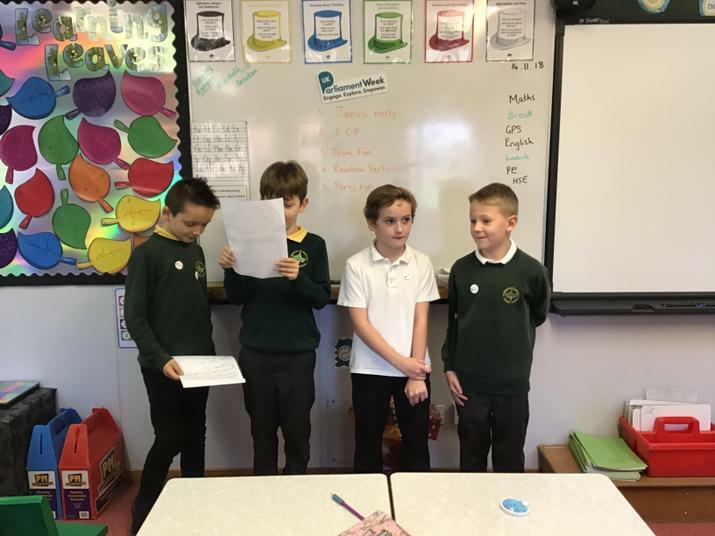 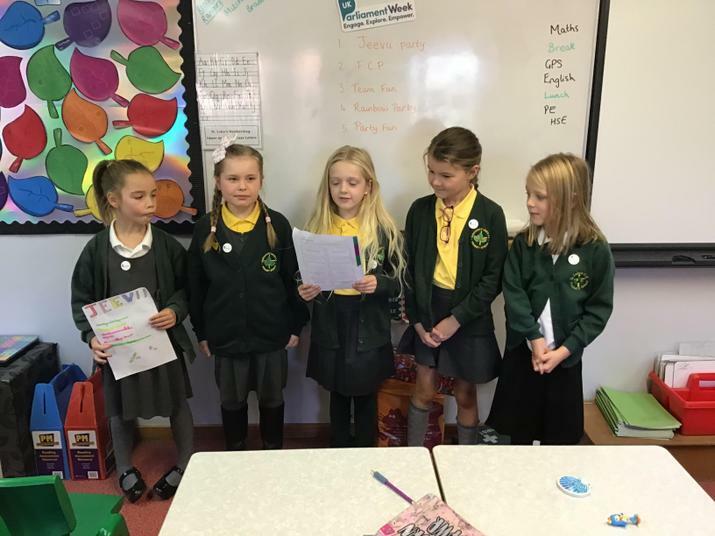 Each group then gave a speech to the rest of the class so they could share their policies and persuade people to vote for their party! 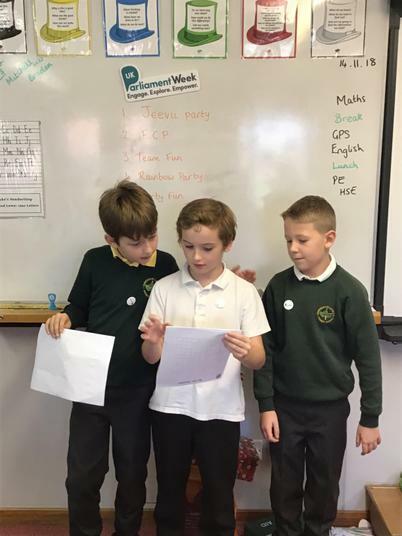 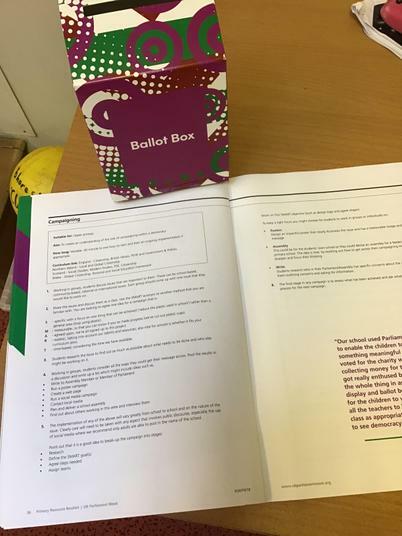 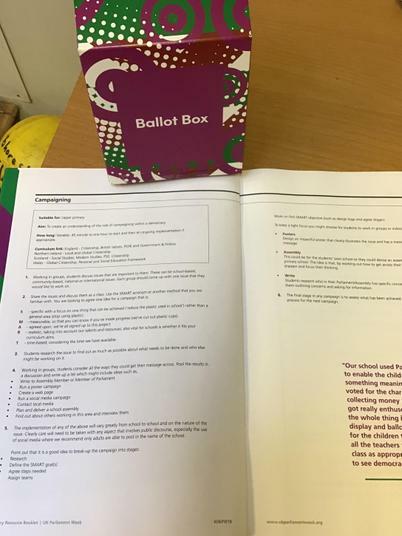 Once each group had made their speech, we voted for a winning group using a ballot box so all votes were anonymous. 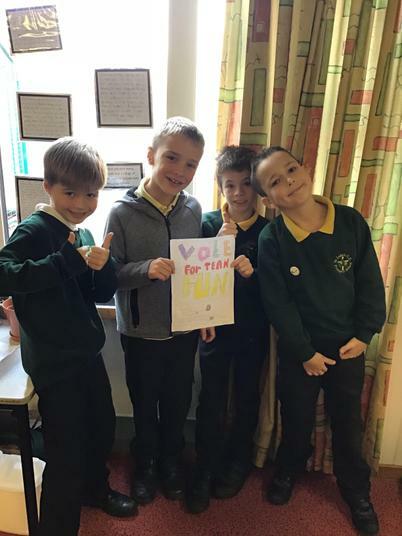 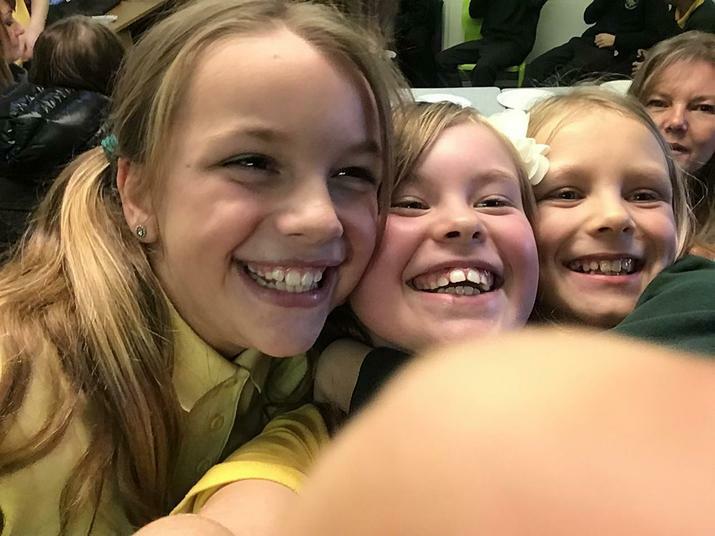 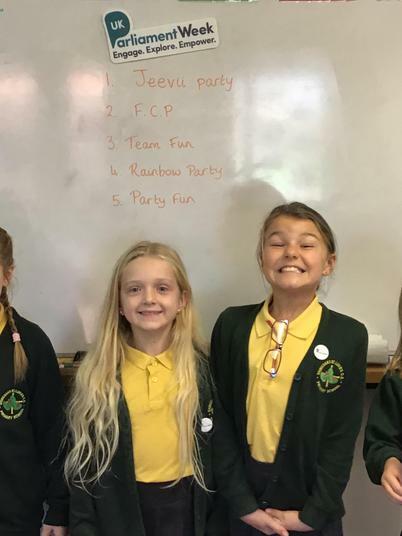 The 'Party Fun' group won and earned 5 reward points each! 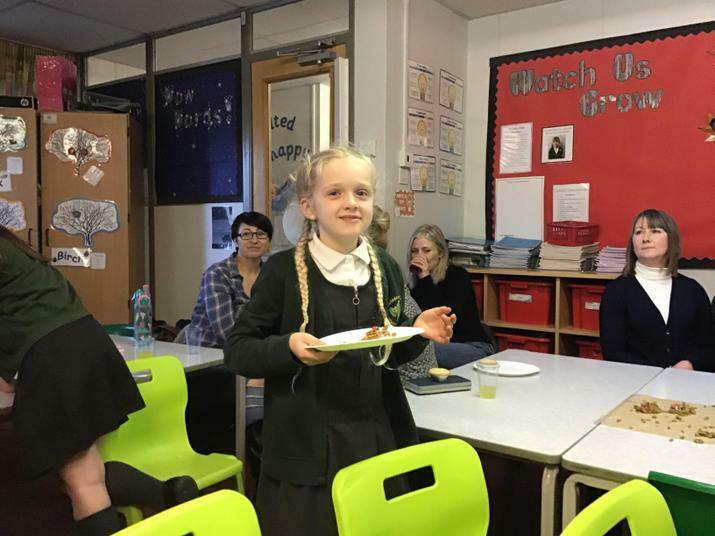 Well done to everyone for engaging and participating so well and for creating some brilliant ideas! 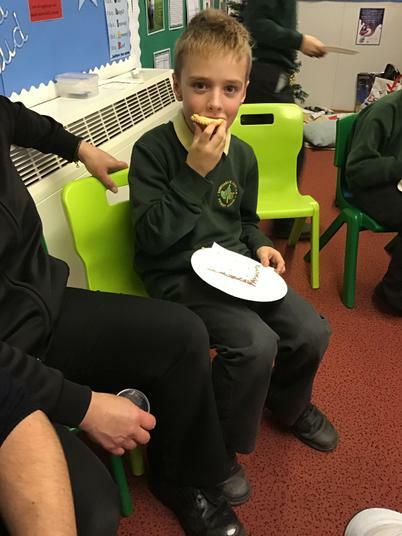 See some photos of our morning below. 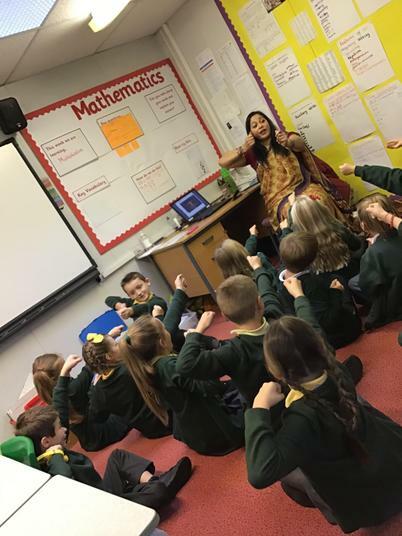 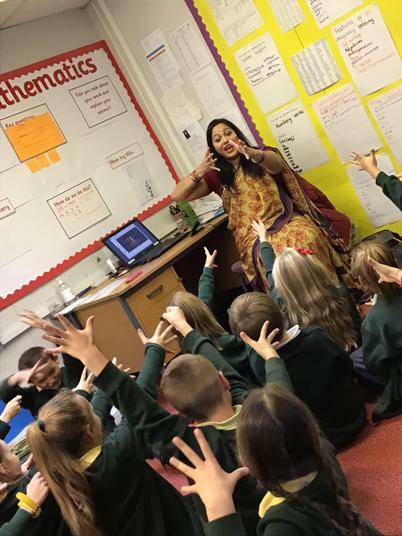 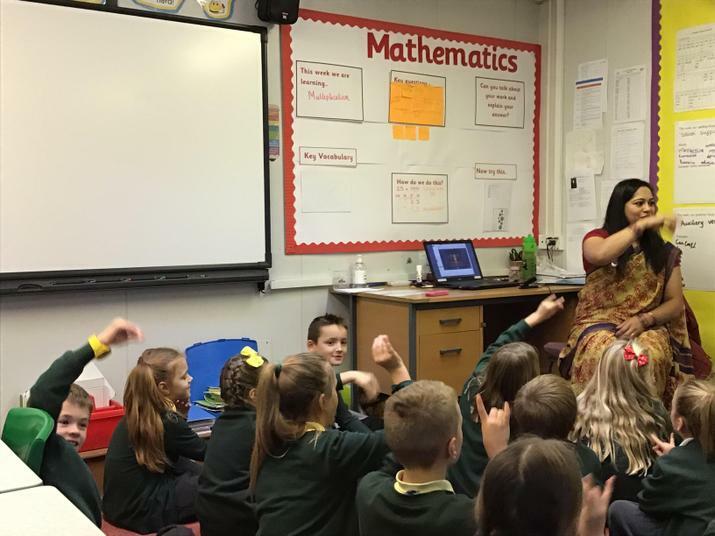 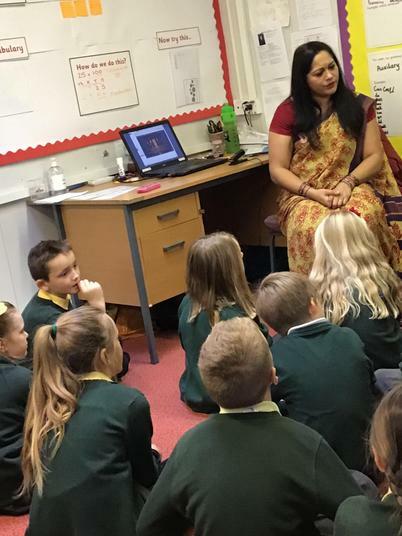 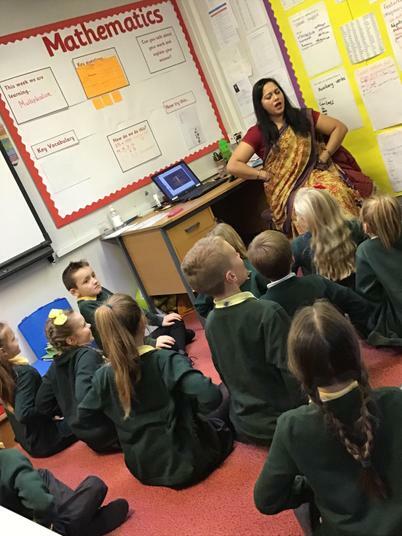 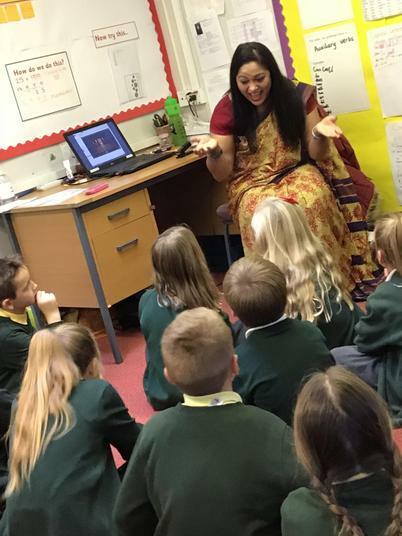 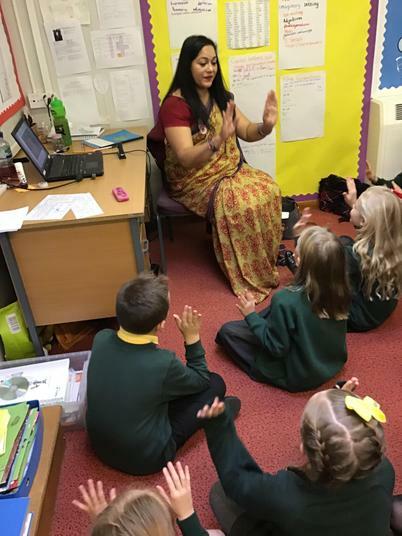 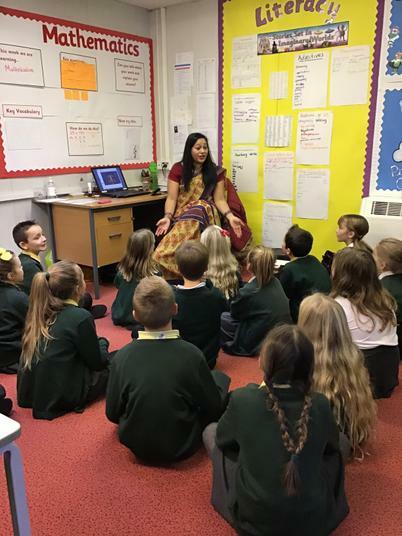 The Indian Experience with Sunita! 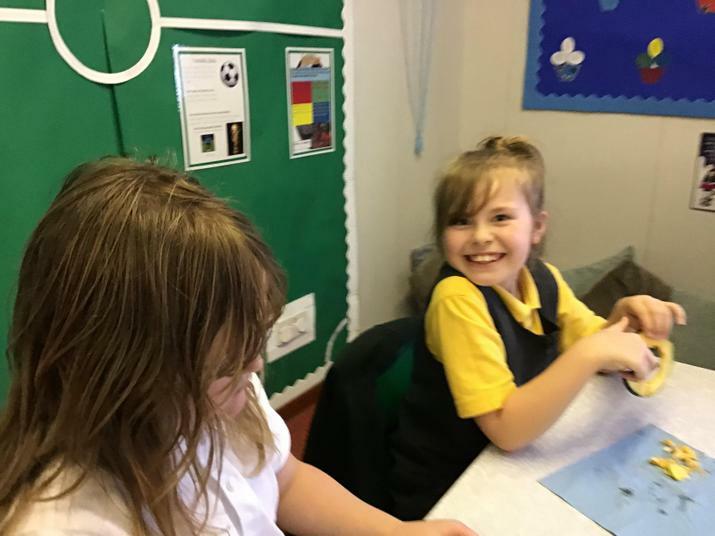 Welcome back to another exciting half term here in Thoresby Class! 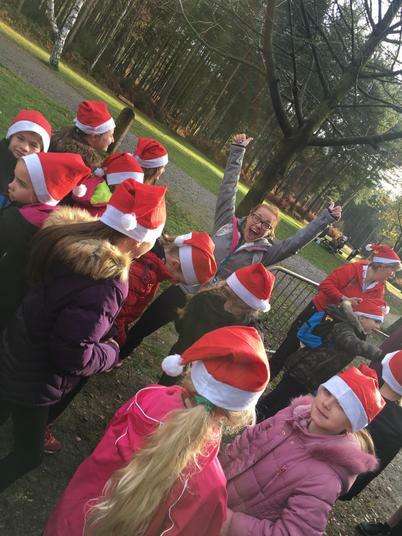 We have lots of exciting activities lined up this half term, alongside all the fun of Christmas! 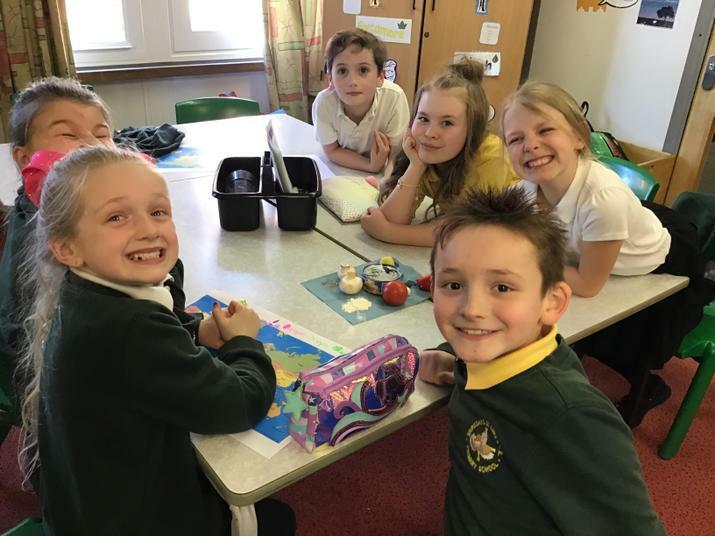 See below for the learning overview for the half term to see what we have in store. 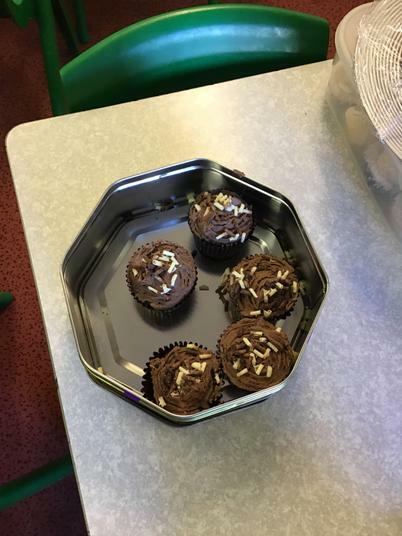 As always, if you need to discuss anything with me please feel free to do so after school. 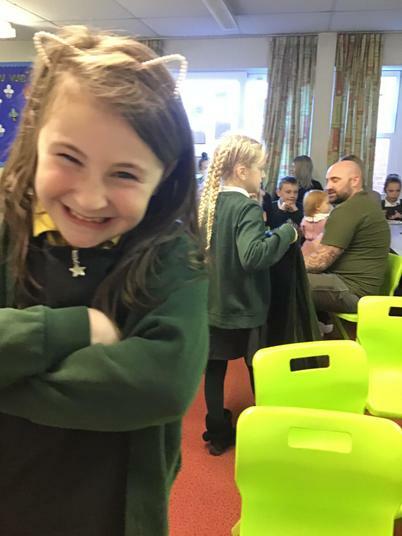 I am always happy to discuss your child's progress throughout the year. 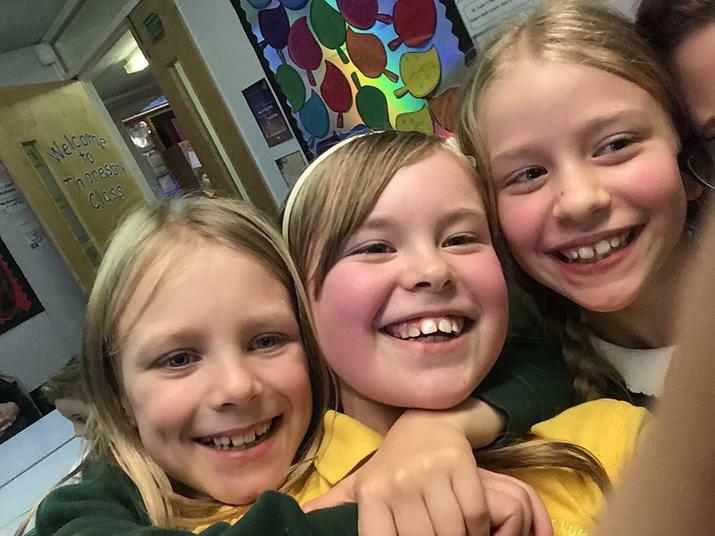 Come back soon for some more updates on our learning this half term! 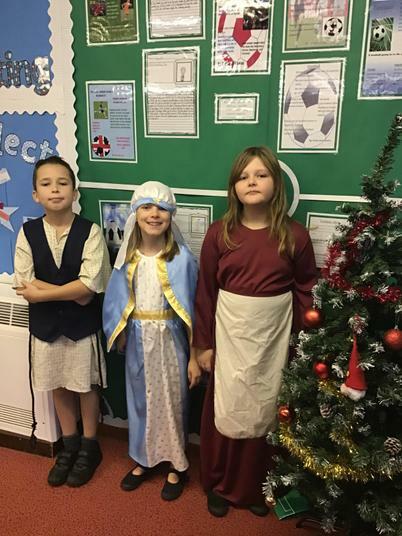 We have had a very busy final week in Thoresby Class! 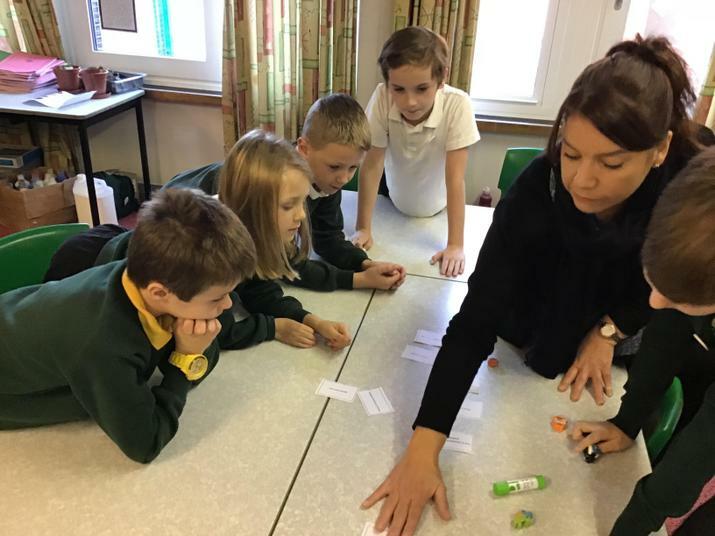 Following on from all of our assessments, we have been working hard to make sure we have a clear understanding of all Maths and English topics before we move on to the next half term. 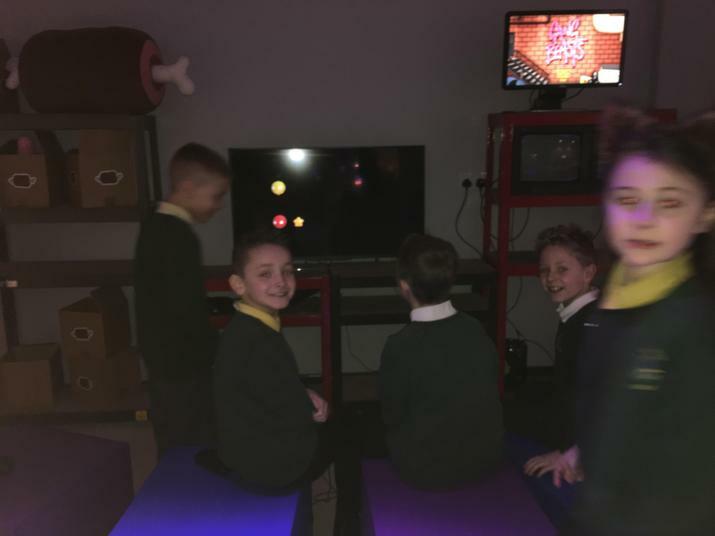 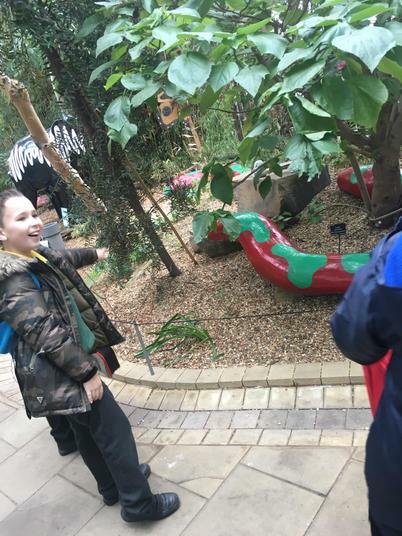 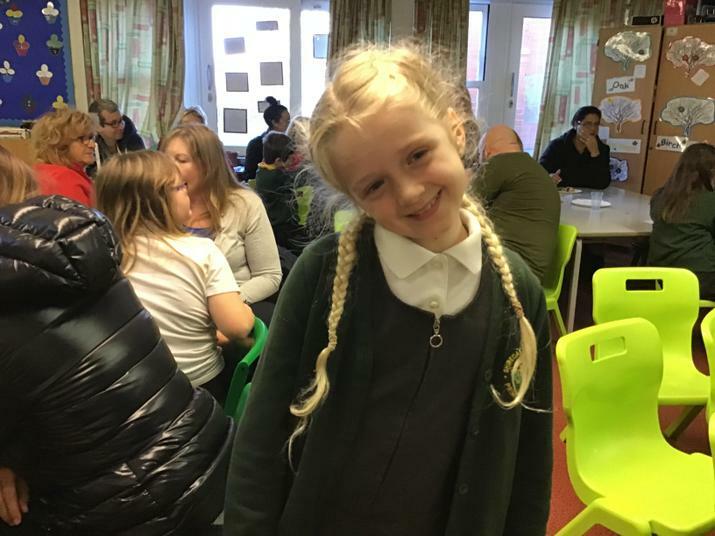 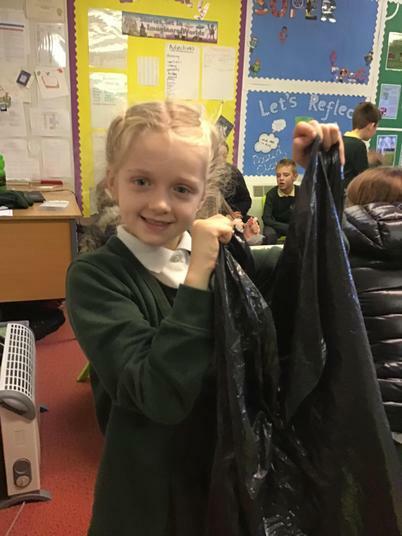 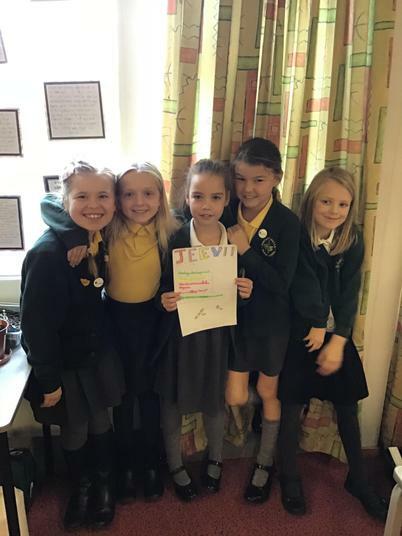 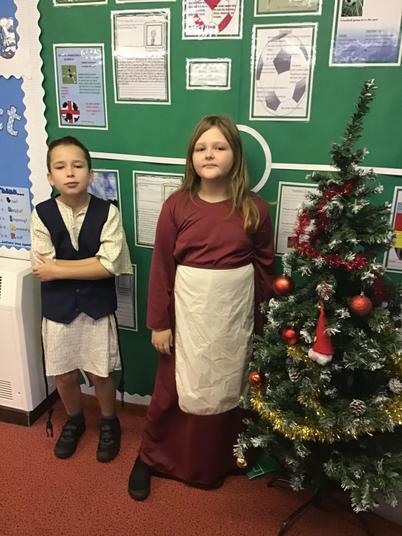 The children have been working really hard and are becoming much more accustomed to the class environment and the idea of working well with others. 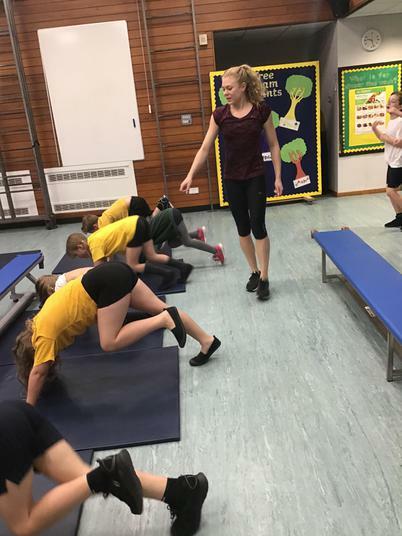 I have seen such a huge improvement since the beginning of the term and I am really pleased! 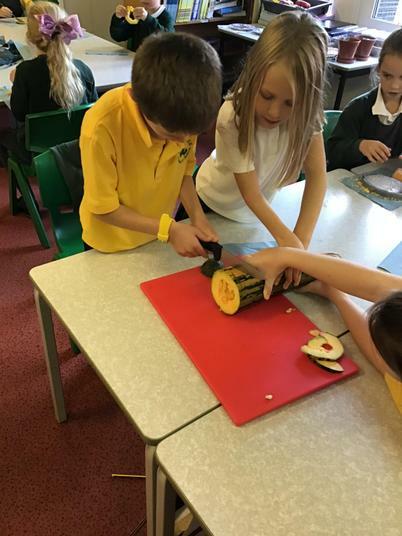 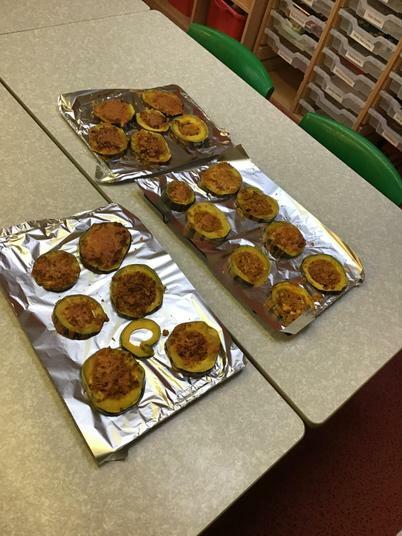 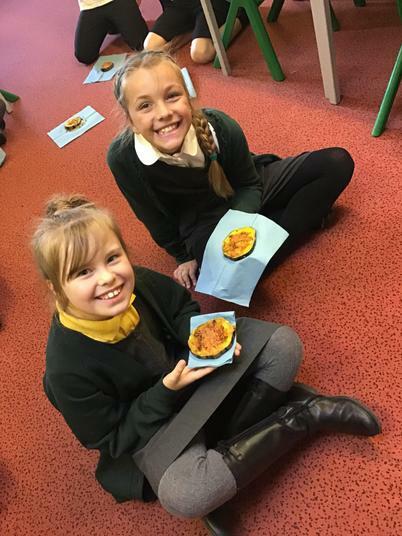 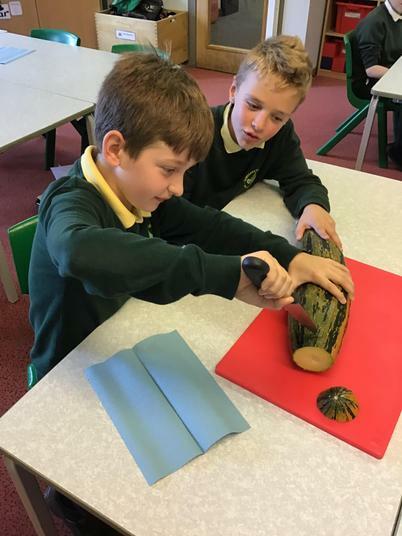 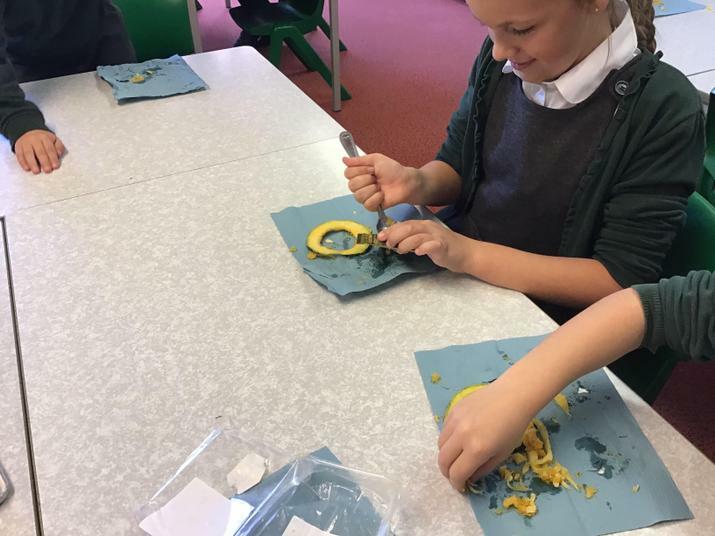 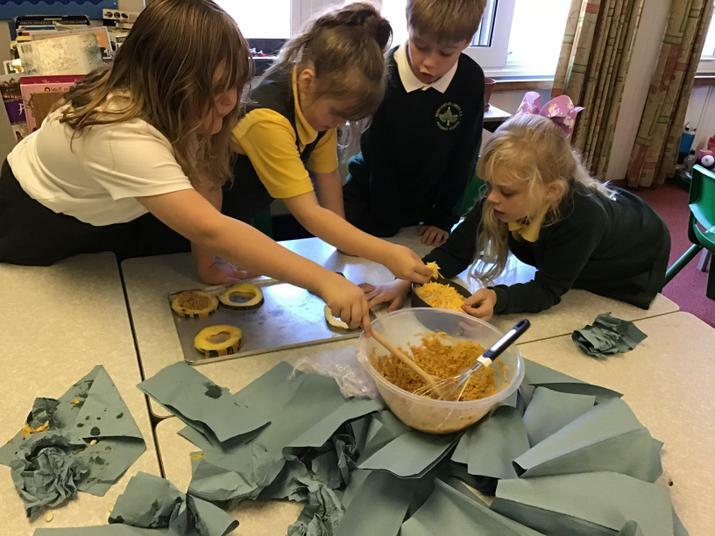 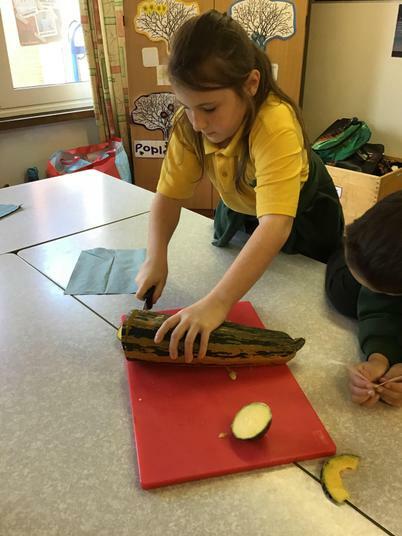 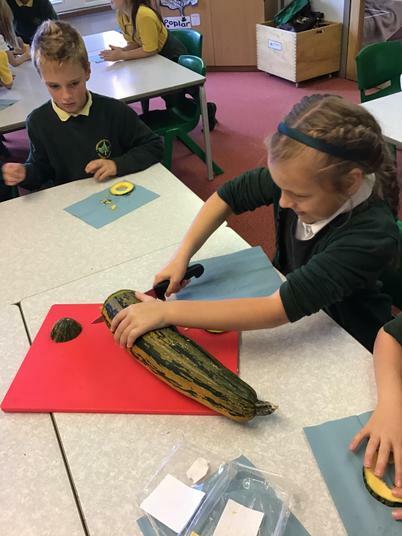 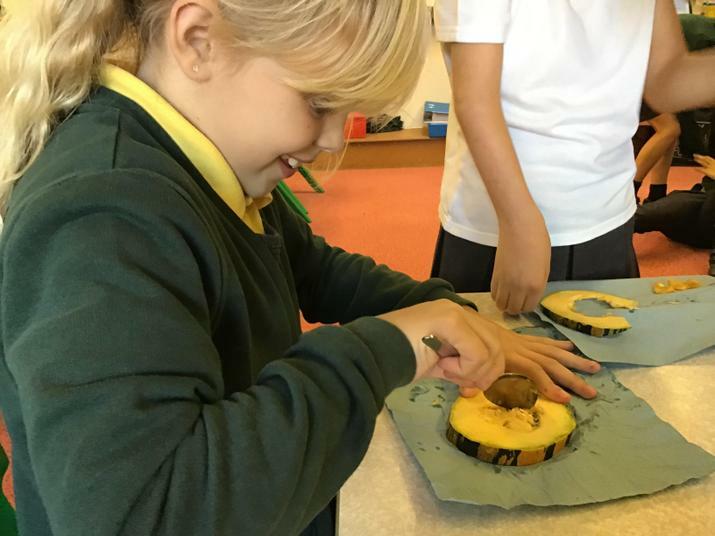 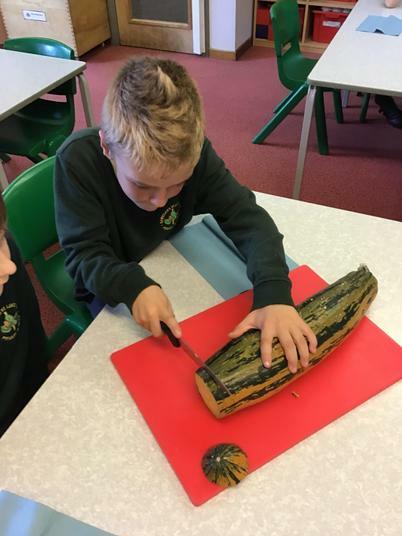 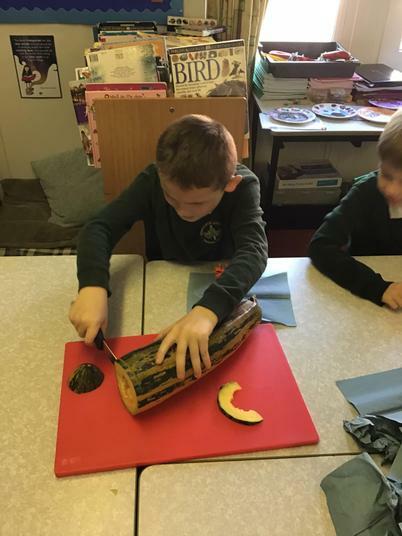 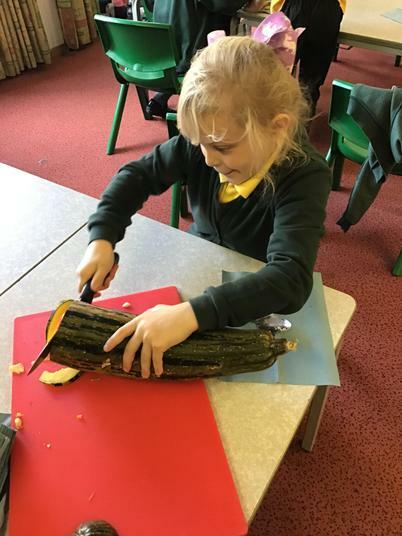 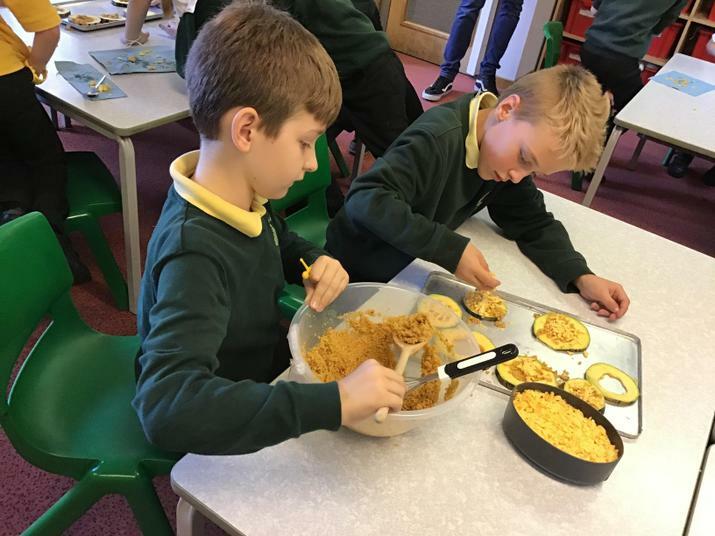 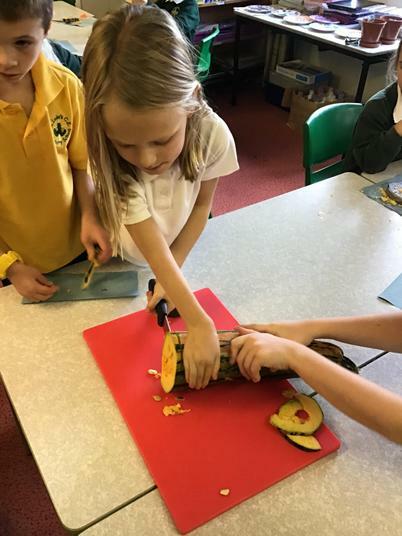 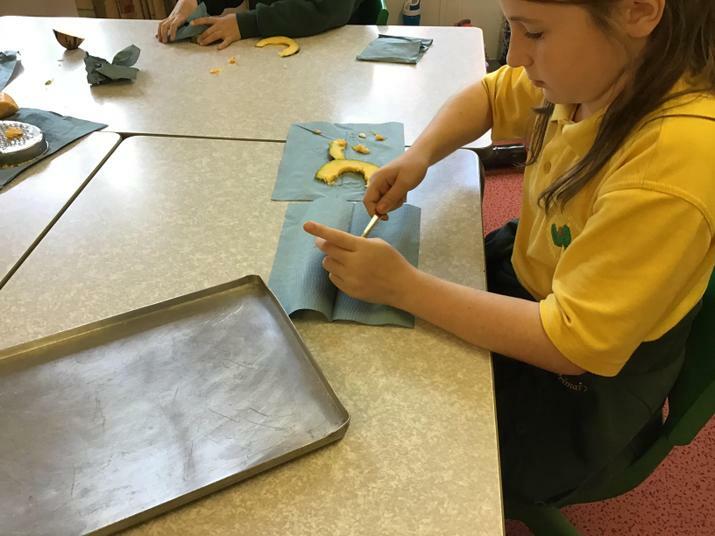 Alongside all of the written learning we have been doing this week, we were also able to complete our Food for Life activity where we harvested and cooked marrow! 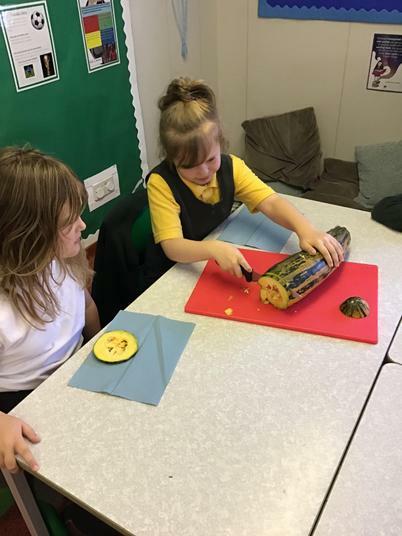 We cut a slice each and stuffed our own piece with cous cous and cheese before leaving it to cook in the oven. 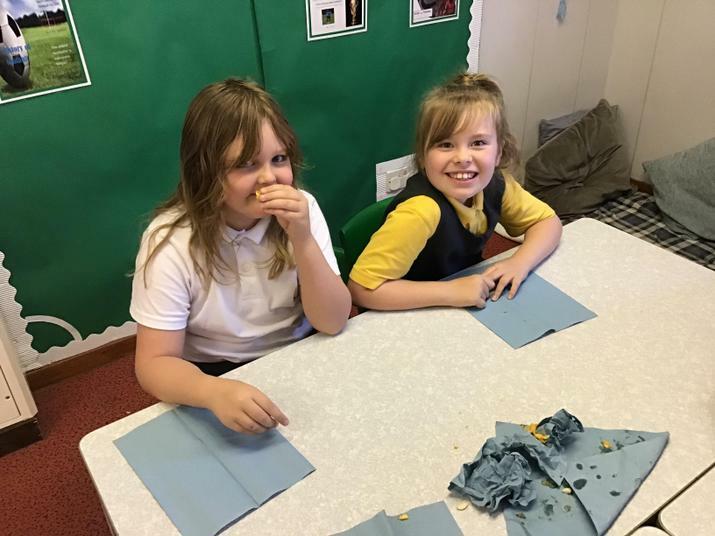 We then tasted the fruits of our hard work - with mixed results! 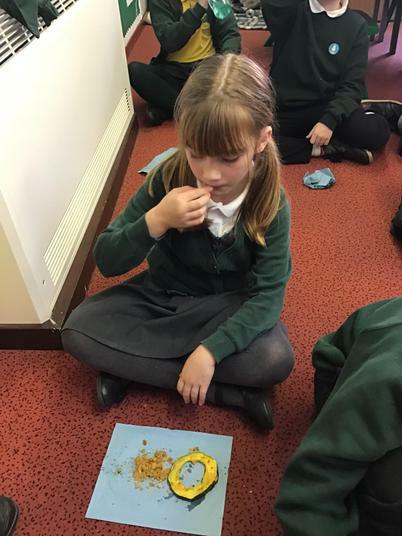 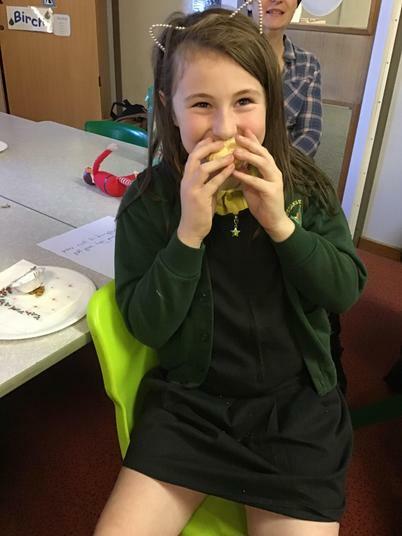 But it was great to see all the children trying this new food. 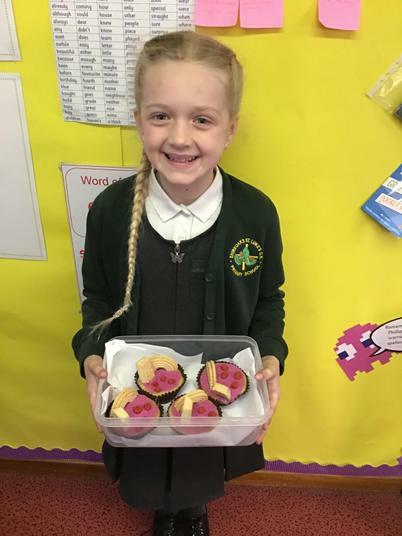 When we come back to school there will be poppies on sale for a donation to the Poppy Appeal. 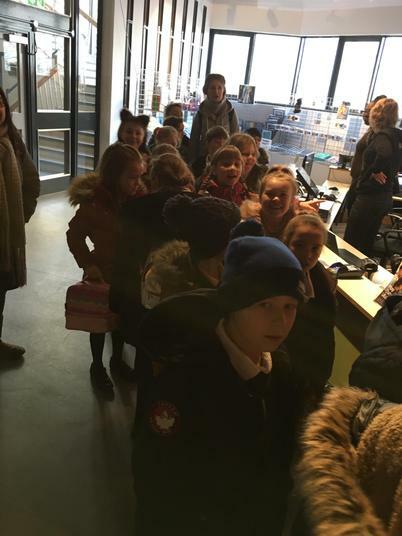 There will also be other items on sale as well, such as pens, pencils and rubbers! 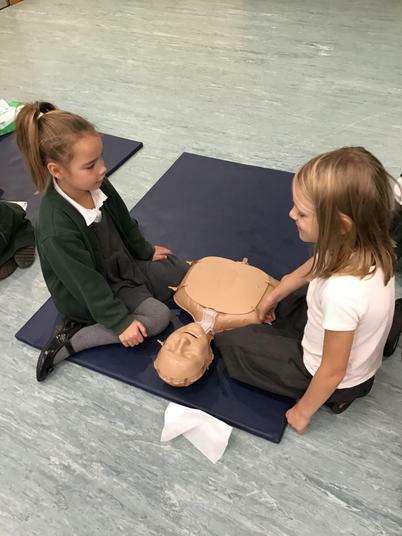 On Tuesday, Thoresby class were lucky enough to receive some training on how to perform CPR. 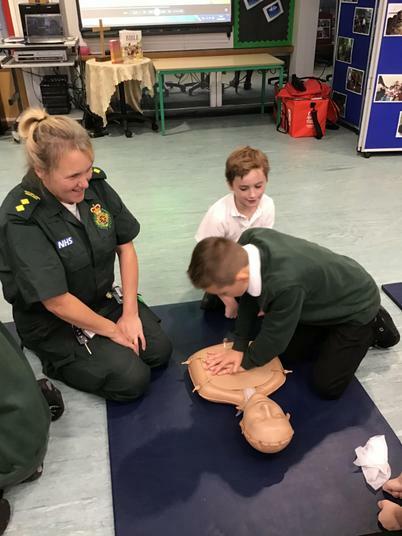 A lady from the East Midlands Ambulance Service came in to teach us all about the correct methods to use should we ever need to. 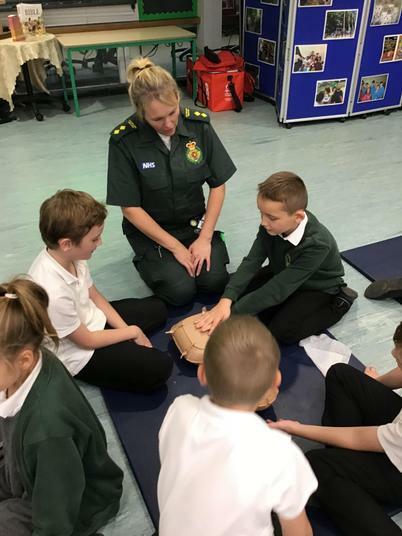 We discussed that children should of course phone 999 first and the importance of knowing their home address to help the ambulance operator. 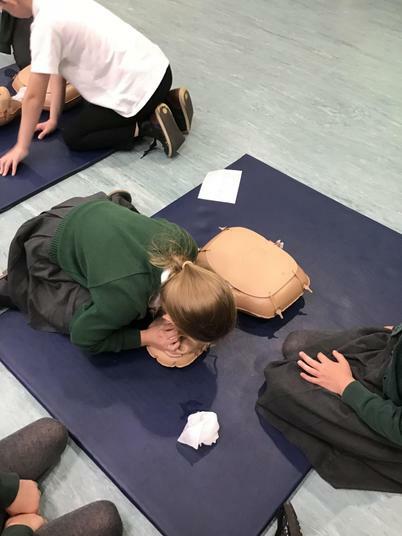 However, we are now equipped to perform CPR whilst waiting for the ambulance crews to arrive. 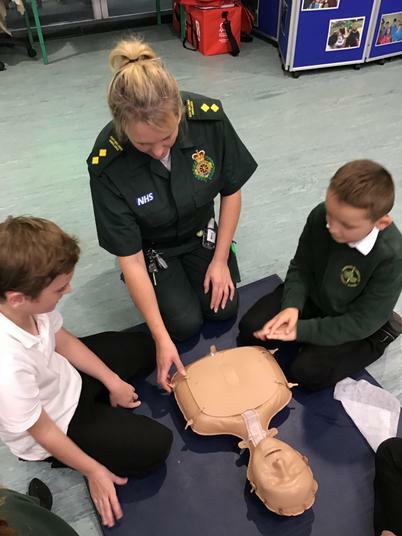 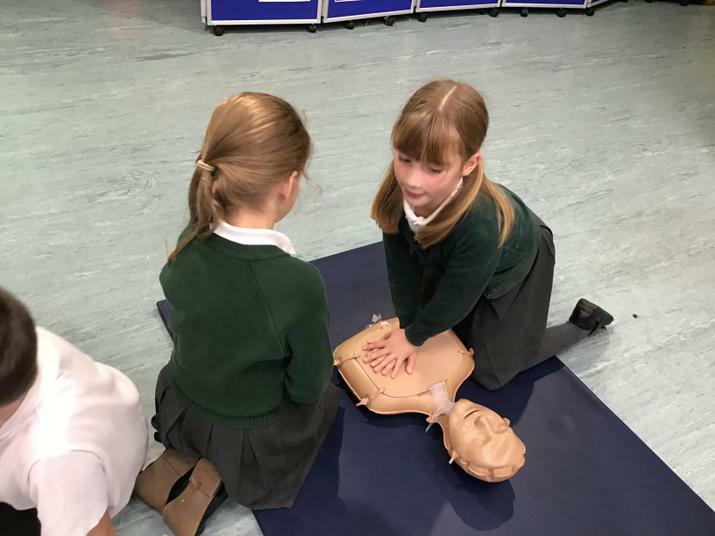 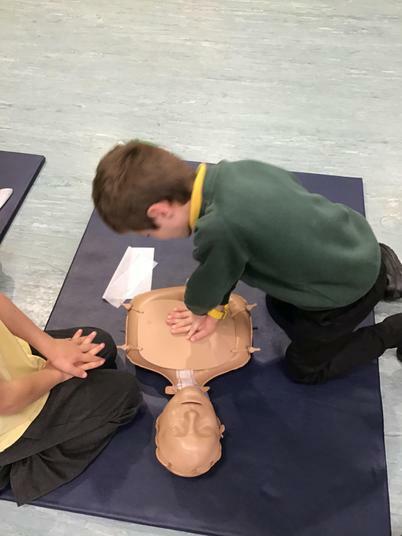 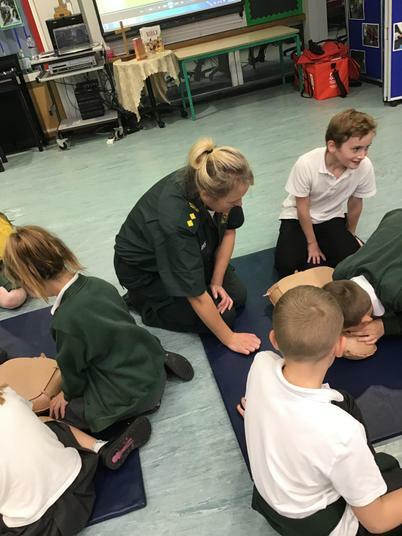 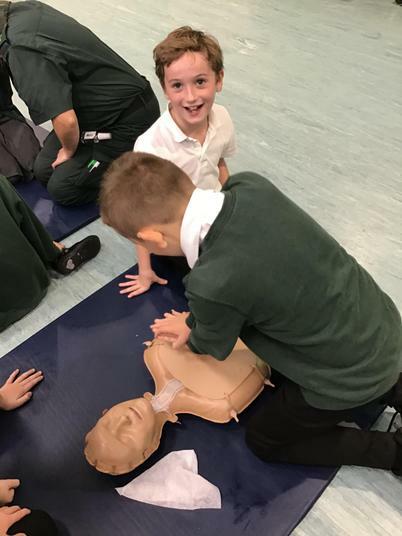 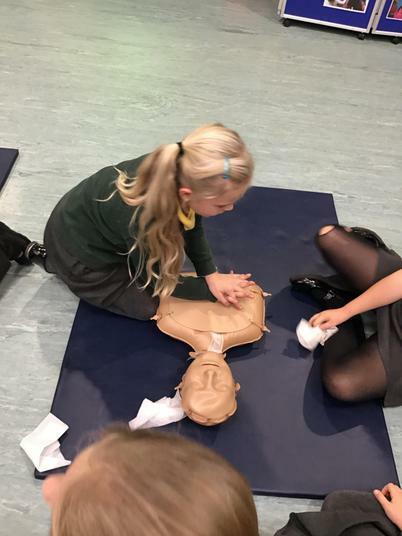 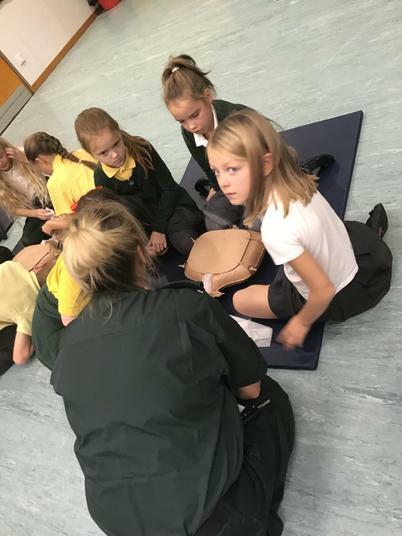 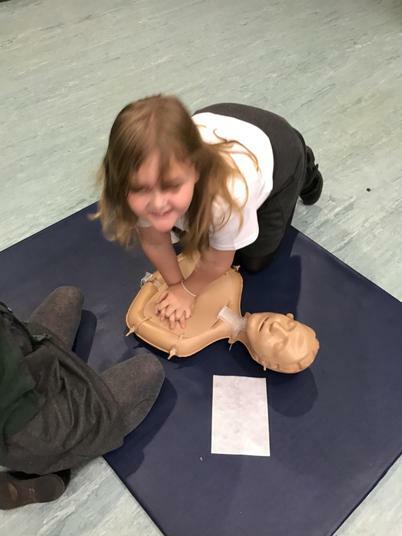 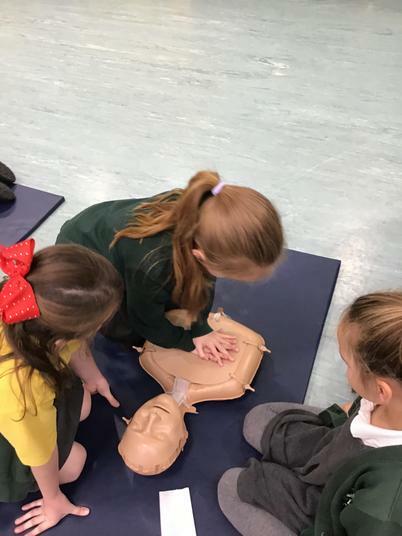 The children were really enthusiastic about the training and behaved superbly - they took turns to perform chest compressions and mouth to mouth resuscitation. 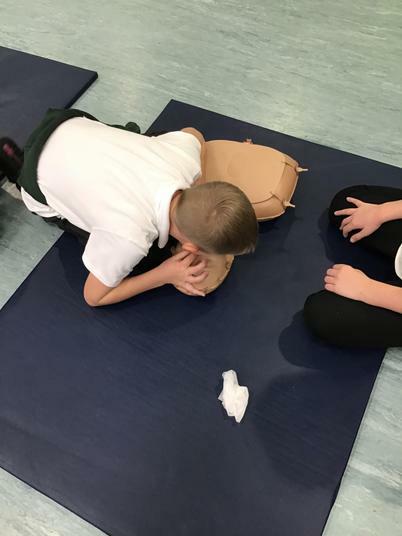 Some photos of the training are below. 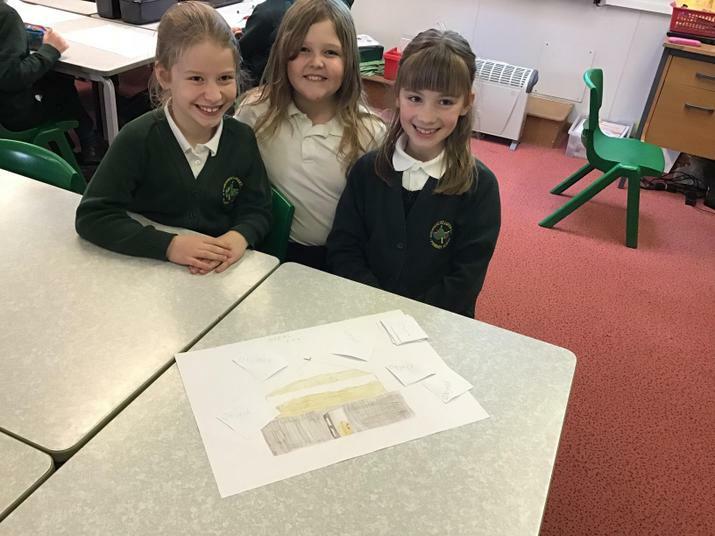 This week we have had a lot of fun putting together our fact files on the history of football! 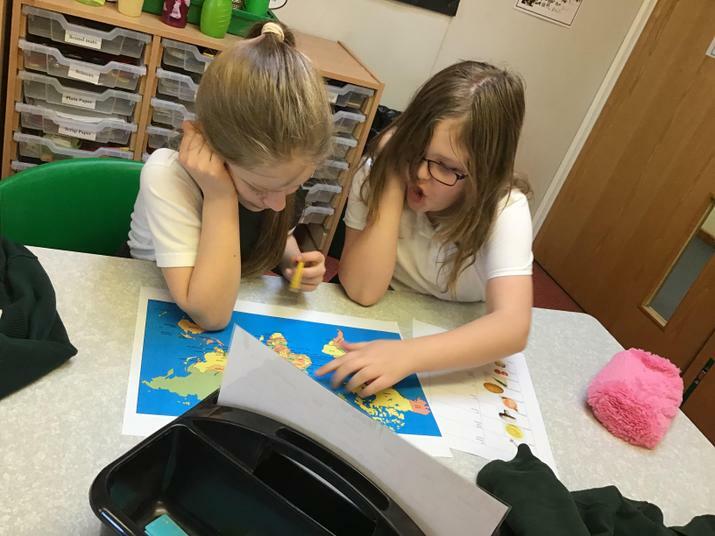 We have researched the information in pairs and then used ICT to collate and present our information. 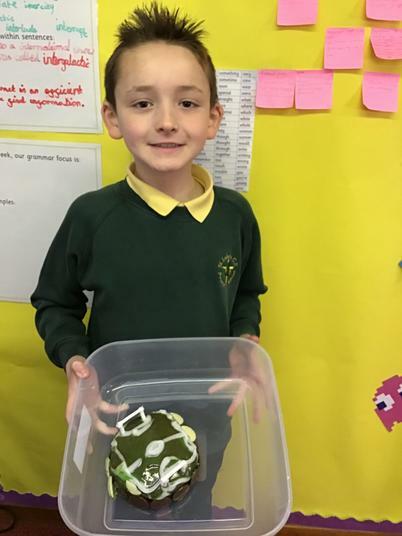 Some of these will be displayed on our 'History of Football' display board, so feel free to pop in and have a look next week! 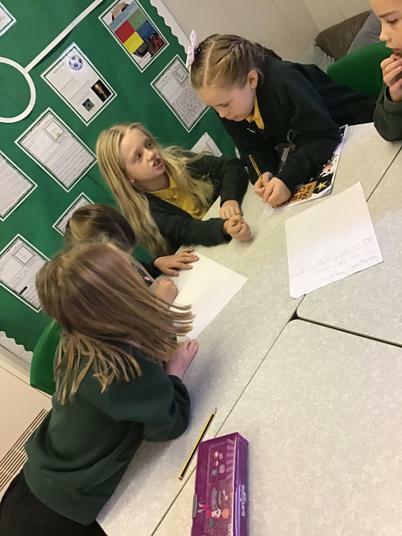 We have also started planning our biographies that will be written about an individual footballer. 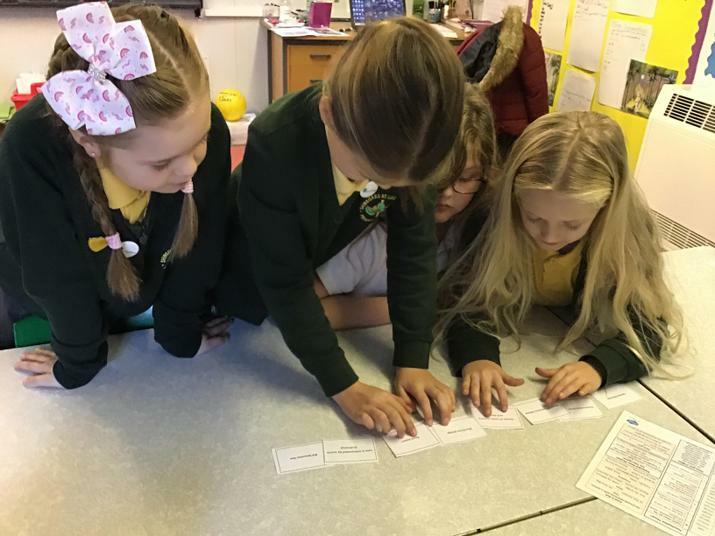 We will be researching key facts and using this information to create a biography that includes all the relevant features we have discussed. 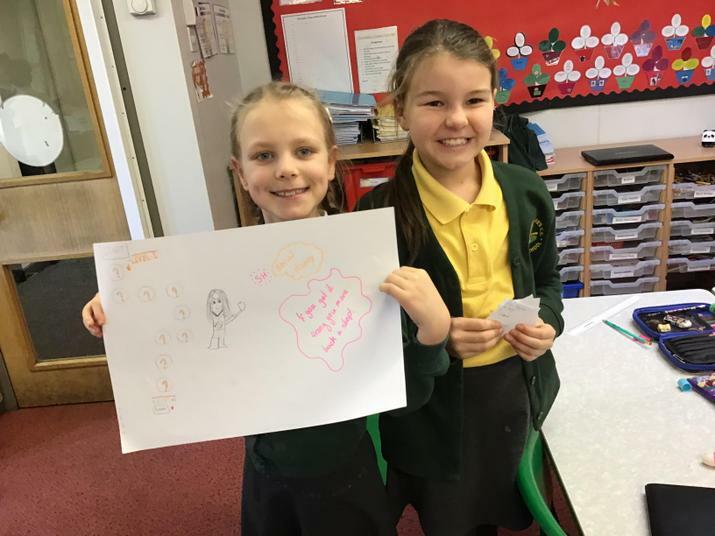 We have continued to study various methods of subtraction in Maths, and children will be able to show what they have learnt in our assessments next week. 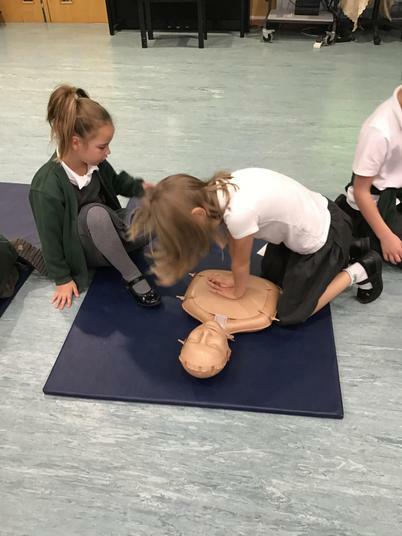 Also coming up next week are the flu vaccinations, school photos and the Restart a Heart day! 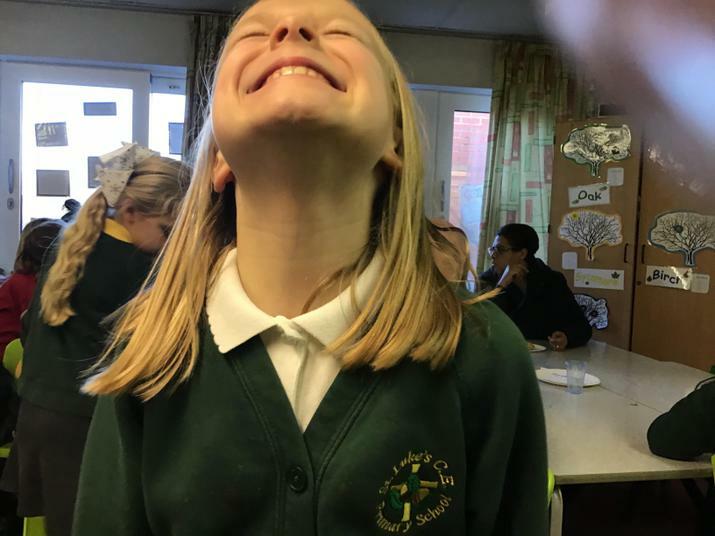 A very busy week ahead - keep checking the website to see how we are getting on! 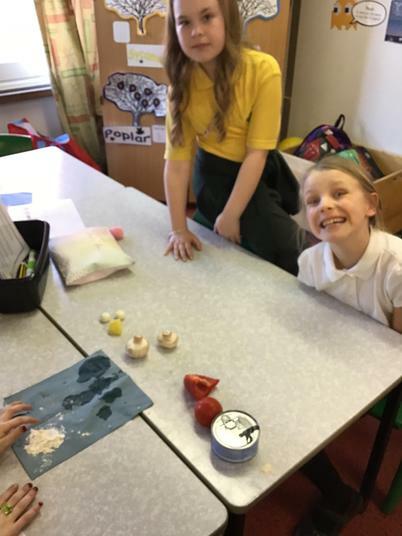 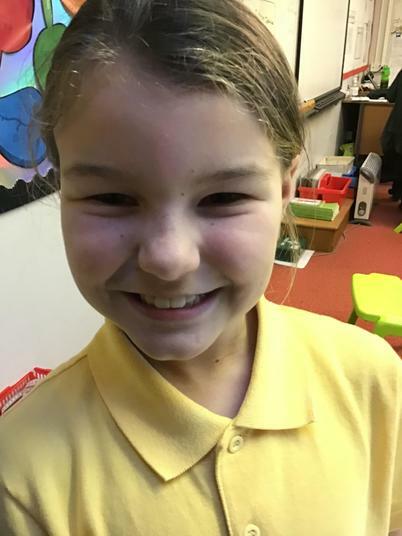 We have been studying gravity today in our Science lesson and looking at the effect of gravity and air resistance. 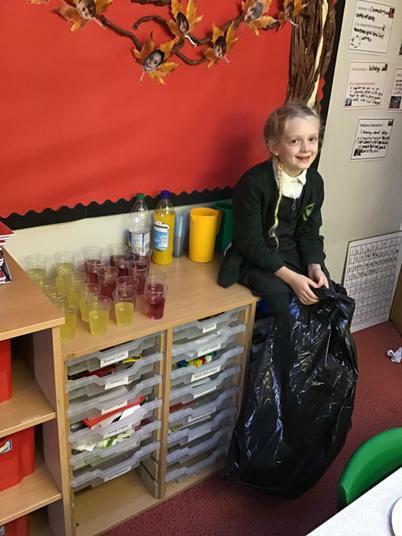 We completed the balloon challenge - trying to keep a balloon in the air using air blown through a straw! 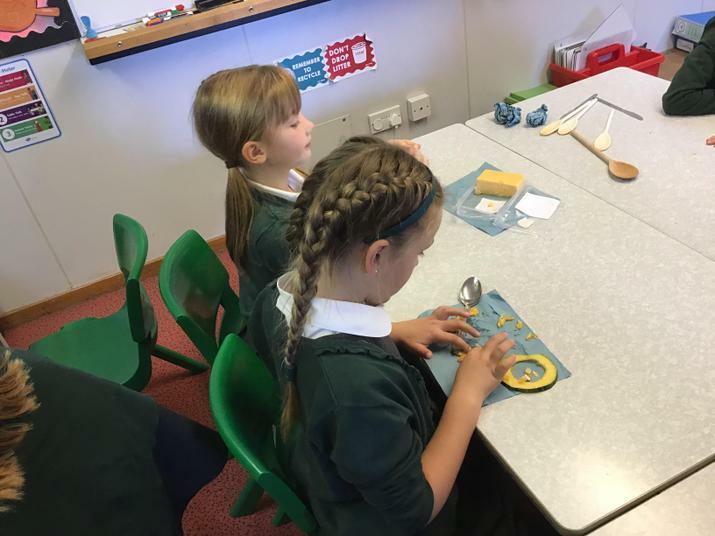 The children have learnt a lot and have had lots of fun in the process. 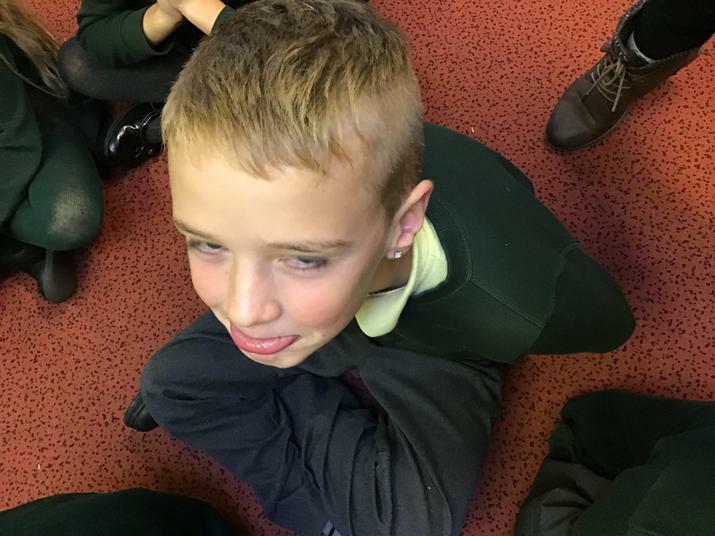 Some photos are below. 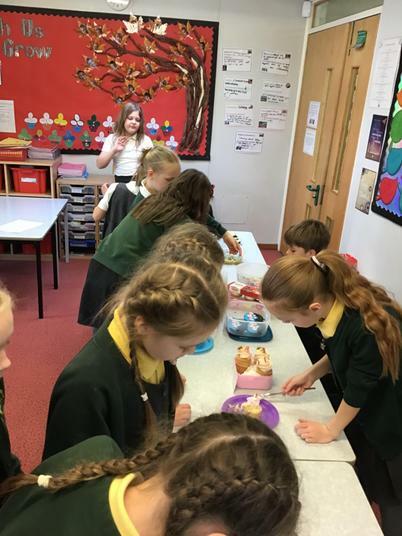 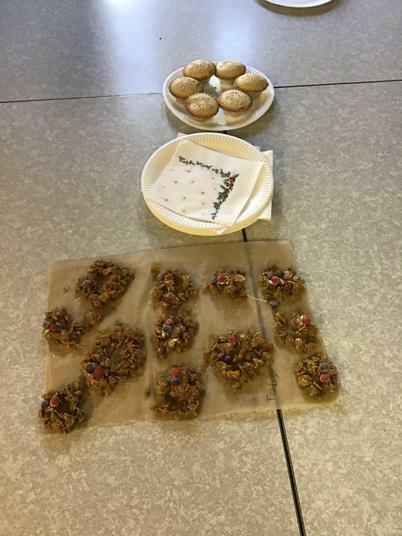 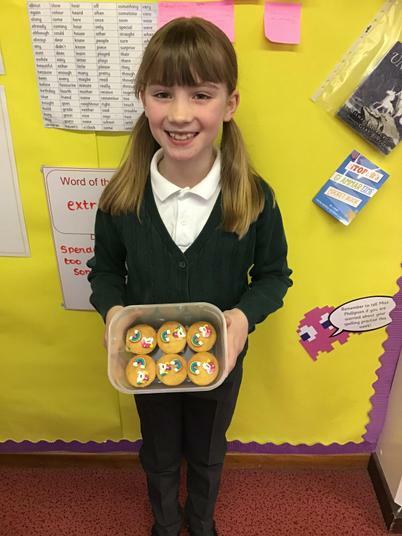 We have been baking this afternoon in order to provide some yummy treats for the coffee afternoon after school tomorrow. 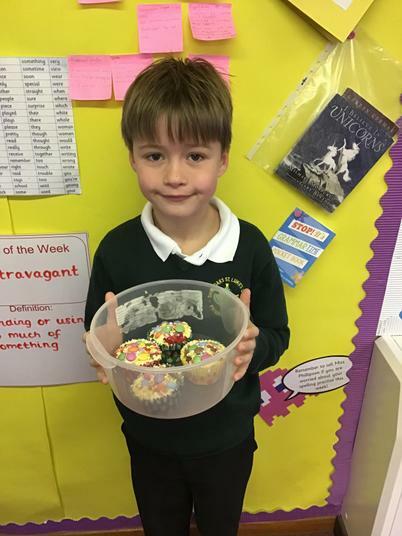 We have made a range of white and dark chocolate rice crispie buns, sprinkled with sugar strands, skittles and smarties! 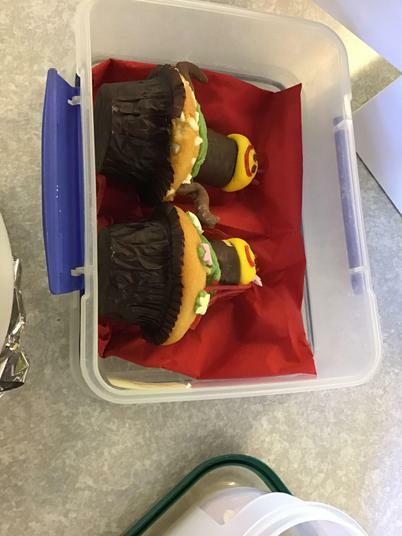 Be sure to buy one tomorrow to see what surprises are in store! 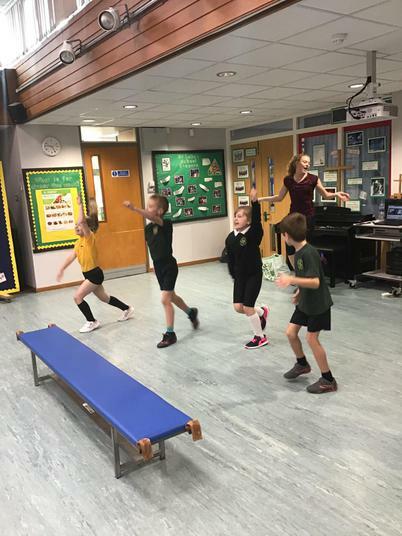 The children really enjoyed completing the circuit with Beth Dobbin this week. 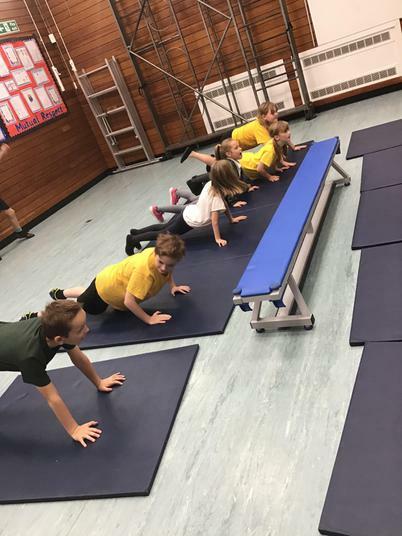 They worked really hard and definitely worked up a sweat! 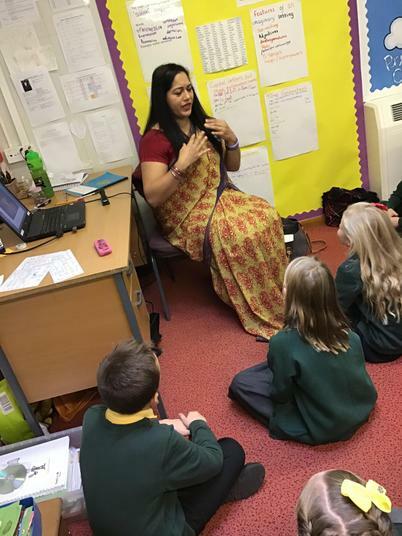 They also enjoyed hearing all about her experiences and how she overcame obstacles to succeed. 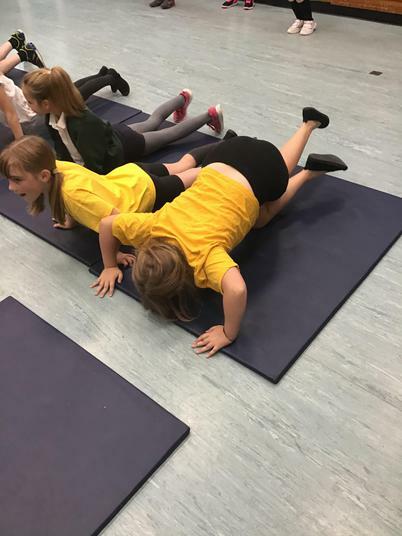 There are some pictures of the morning below. 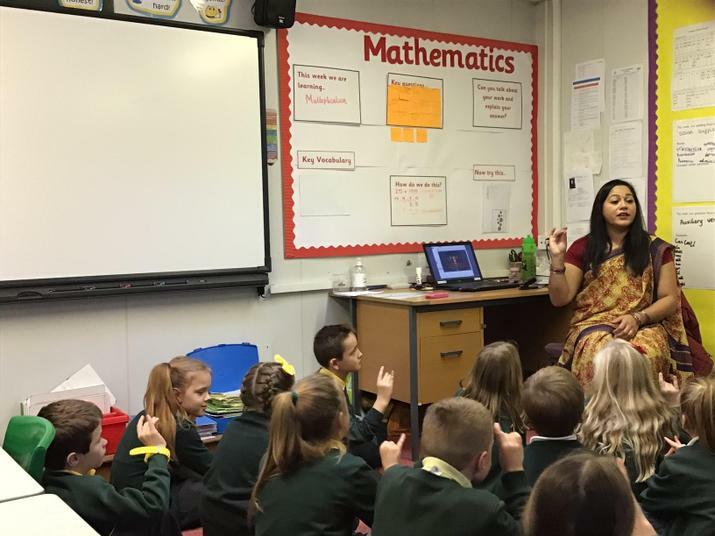 This week we are going to be continuing to look at place value in Maths and hopefully in English we will have our non-chronological reports finalised too! 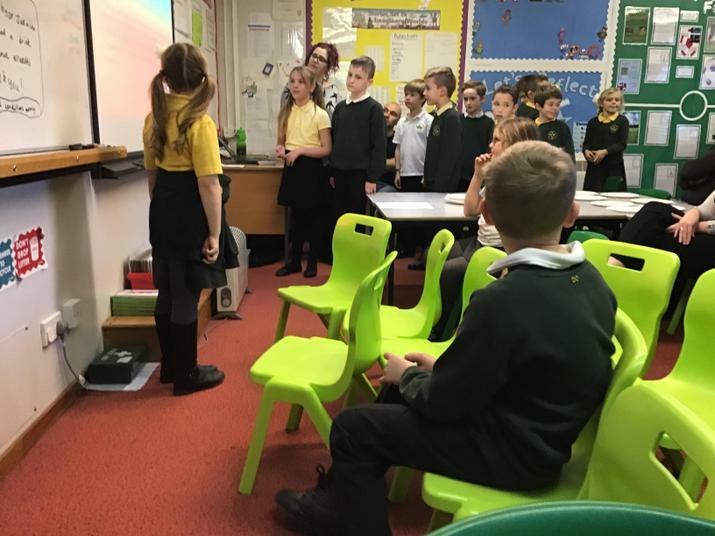 We have a week full of exciting topics, such as the Romans in History, national anthems in Music, Picasso in Art and internet research in Computing. 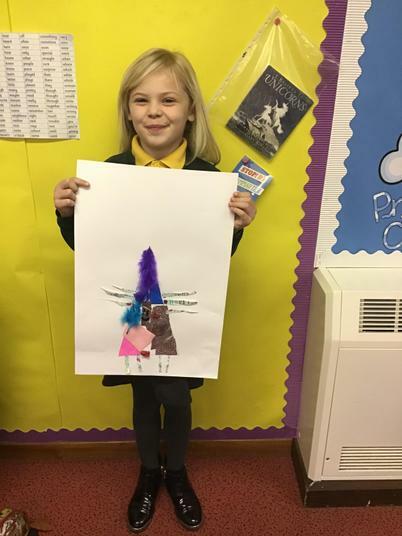 Our Big Write task on Friday will be to write a story based on a prompt image. 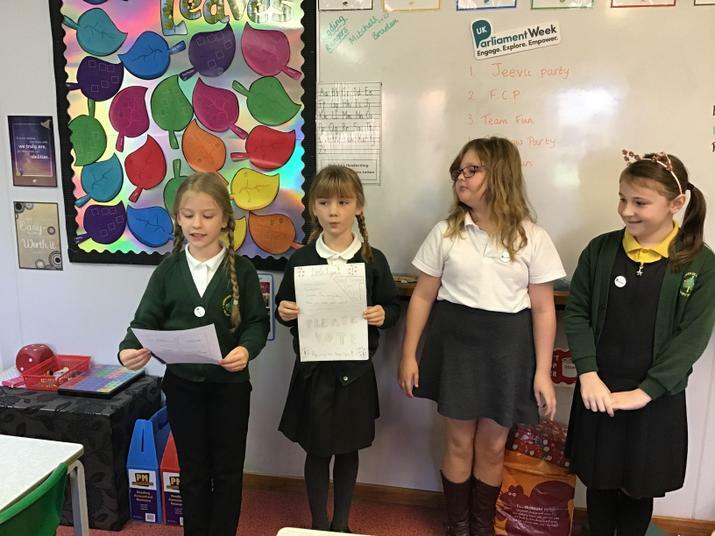 The writing will be a story about a day on the job as a medical professional who travels on a dinosaur. 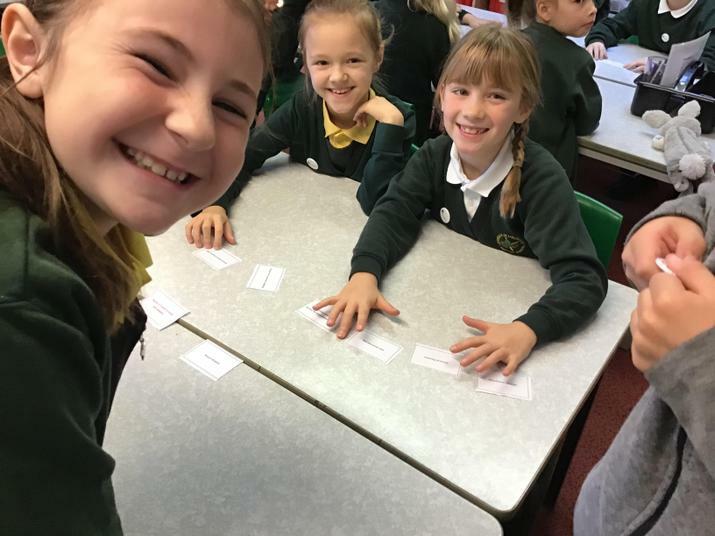 Remember to think about what we have covered in GPS so far – capital letters, full stops, conjunctions and exclamation marks. 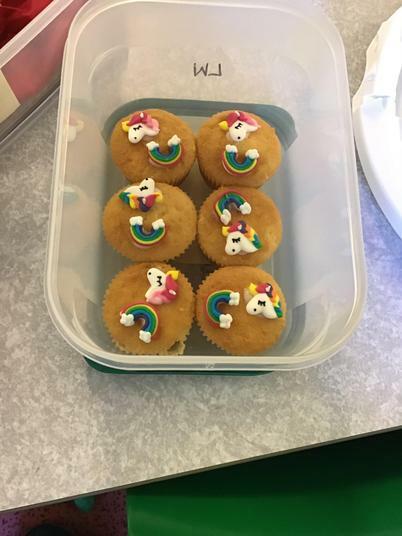 Be sure to include these as much as you can! 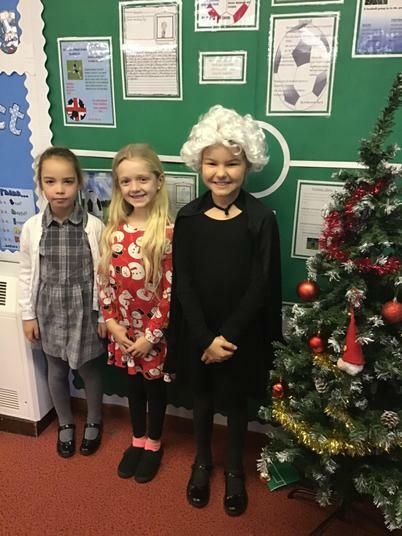 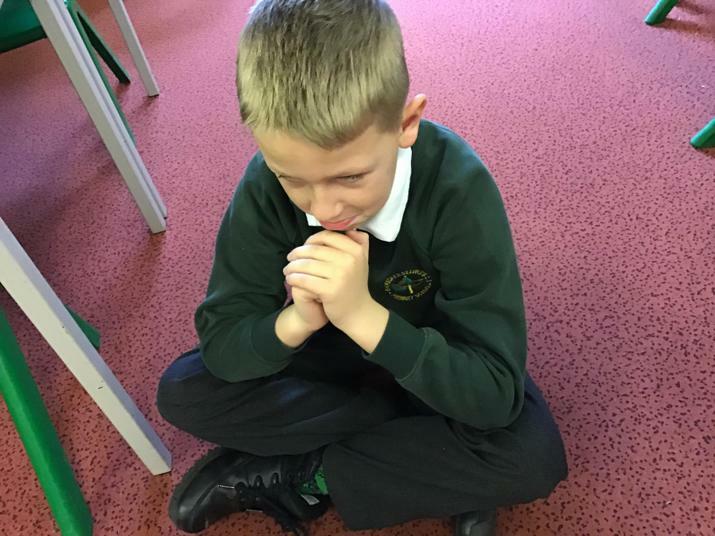 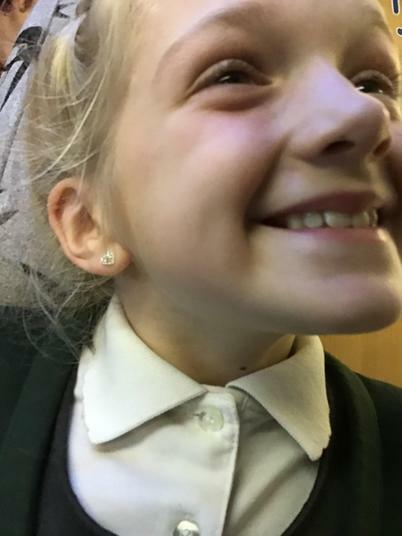 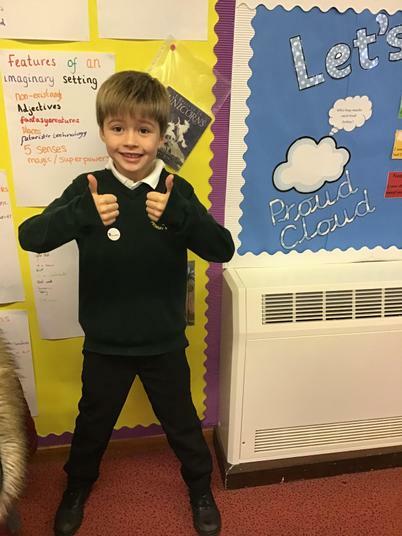 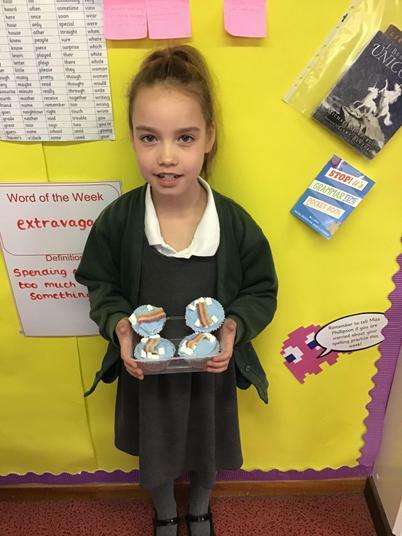 We have had a really great week this week in Thoresby Class. 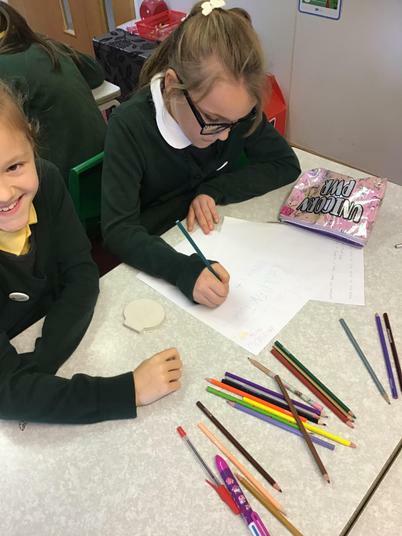 The children are beginning to adapt to new routines and expectations, and I have been particularly impressed with the work we have covered in Maths and Art. 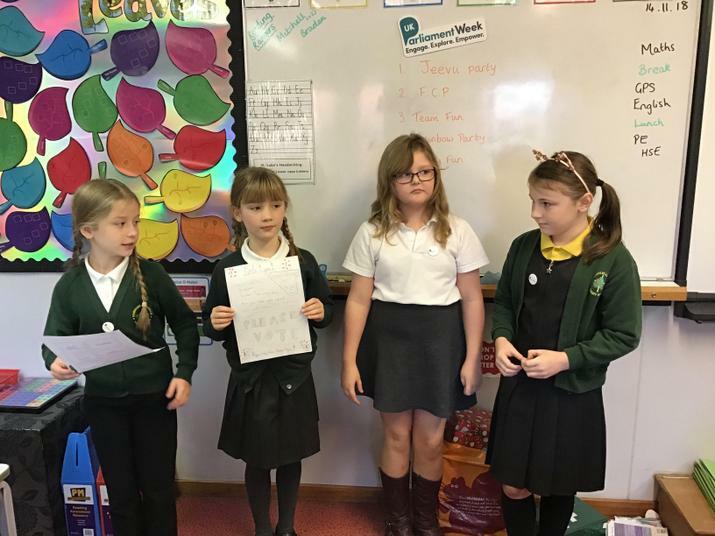 We have been looking at Roman Numerals and rounding numbers in Maths this week. 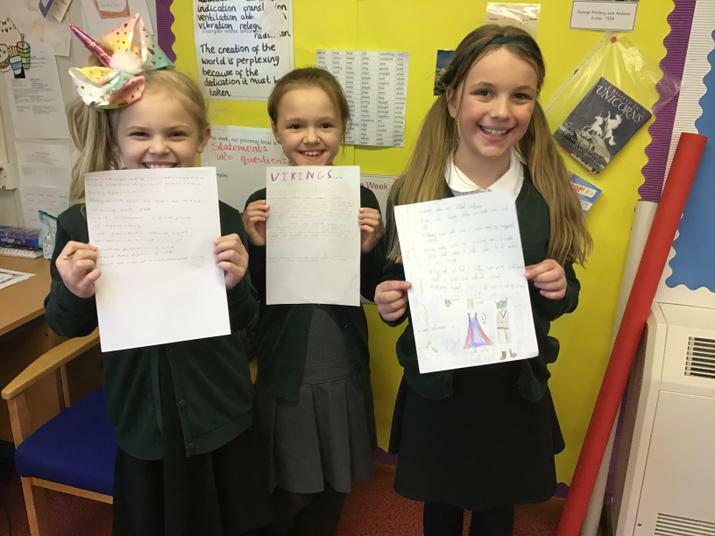 We have started to explore non-chronological reports in English and we have been practising our capital letters and full stops in GPS. 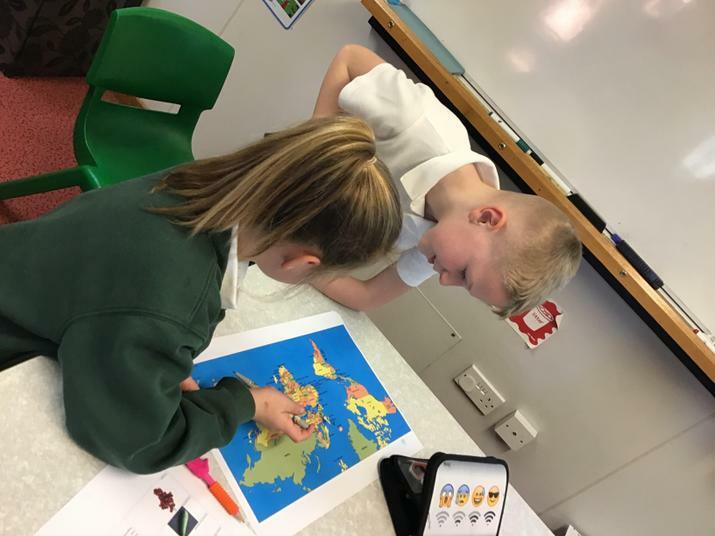 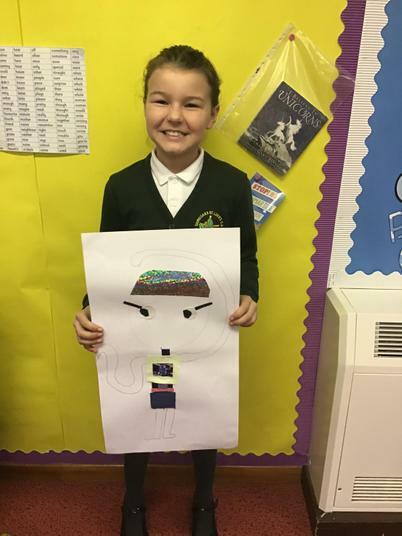 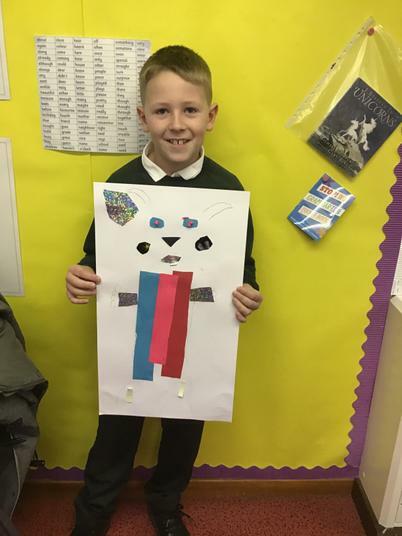 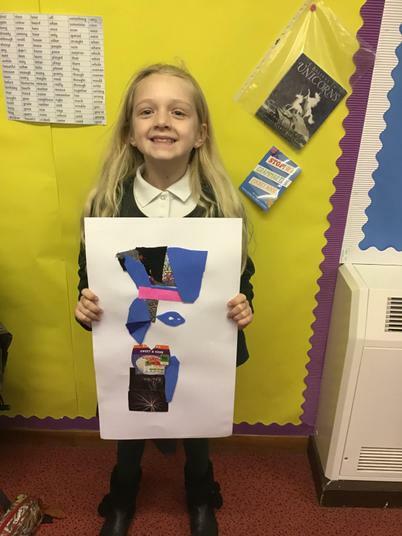 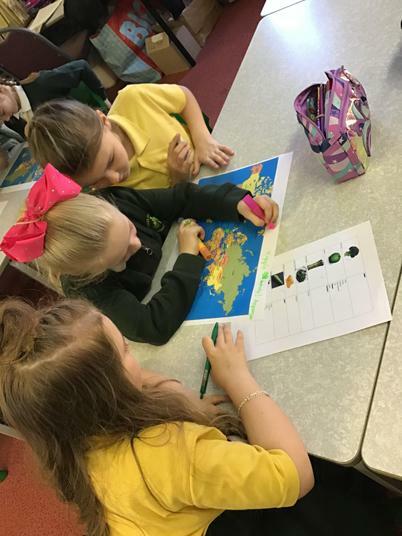 Alongside all of this we have also been able to create our own self portraits using pastels, take part in some team games and plot various cities and countries on a UK map! 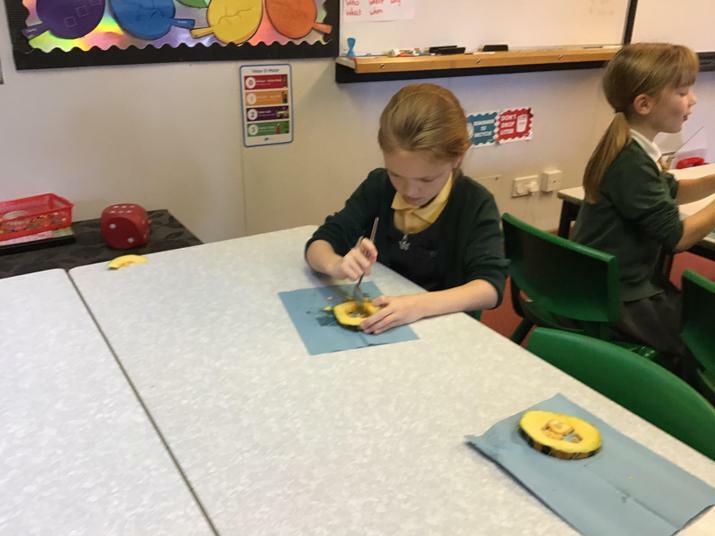 The children are all working really hard and I hope this continues throughout the term. 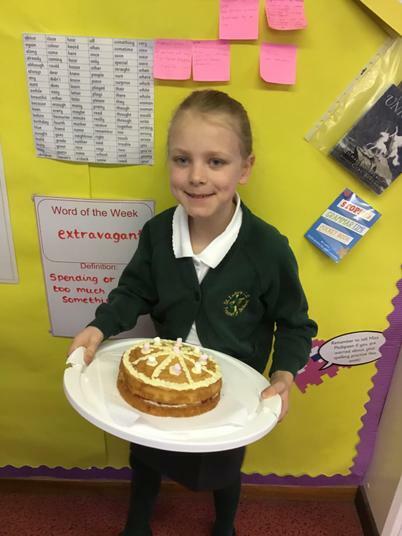 Although we have not sent any spellings home yet, we are covering the spelling rules within class and it would be great for the children to share their learning with you! 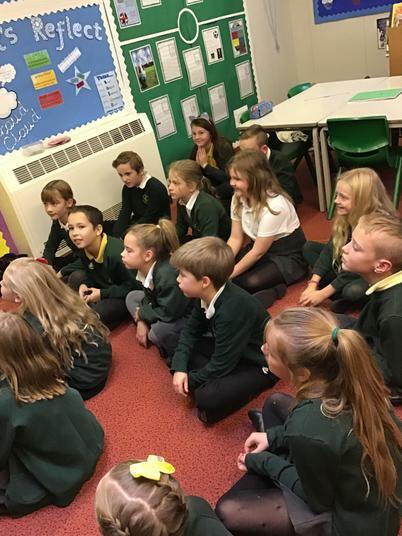 Please make sure children are reading at least three times a week with you at home. 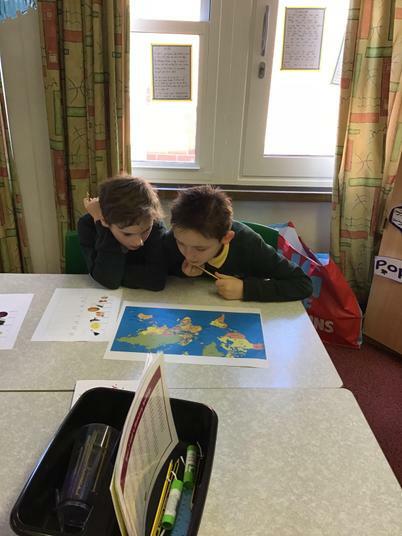 In Year 4 we concentrate on comprehension and ensuring the children can understand and discuss what they have read so I would love to hear about any of these discussions that are taking place at home! 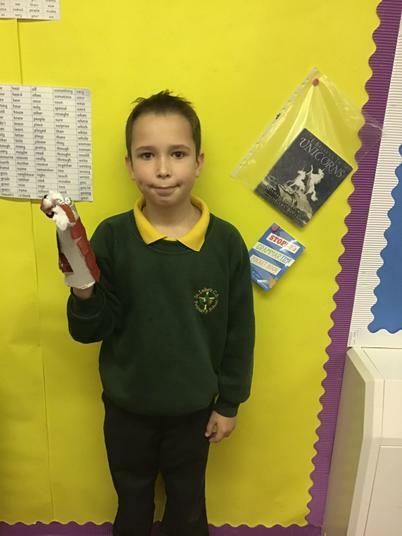 Reading books will normally be changed on a Monday, so the children have a fresh book for the week ahead. 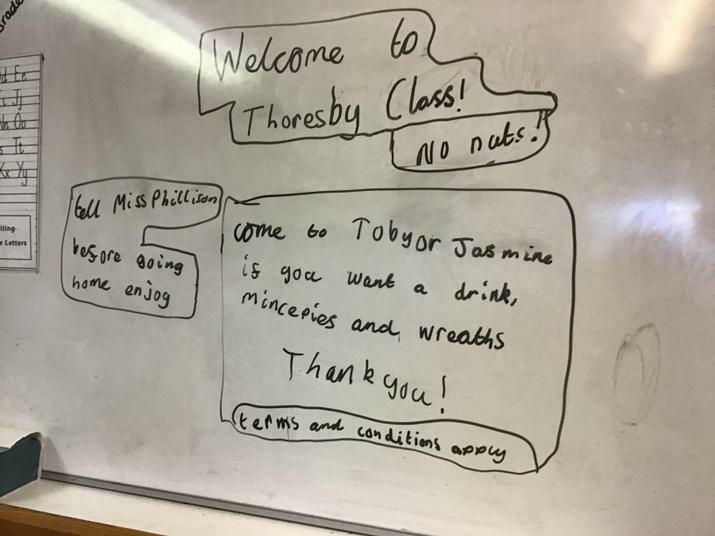 Thanks for a great week, Thoresby Class!